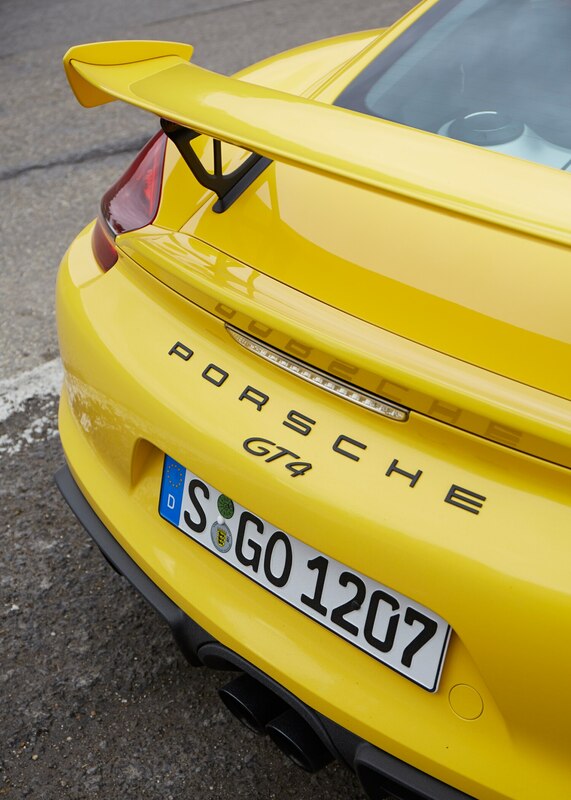 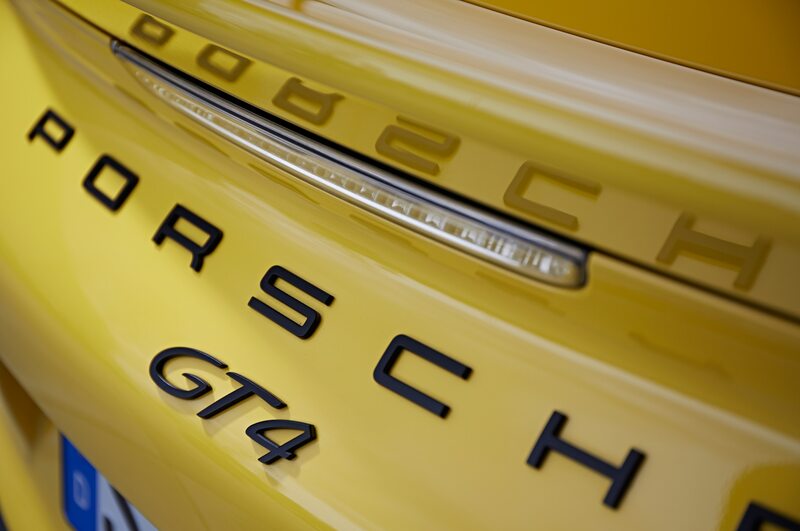 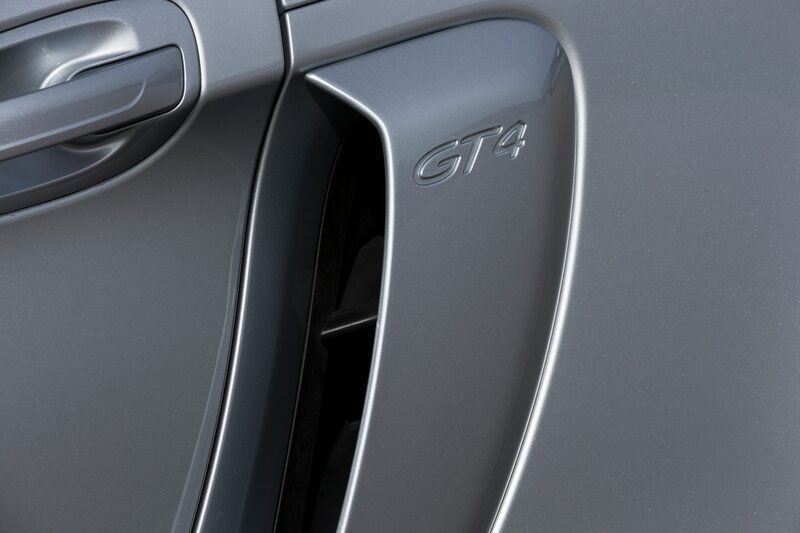 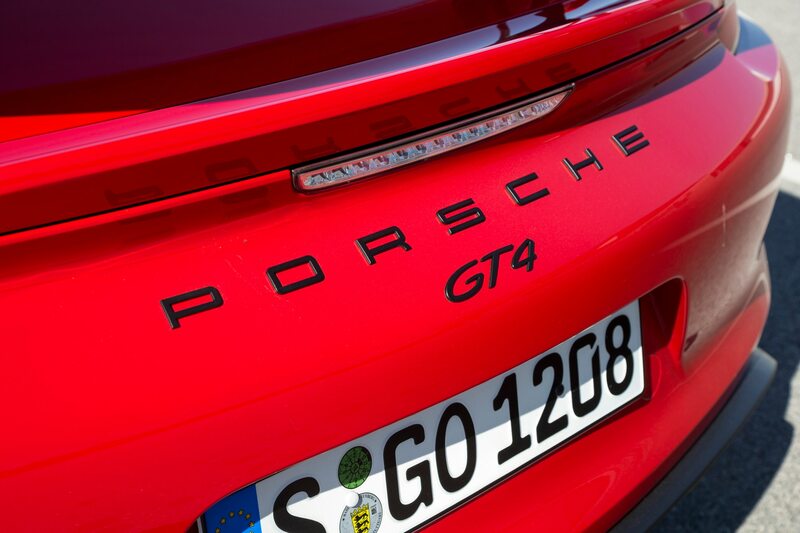 Zuffenhausen, Germany — The hardest-core Porsches traditionally wear the GT badge. 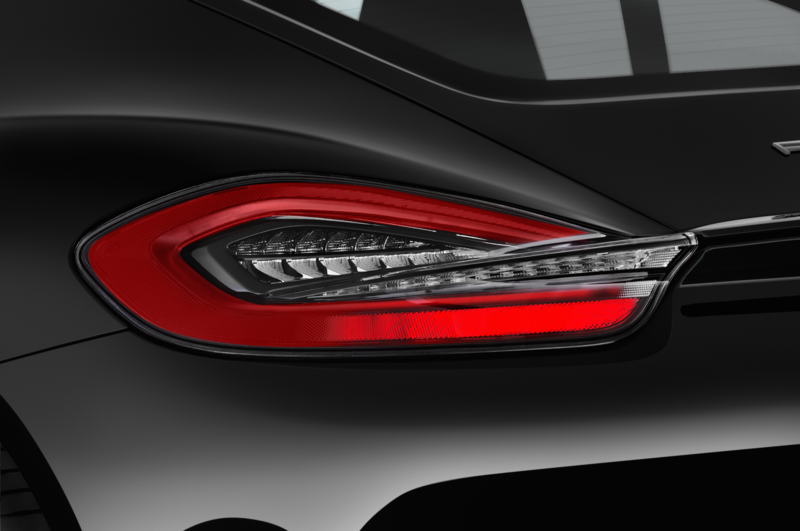 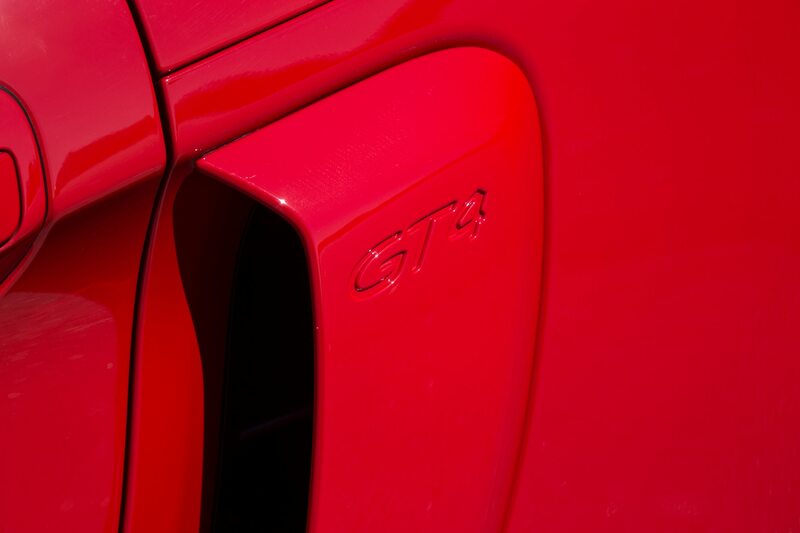 Maybe not the GTS moniker, which is usually 60 percent looks and 40 percent content, at best. 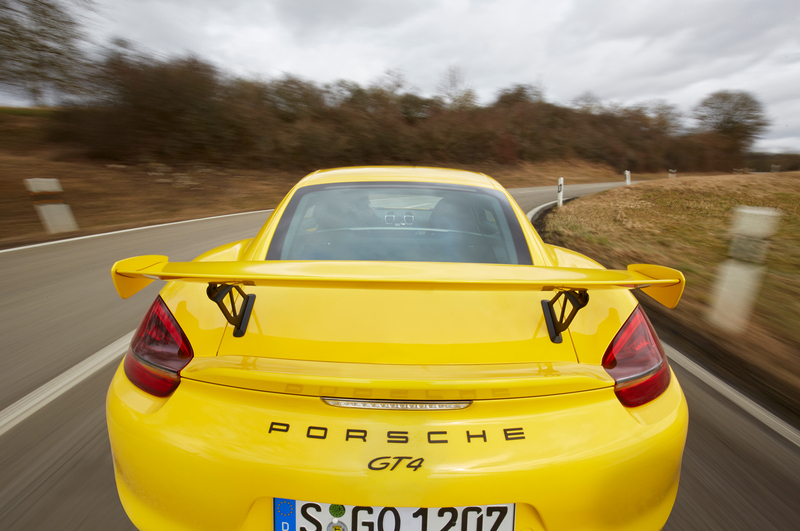 But put together GT and a number, and you almost assuredly have a hair-raising sports car. 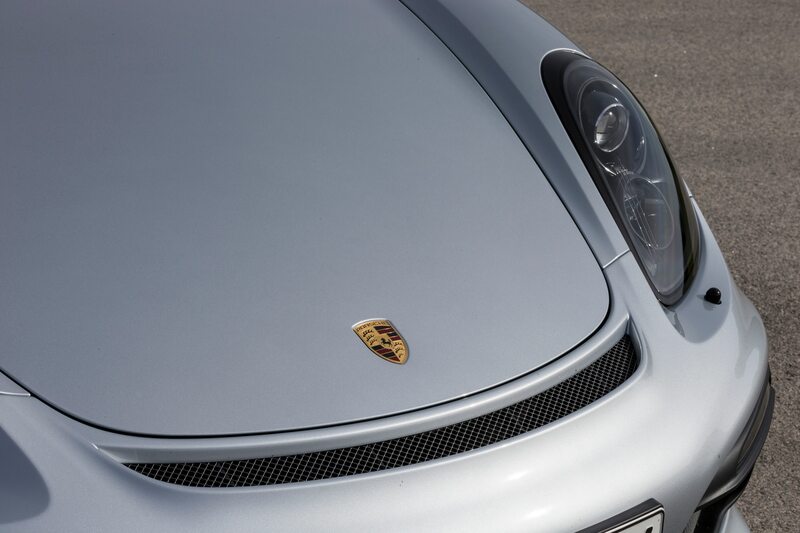 Like the GT1, the most fearsome 911 ever conceived. 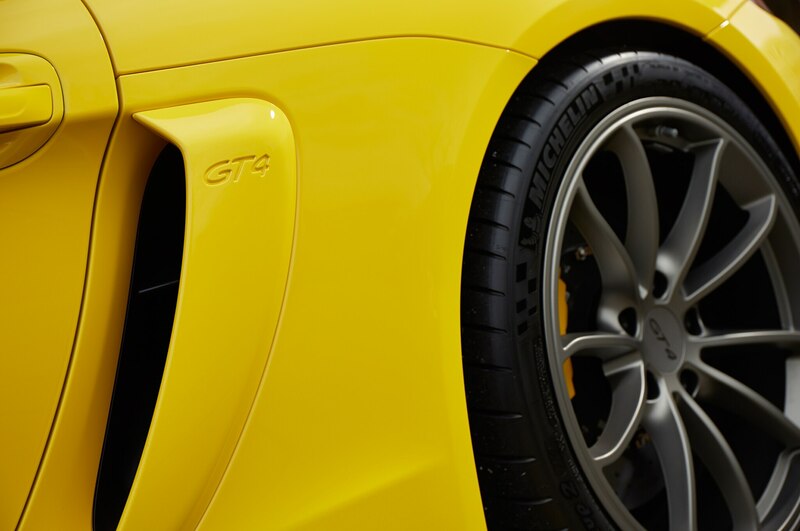 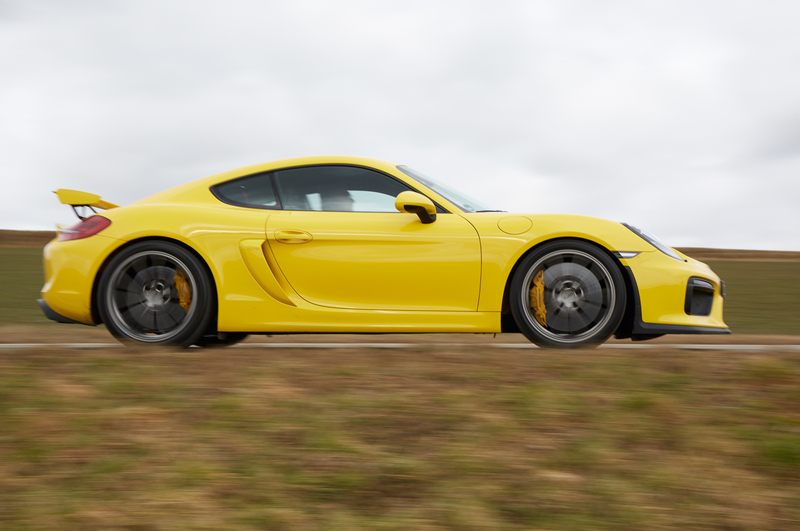 Or the GT2, the most potent rear-wheel-drive iteration of the breed. 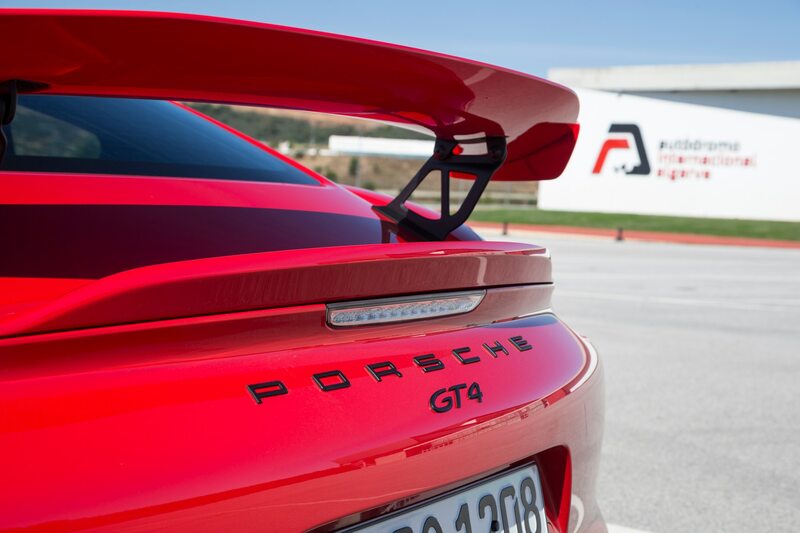 Then of course, there’s the GT3 and GT3 RS, which are, in essence, hot and super-hot street-legal track cars. 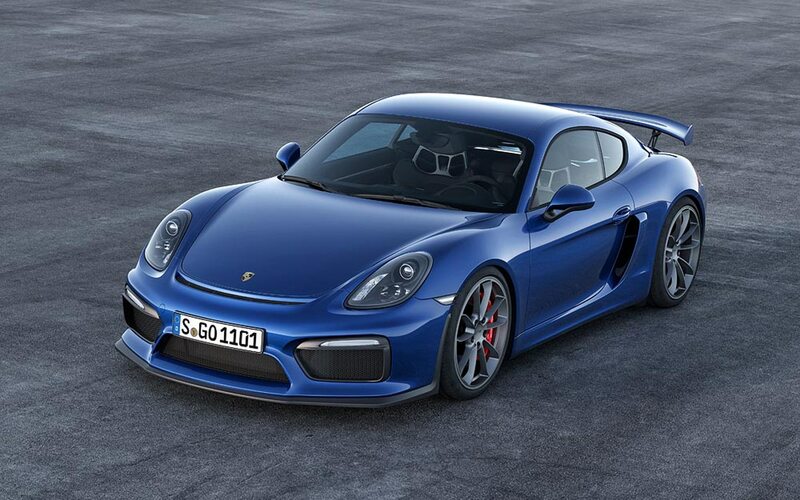 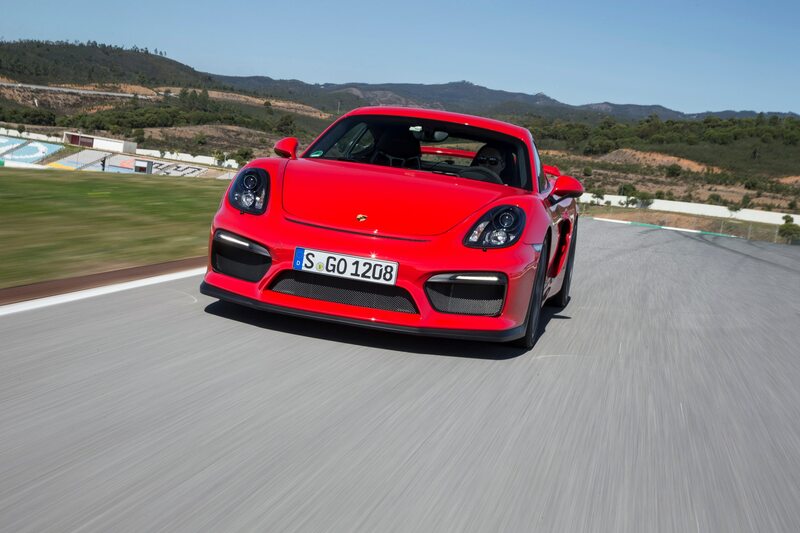 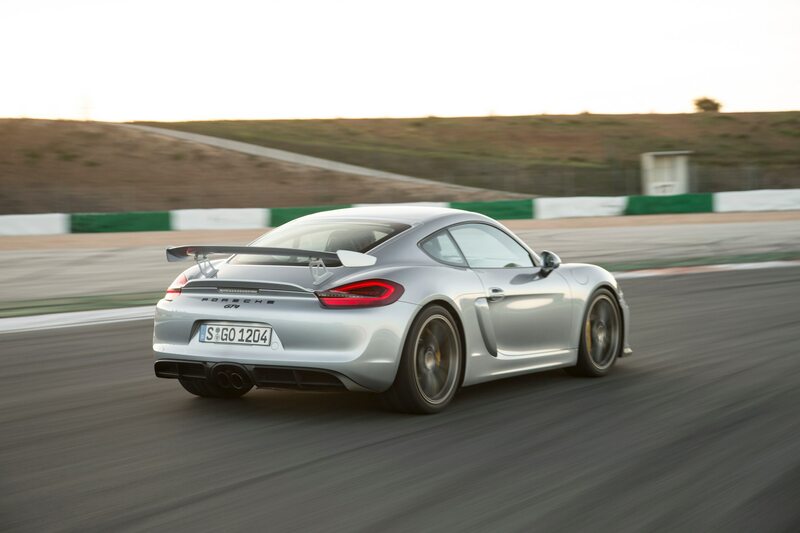 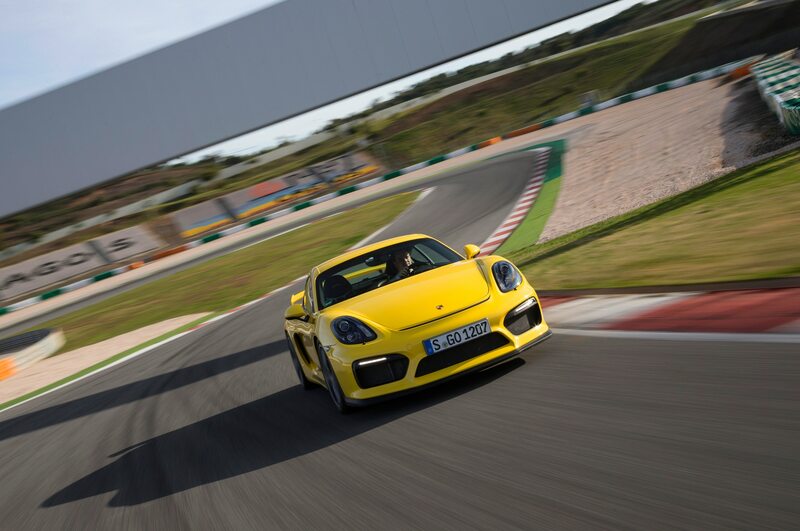 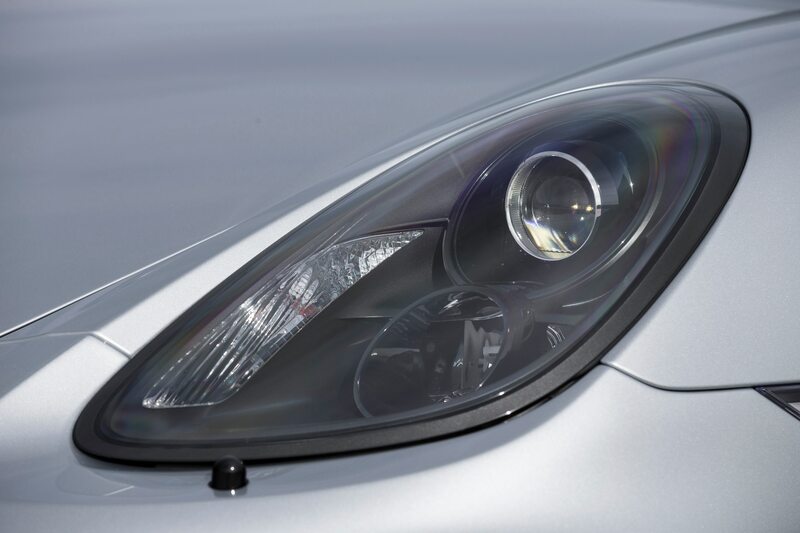 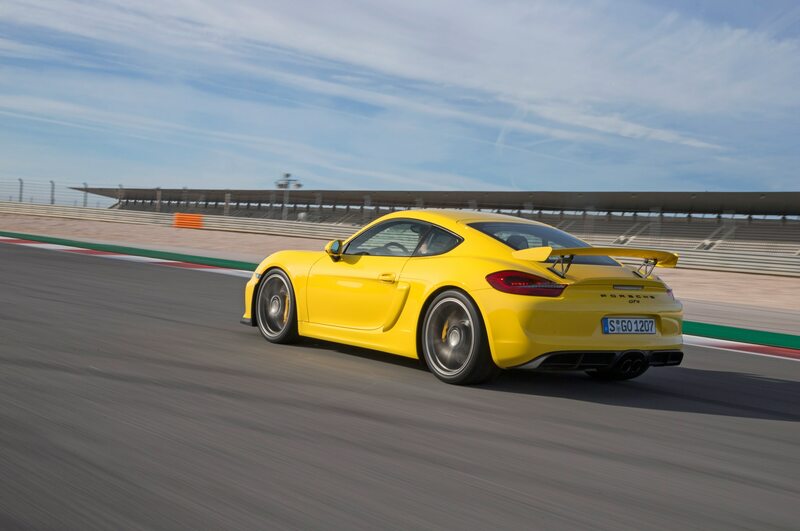 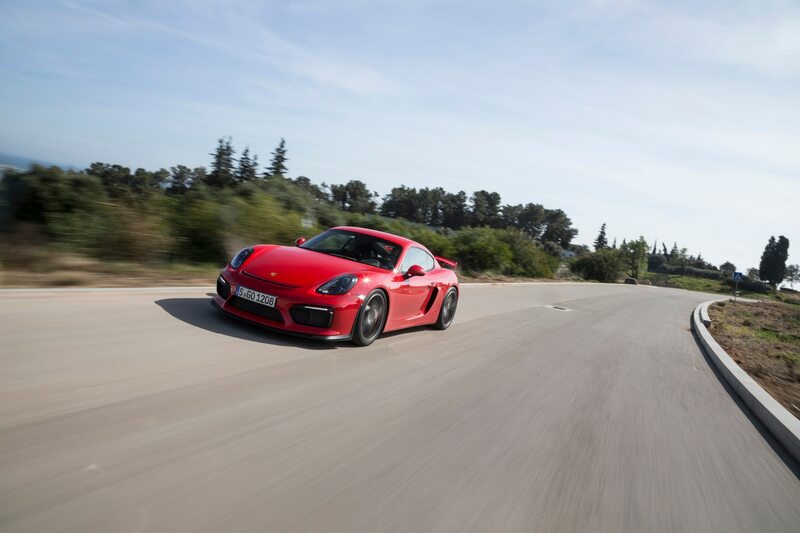 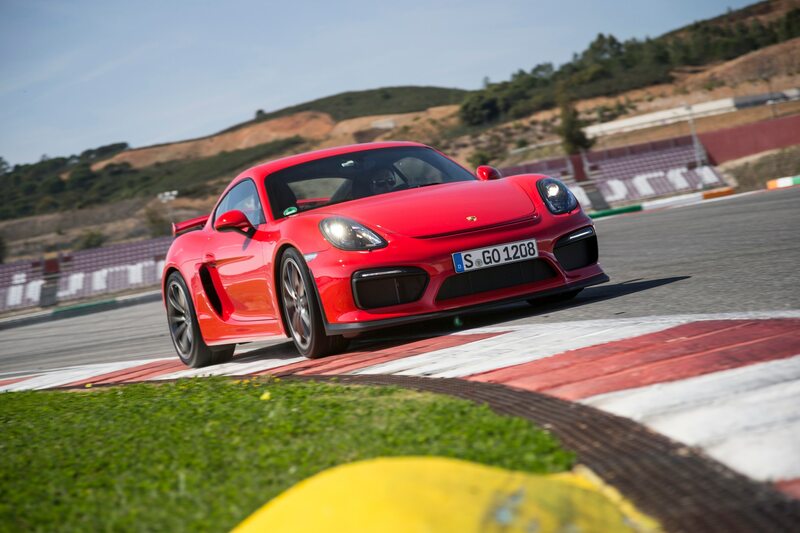 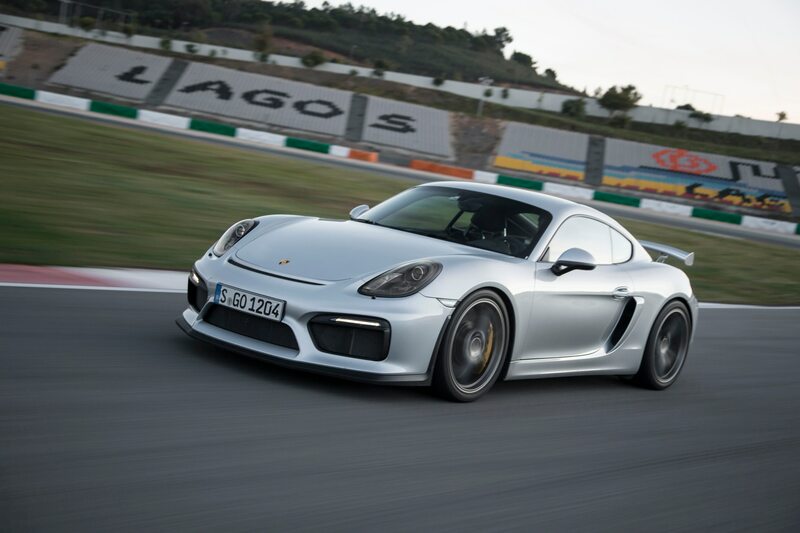 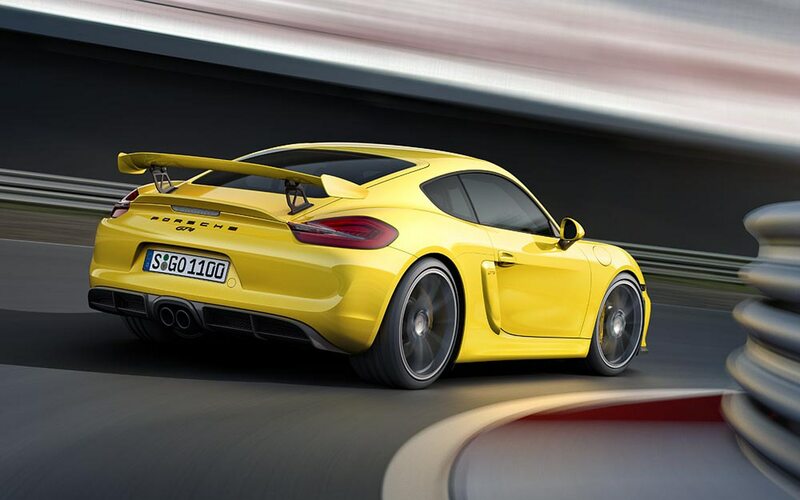 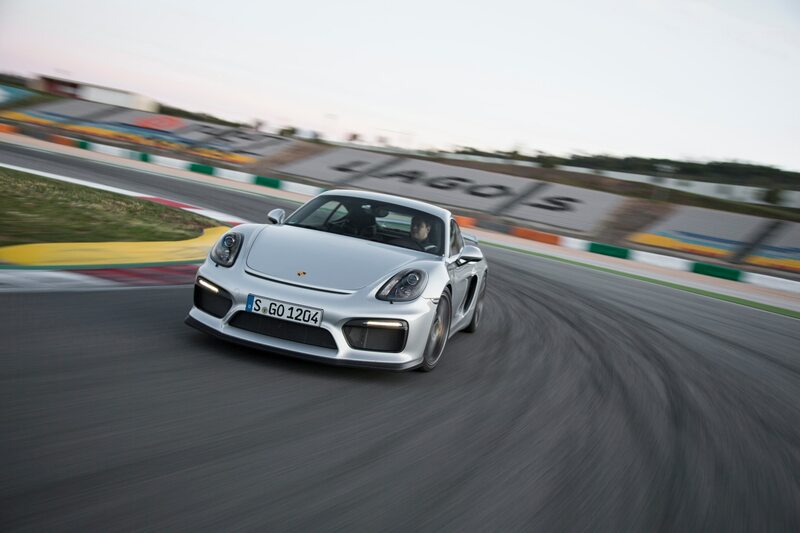 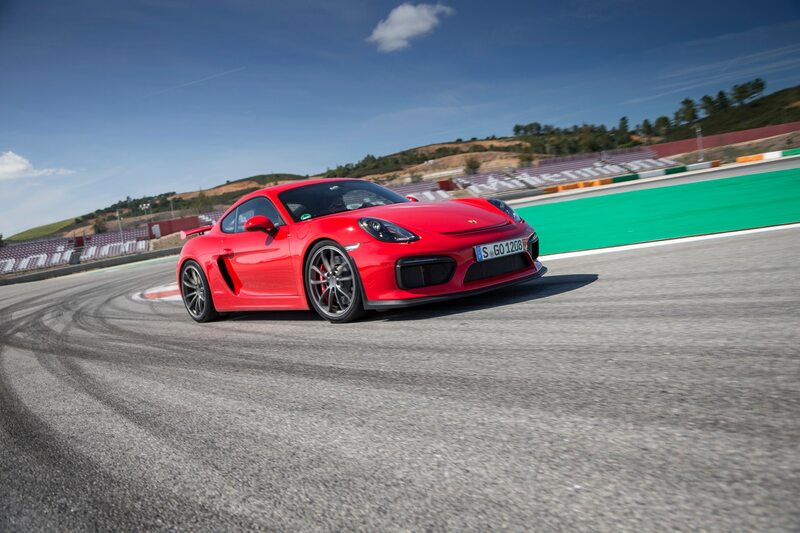 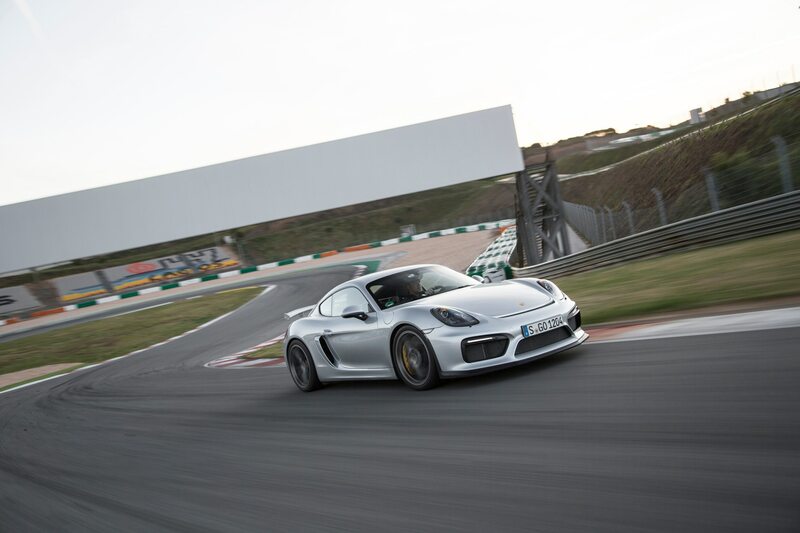 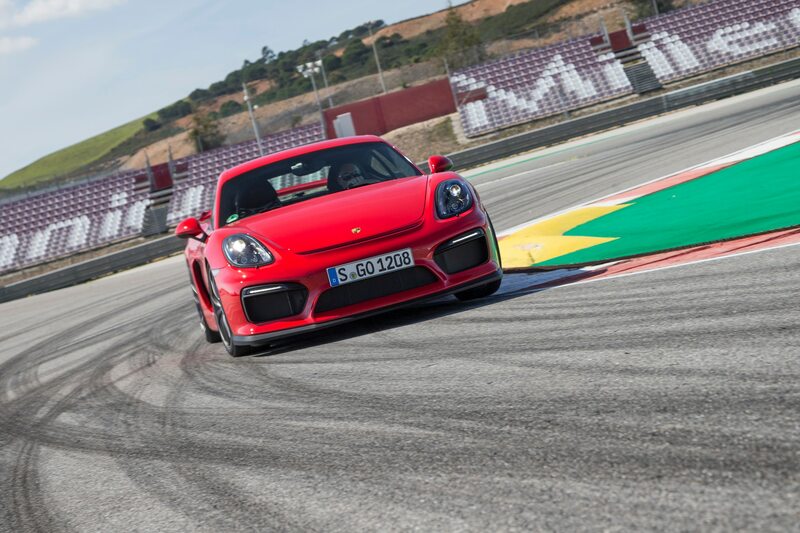 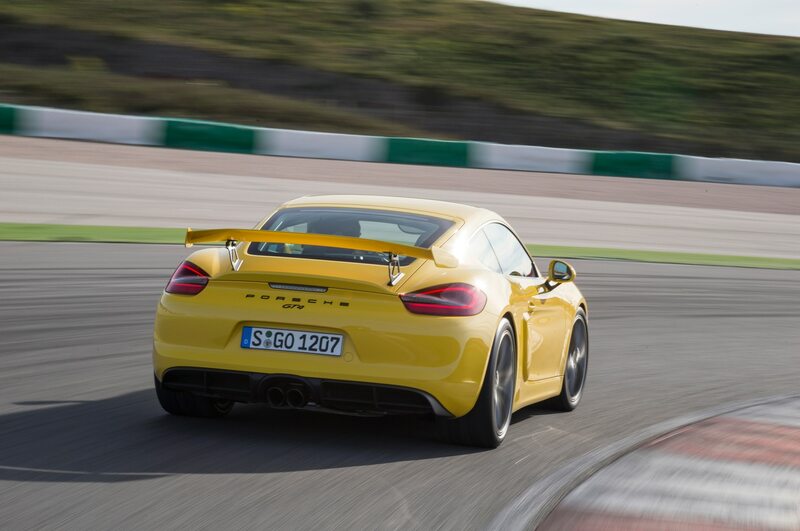 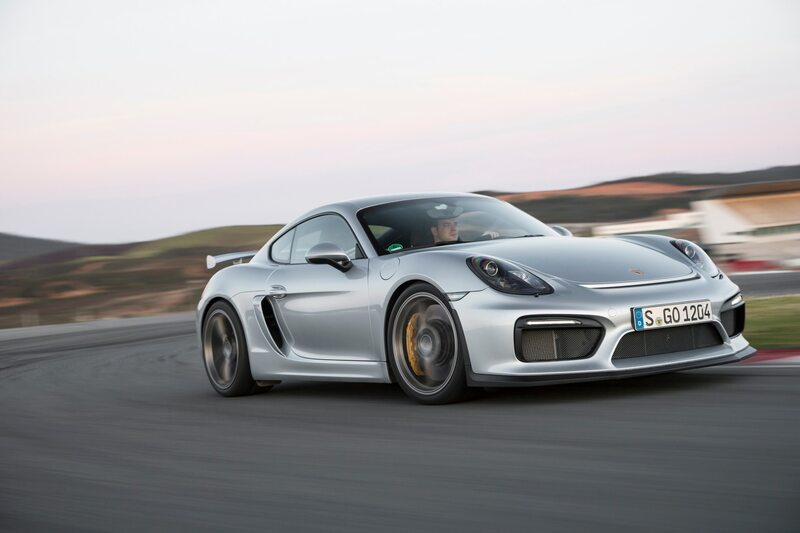 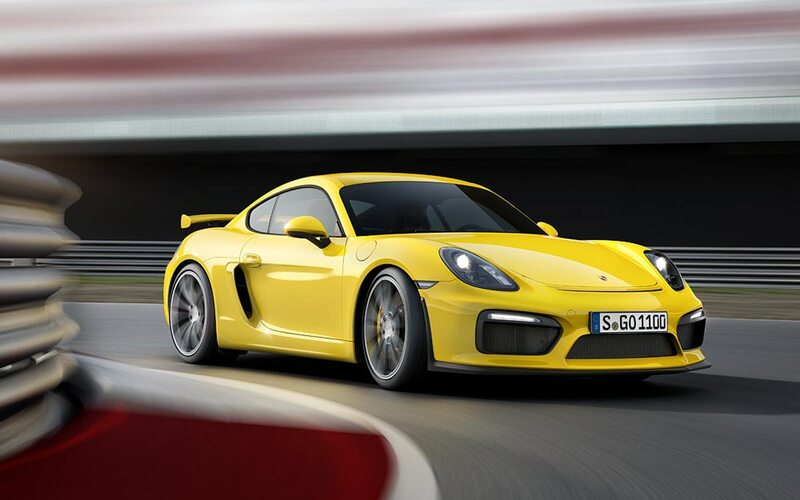 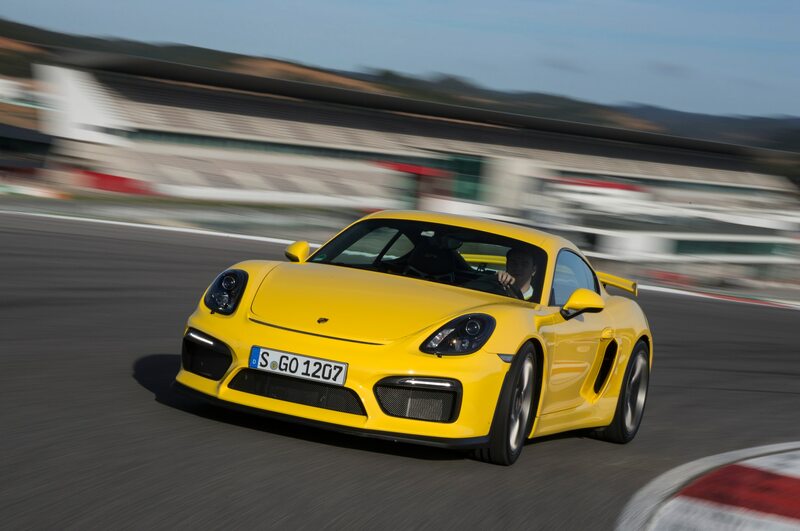 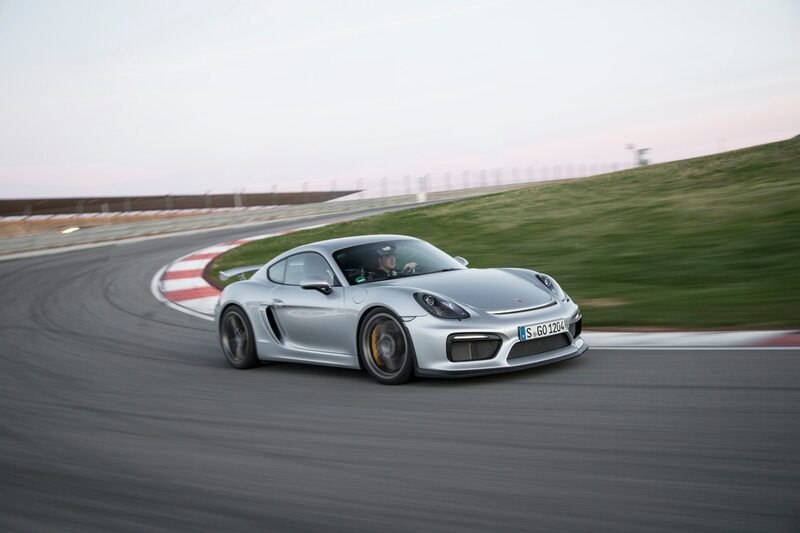 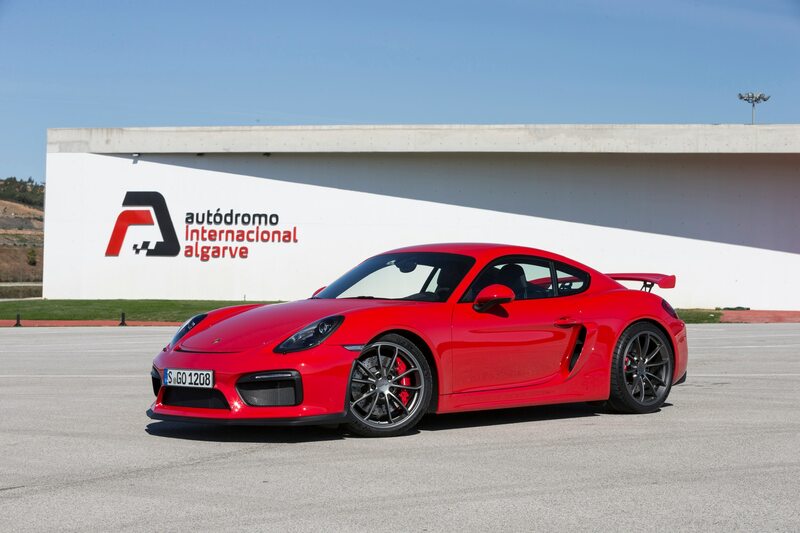 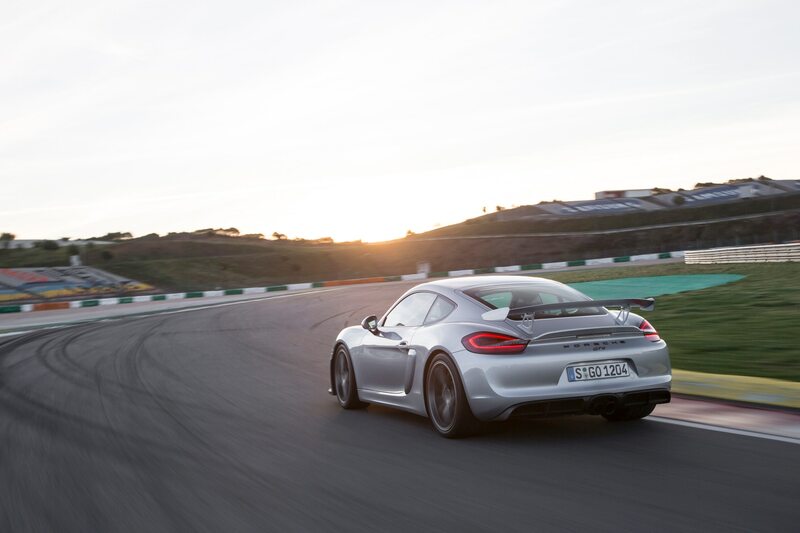 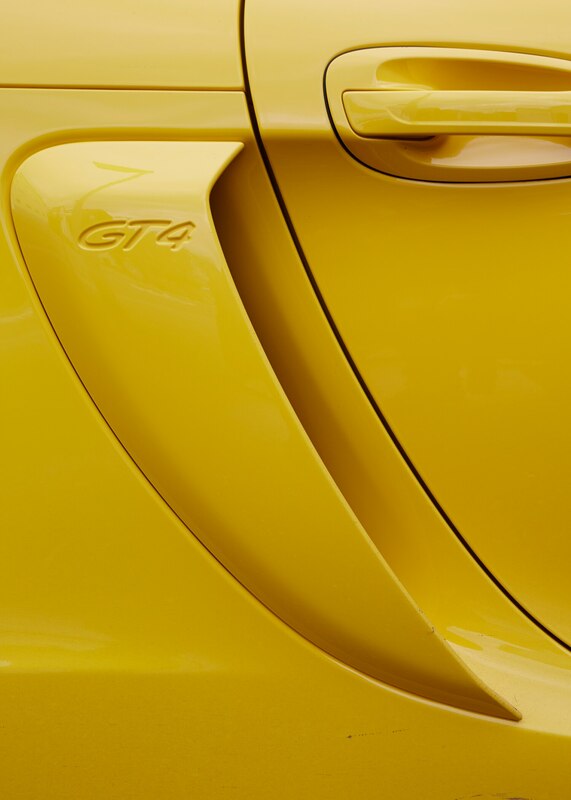 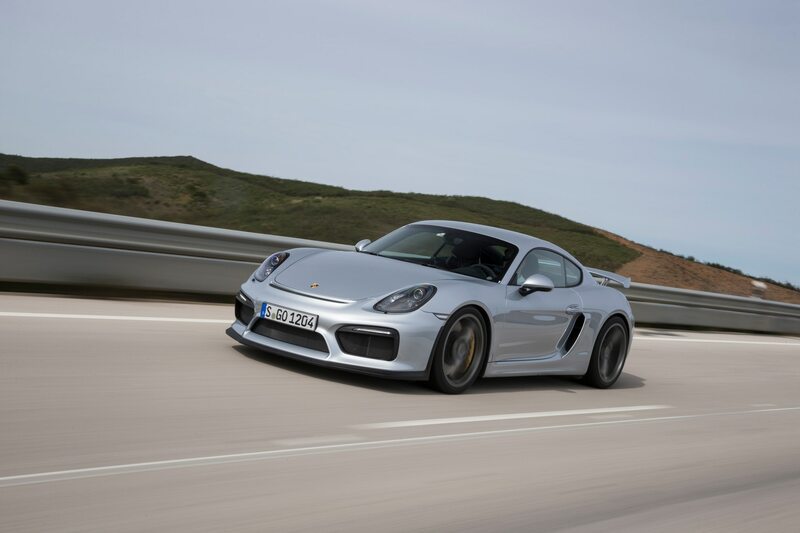 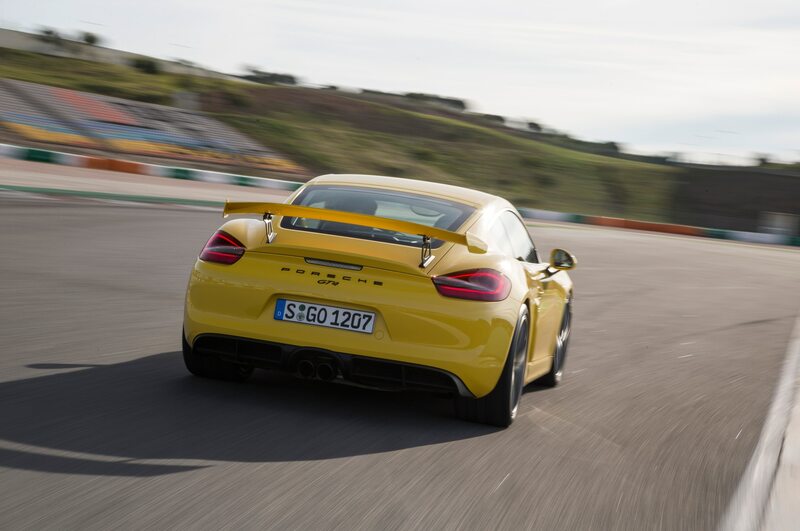 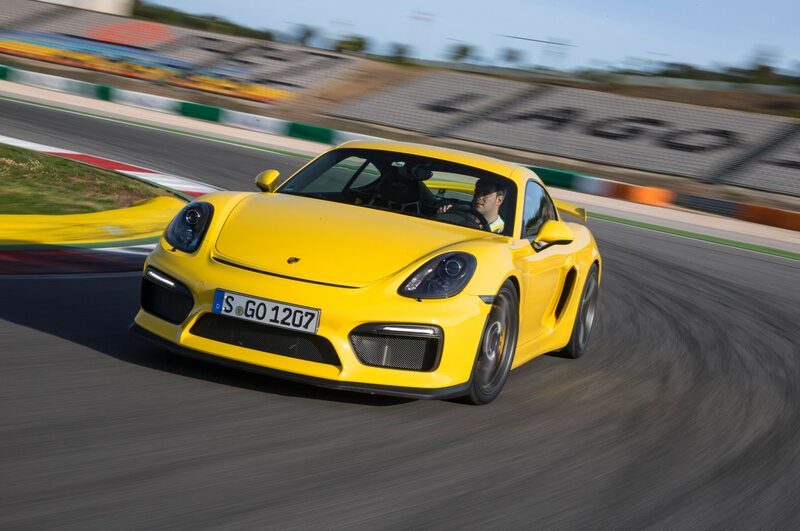 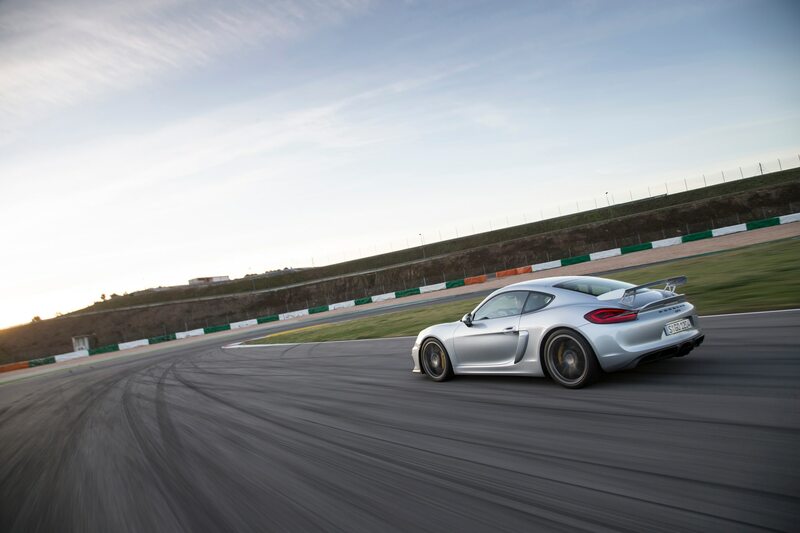 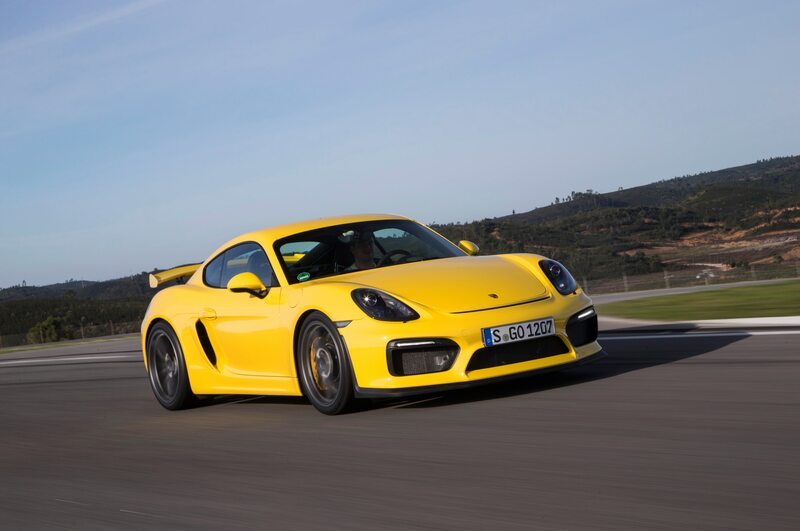 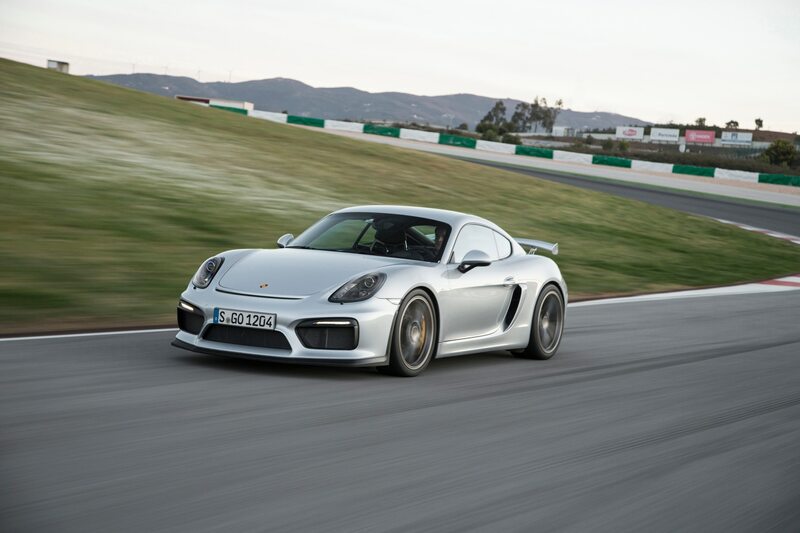 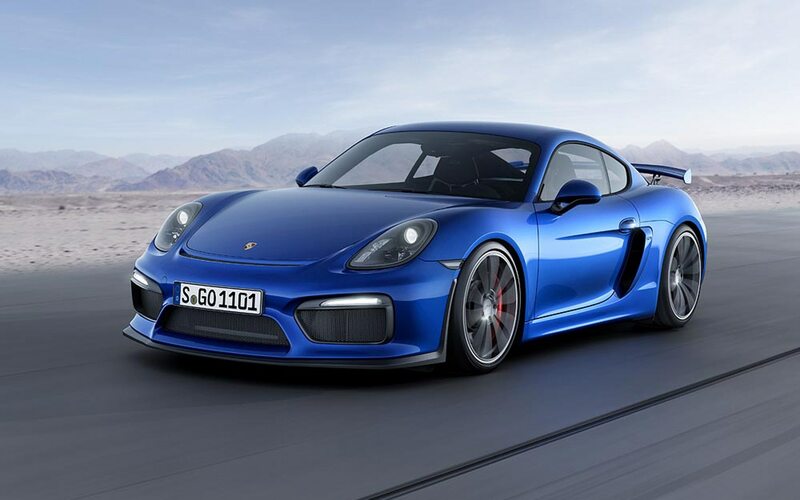 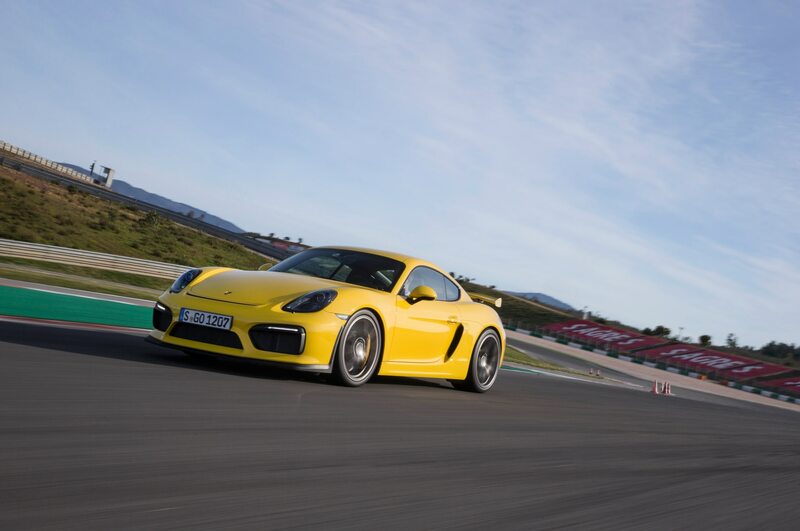 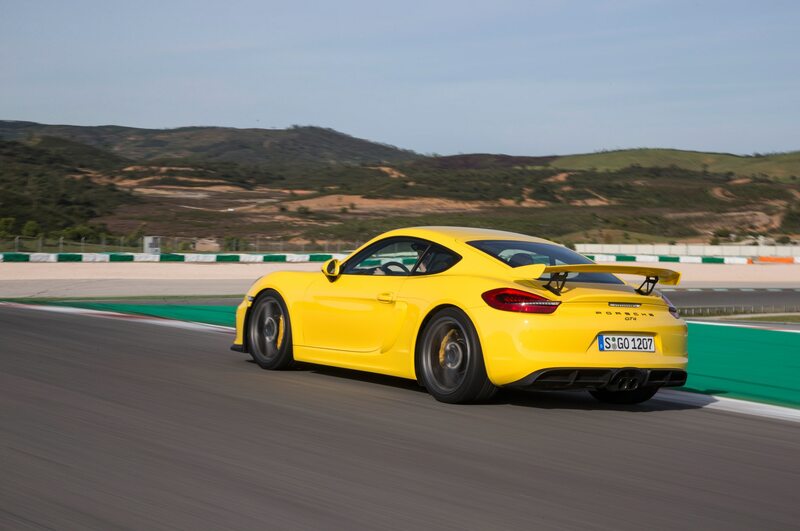 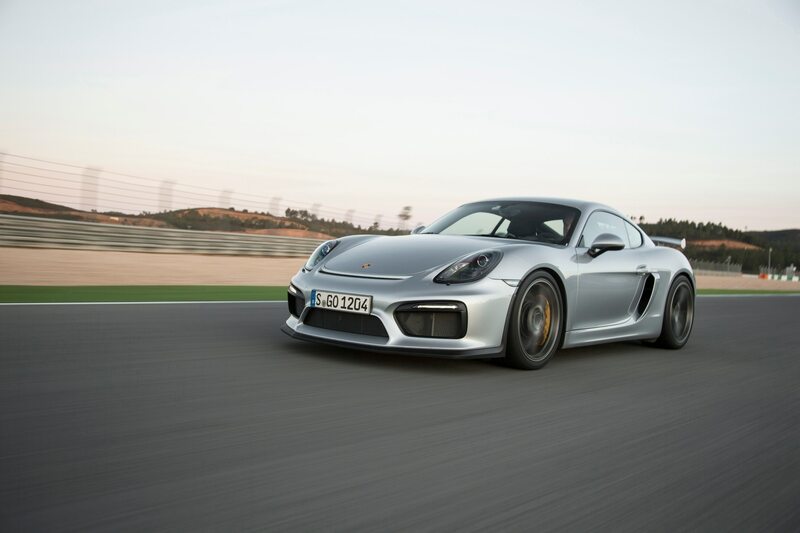 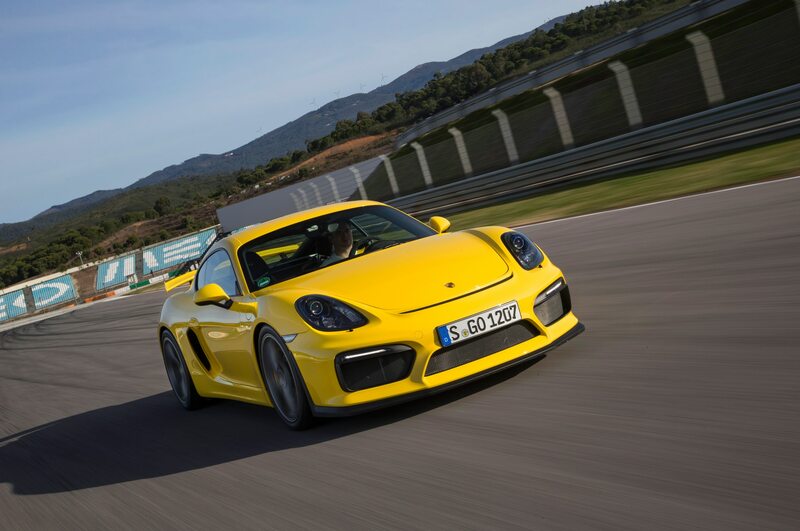 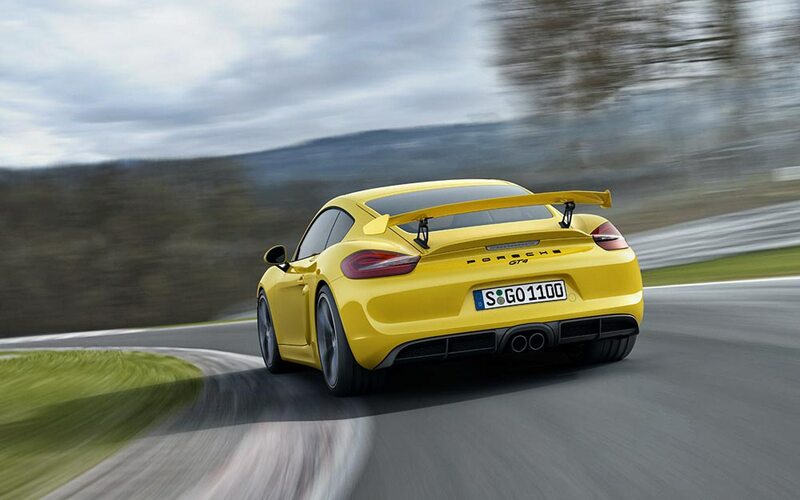 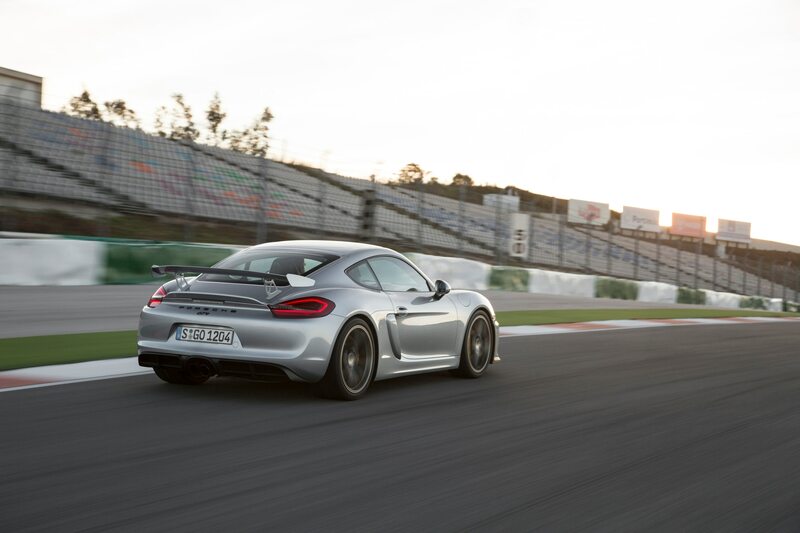 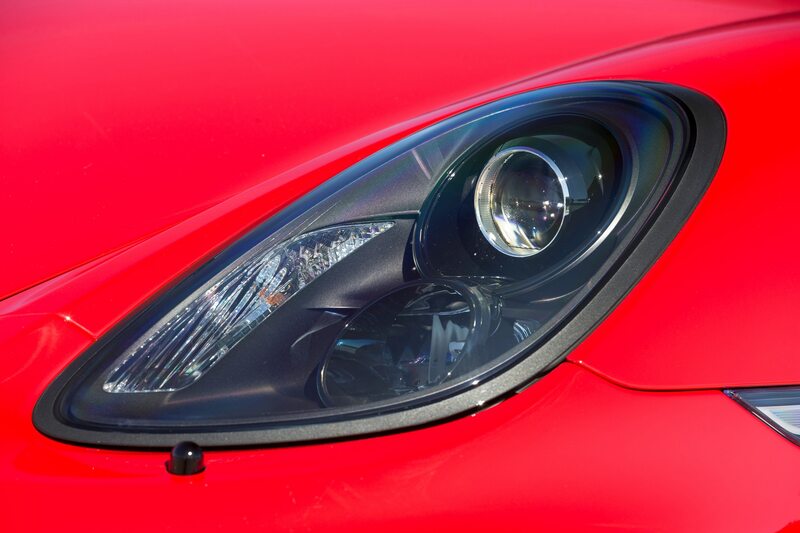 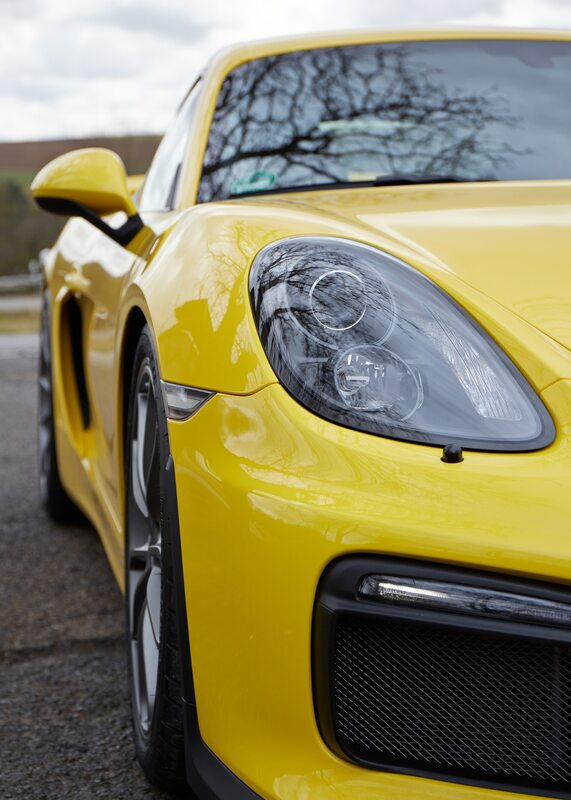 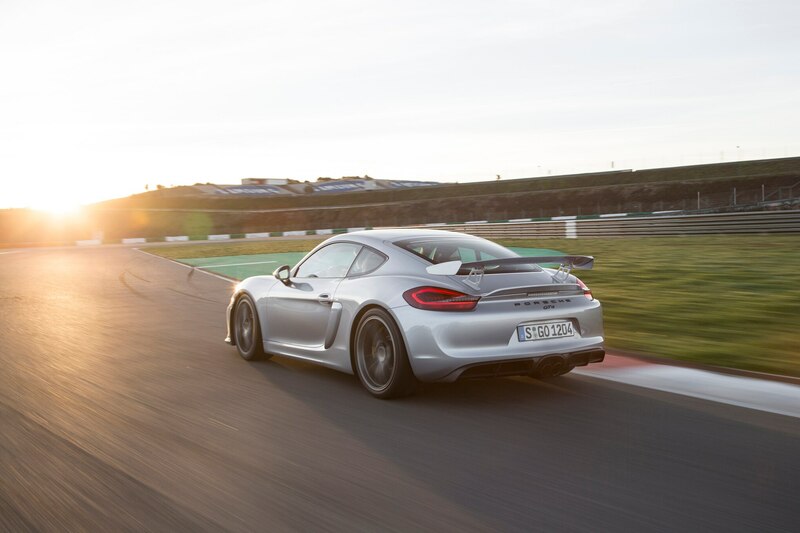 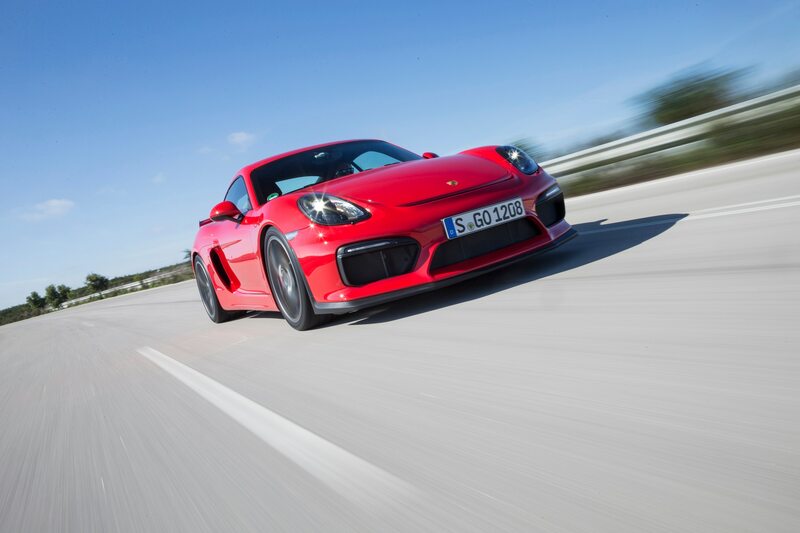 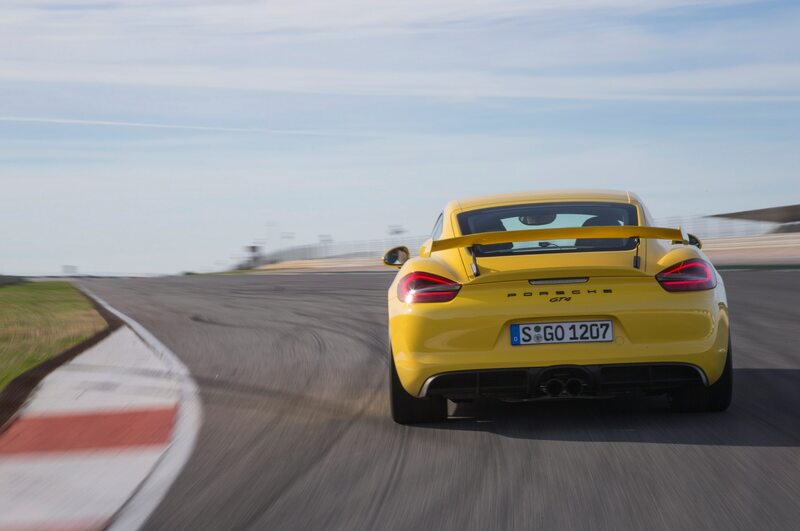 The latest addition to the wild and wonderful GT family is the 2016 Porsche Cayman GT4. 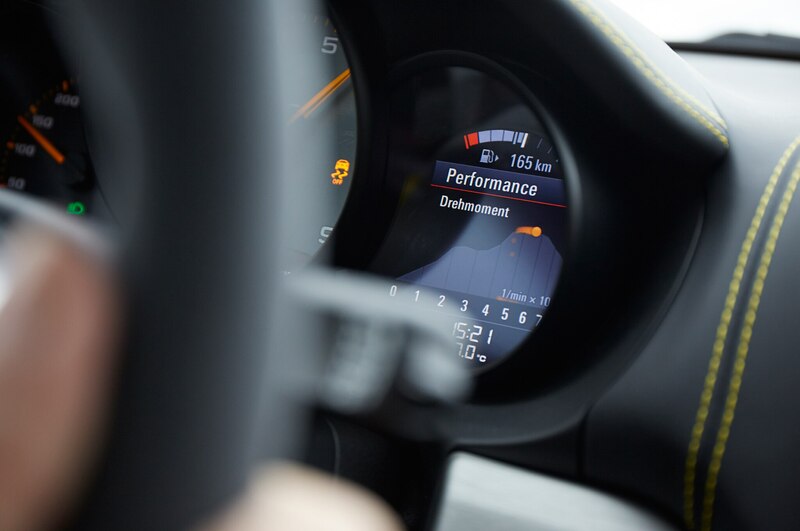 It’s a performer. 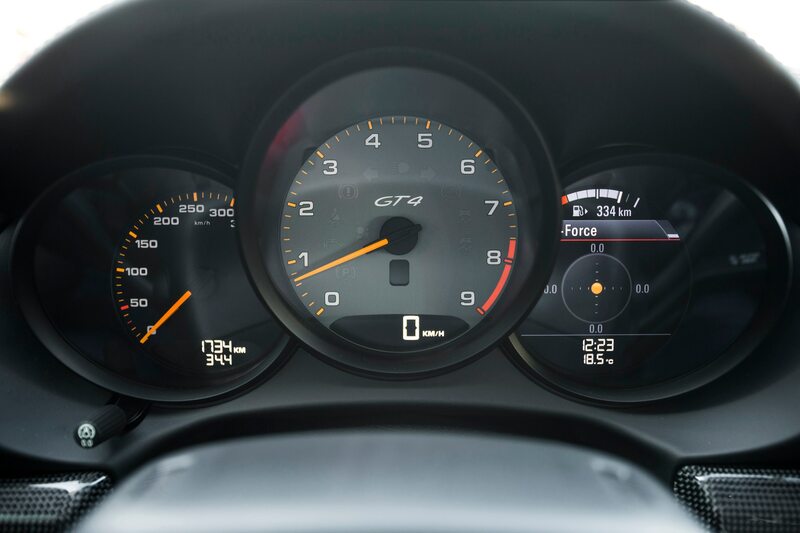 Numerous GT-specific add-ons make it crystal clear at a glance that this coupe means business. 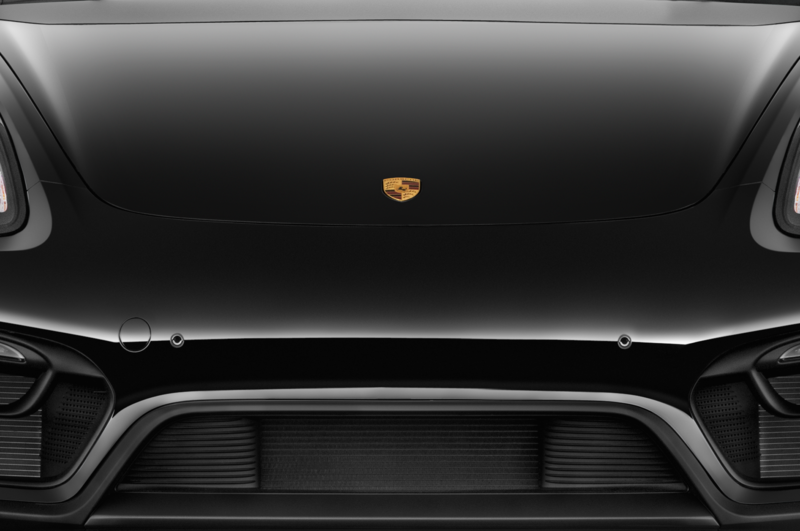 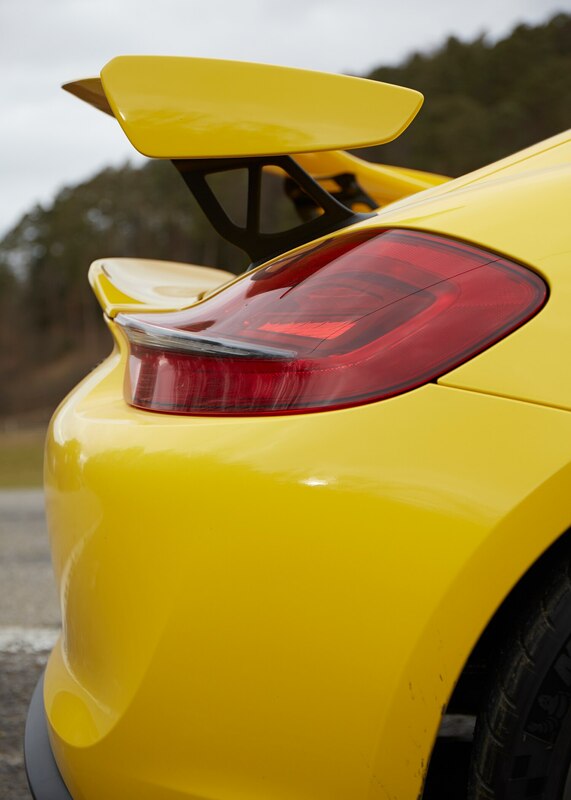 A tray-shaped front splitter flies low enough to decapitate small mammals, enlarged air intakes will catch almost as many flies as the windscreen, and the rear spoiler easily seats a dozen buzzards abreast. 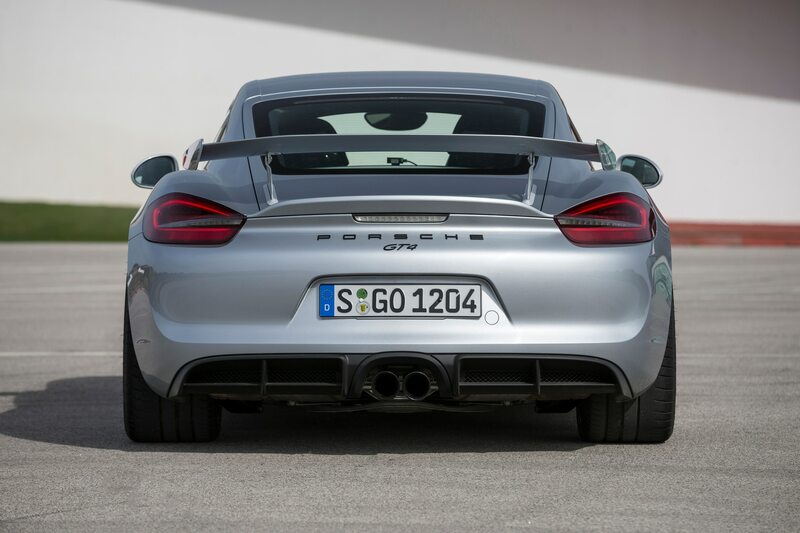 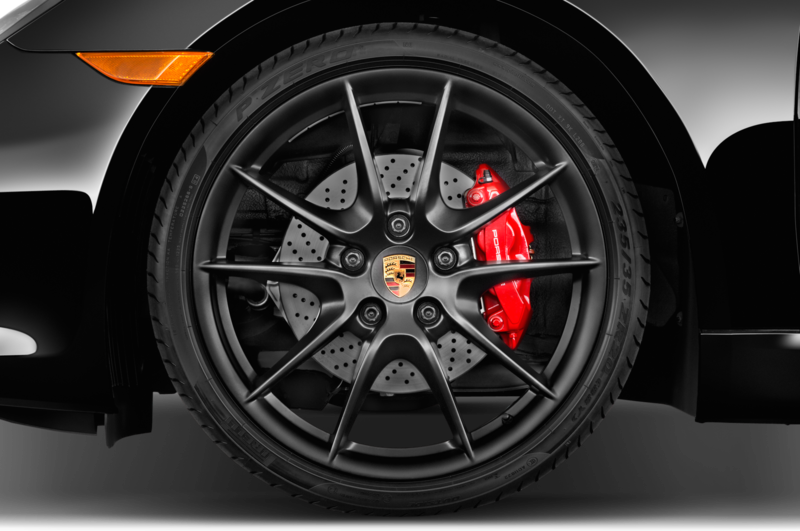 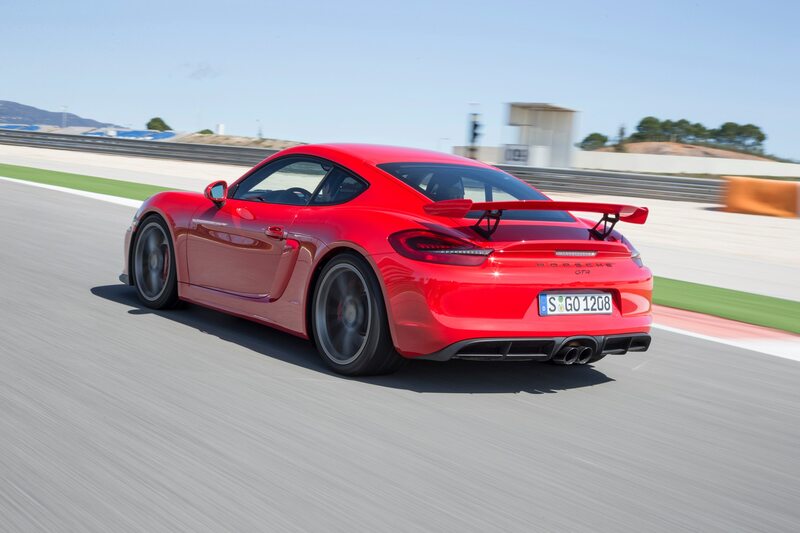 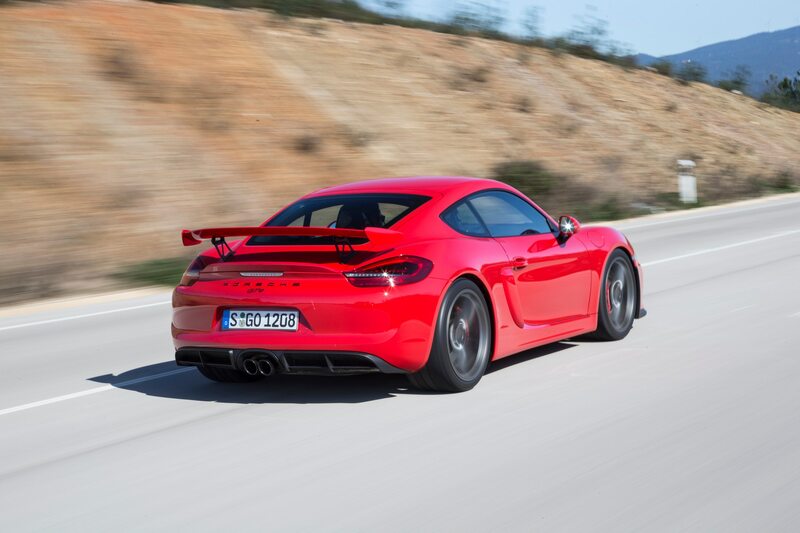 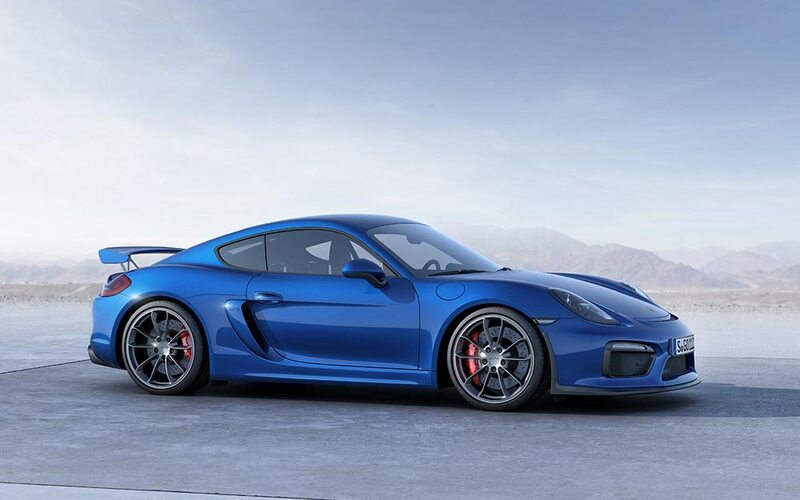 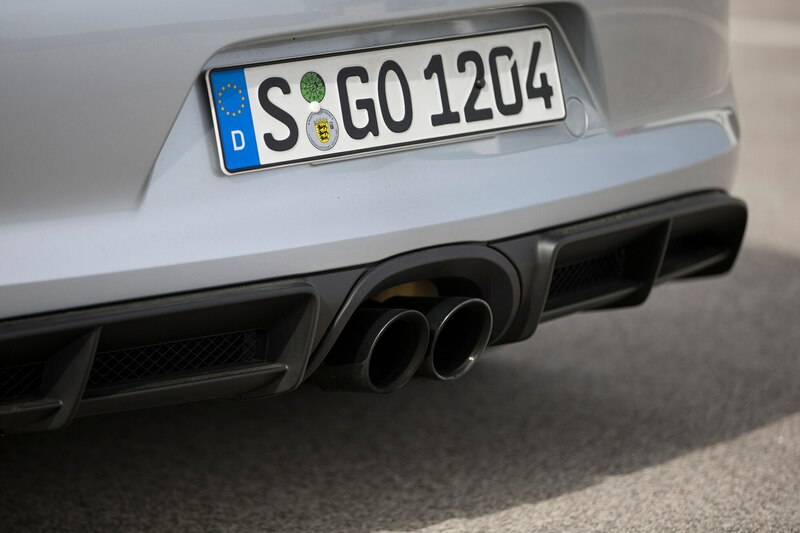 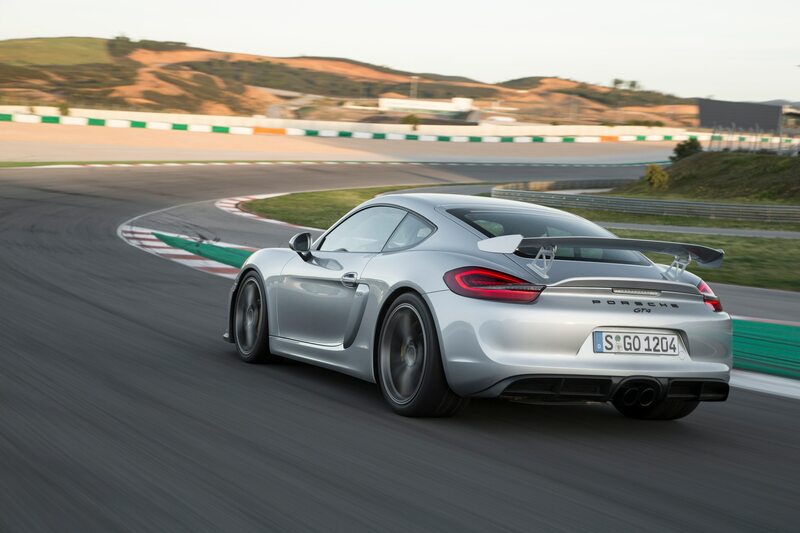 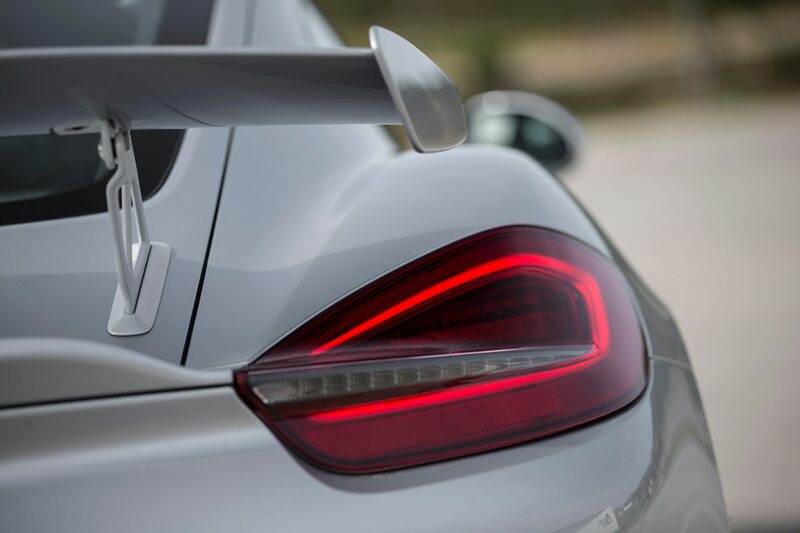 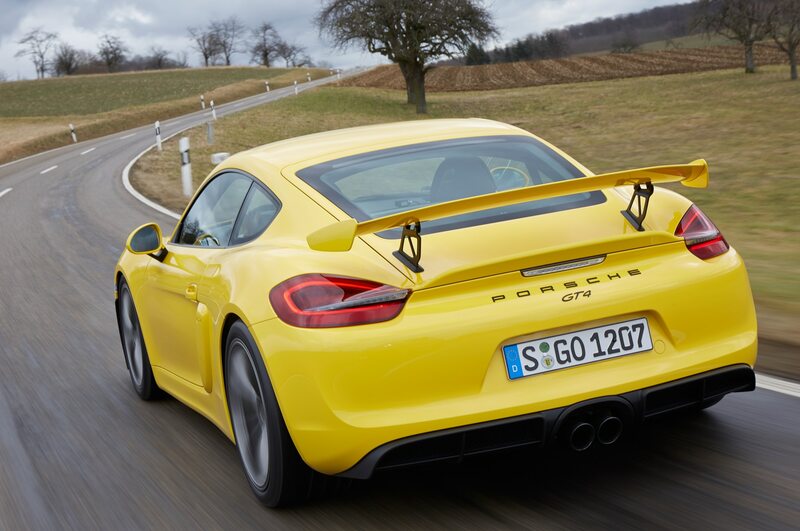 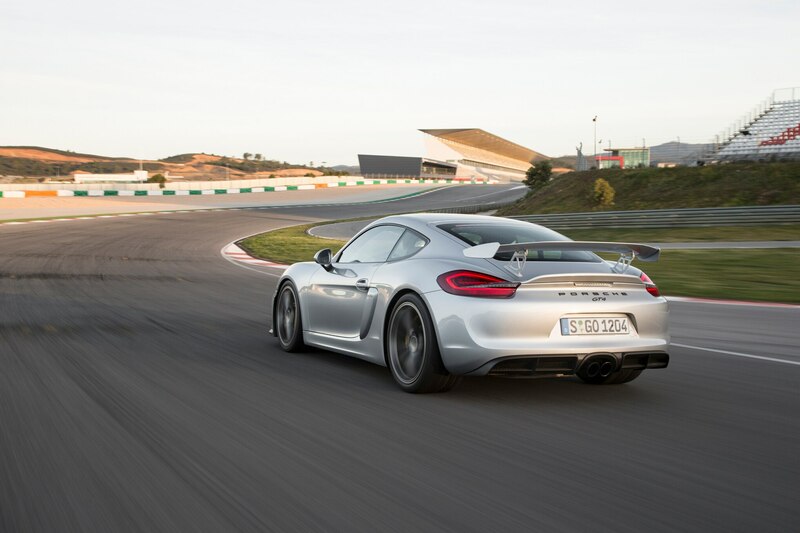 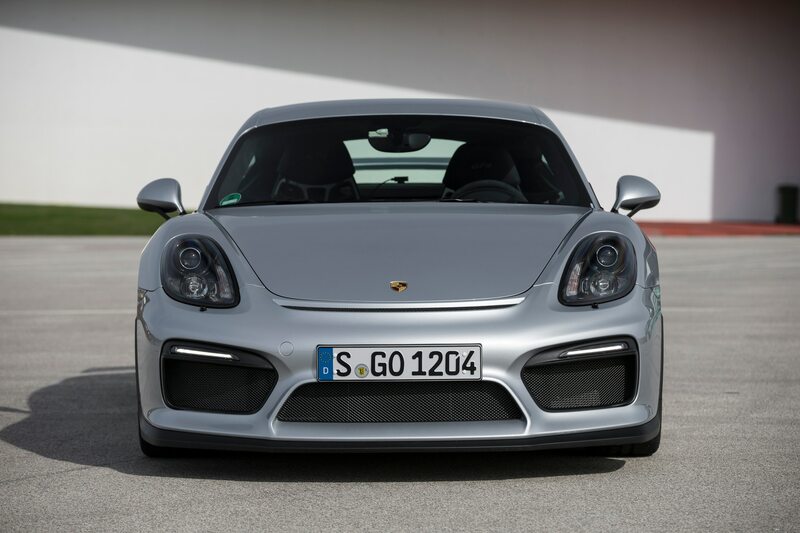 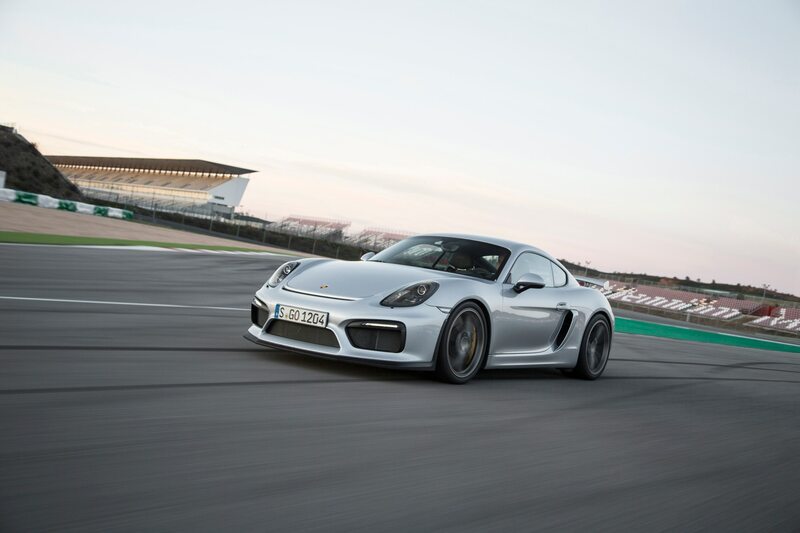 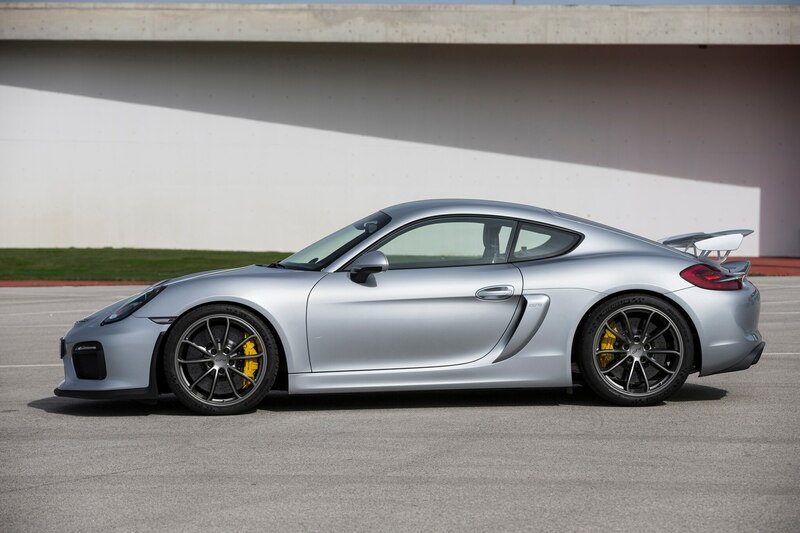 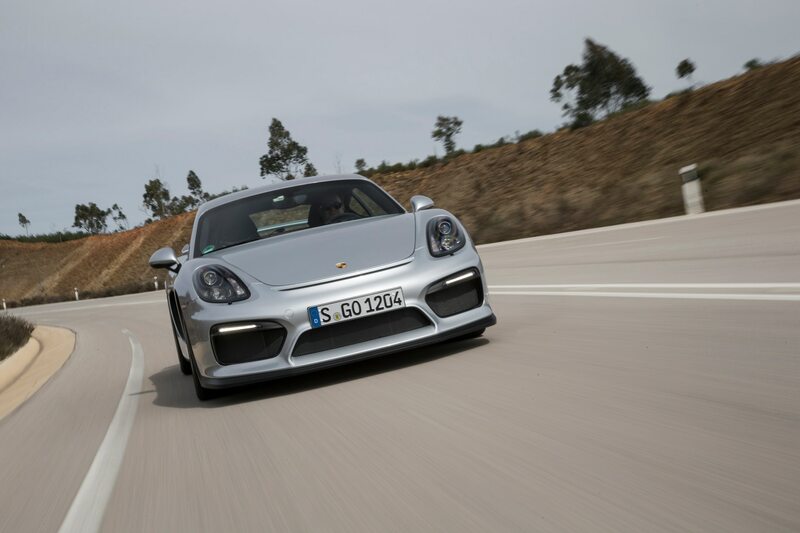 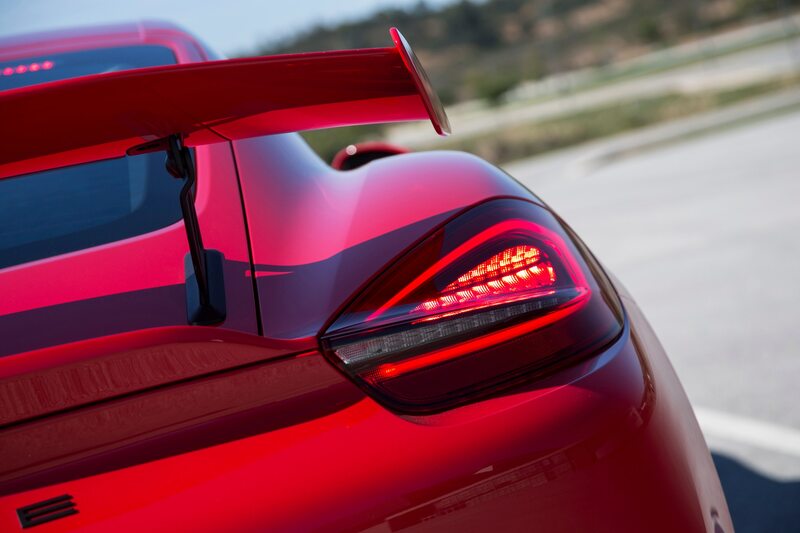 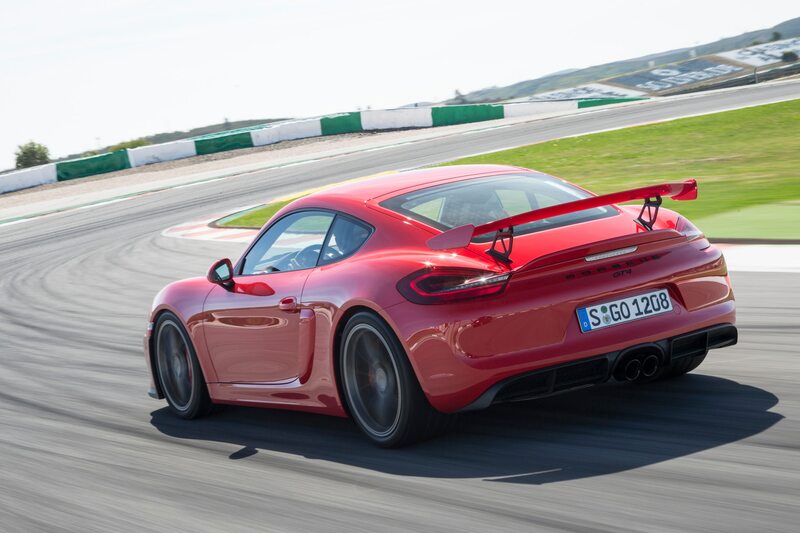 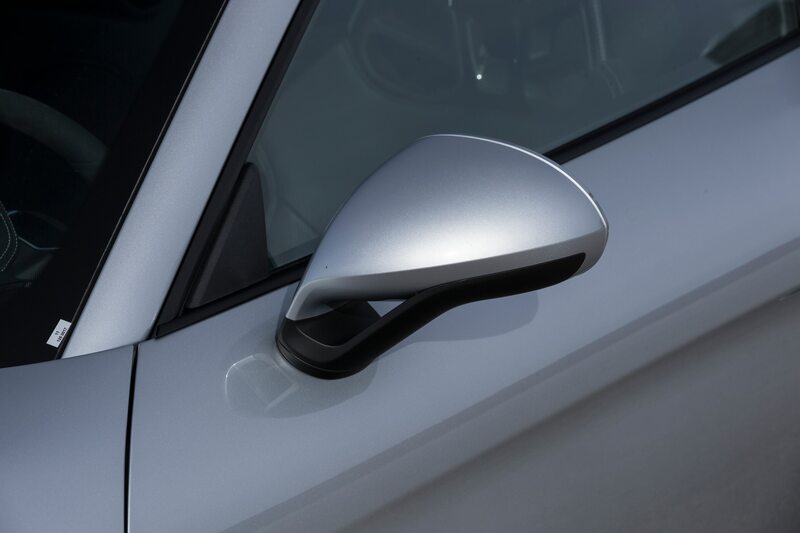 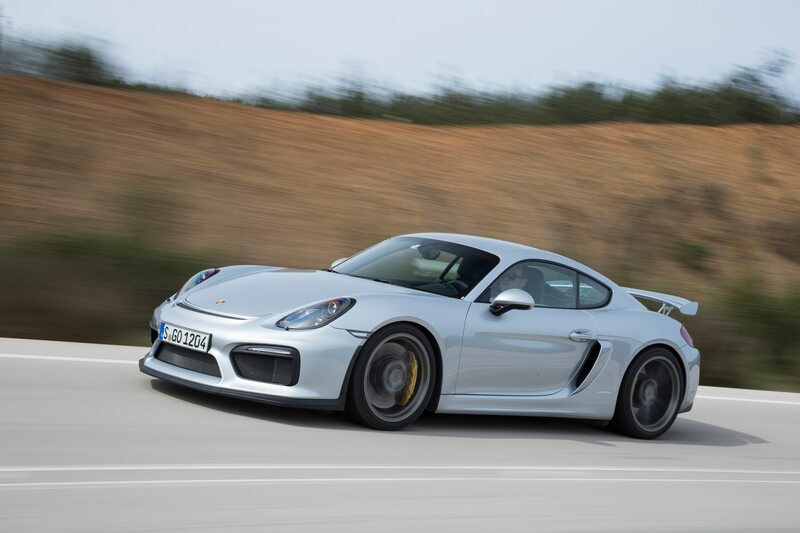 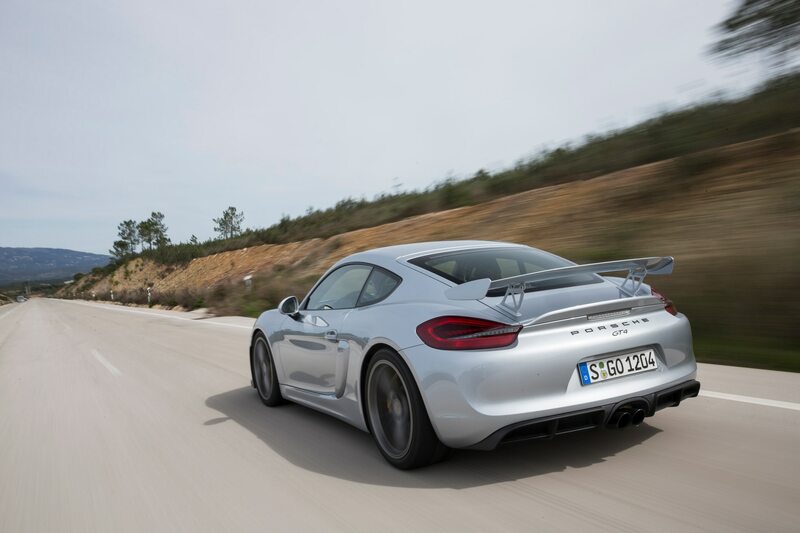 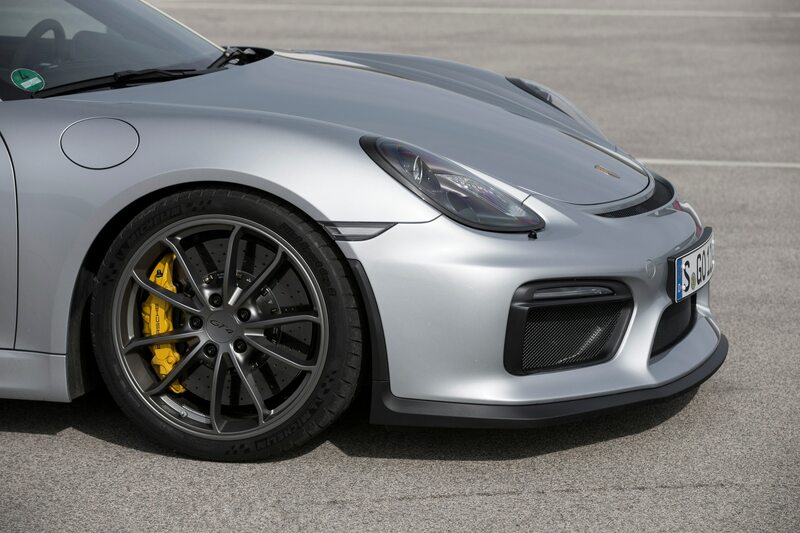 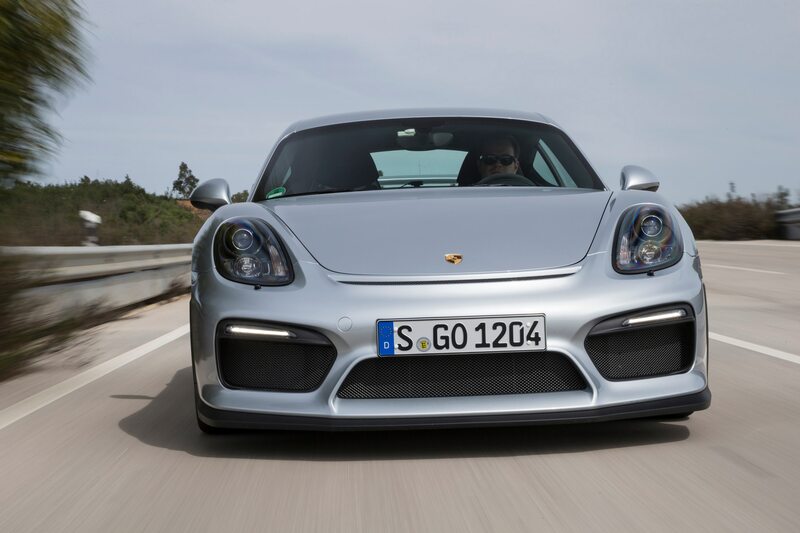 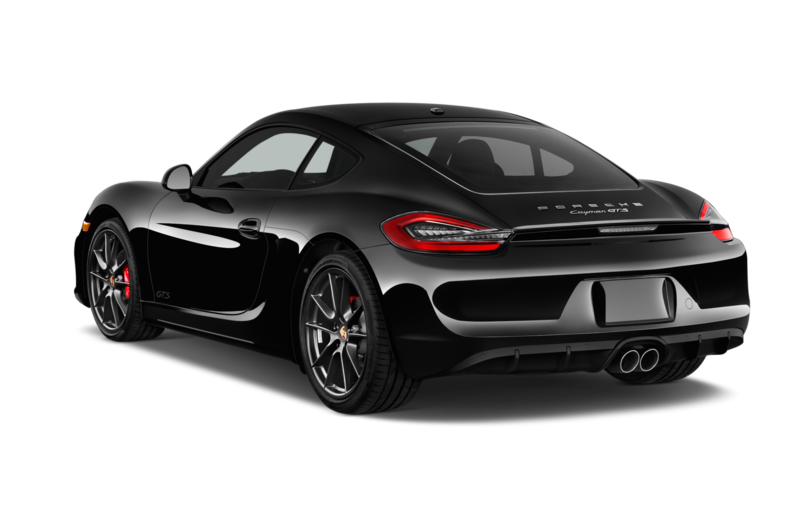 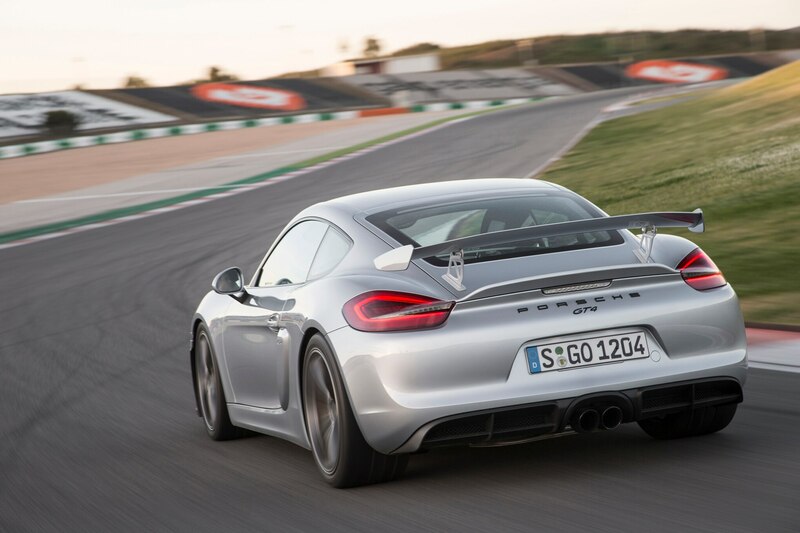 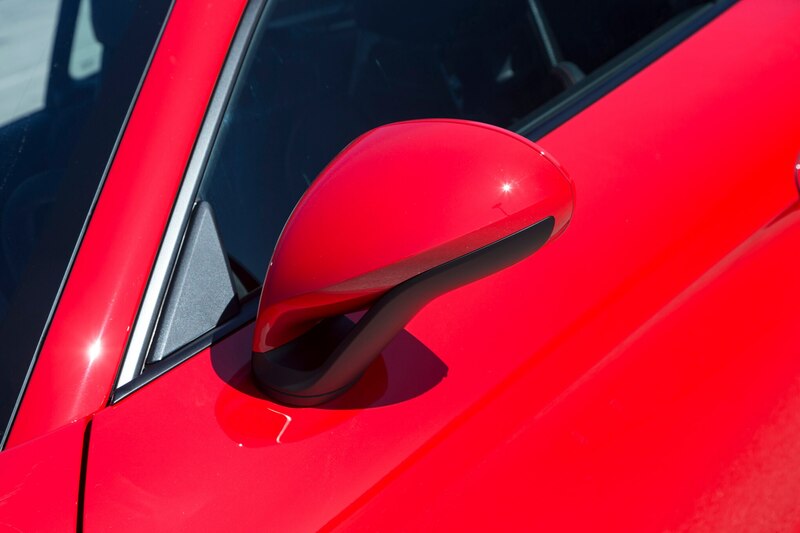 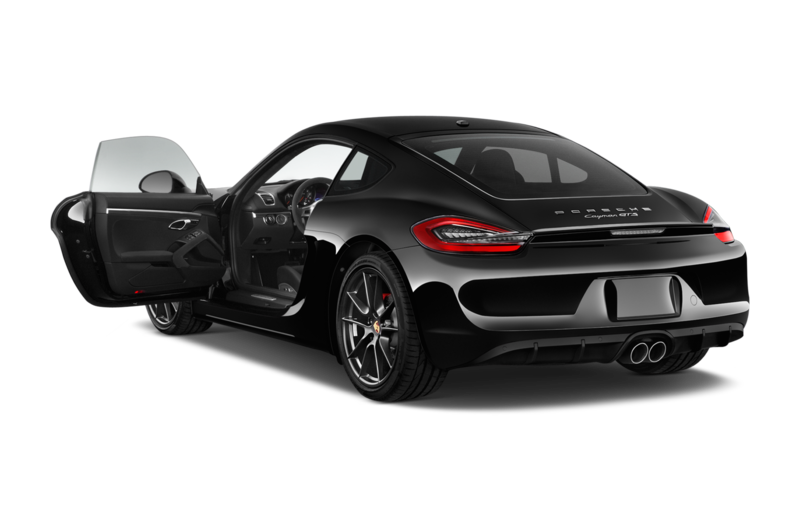 Other drag-cutting addenda are the more slippery door mirrors, flared lateral breathing scoops wearing embossed GT4 logos, and a rear diffuser that complements the two staggered air deflectors. 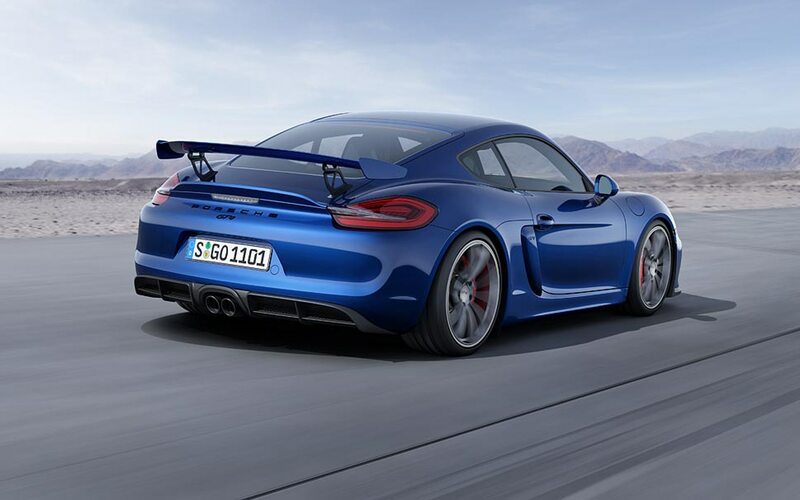 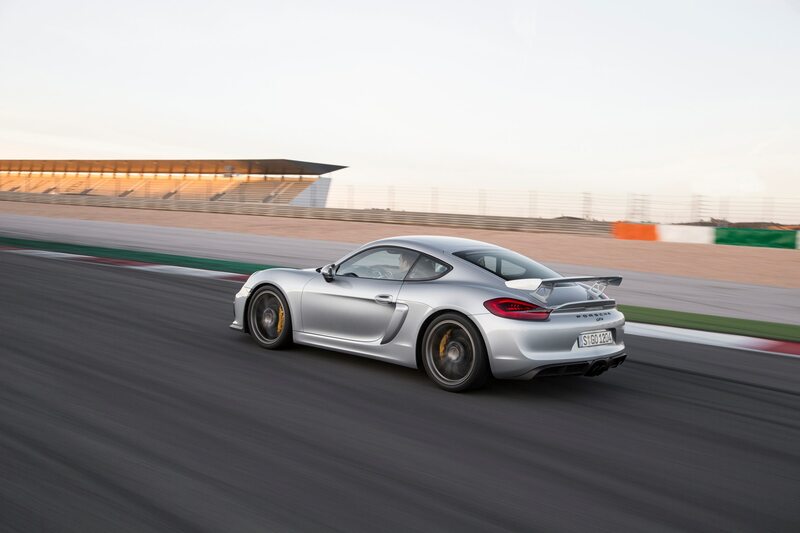 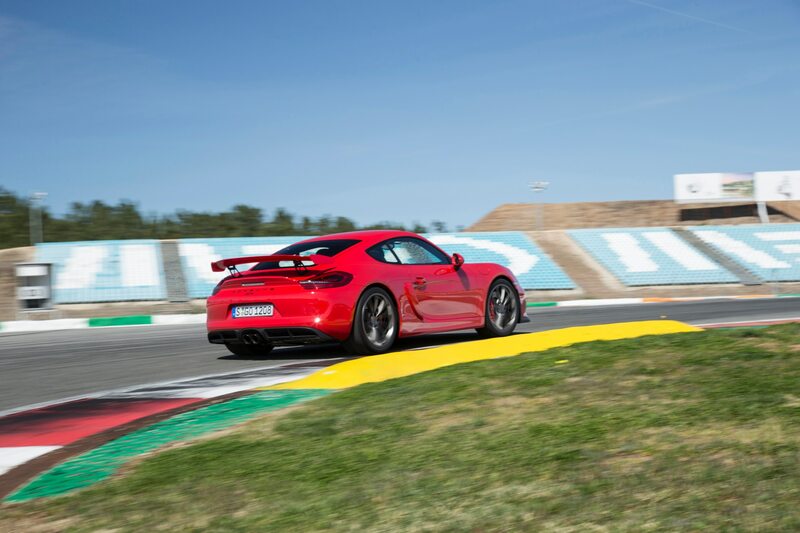 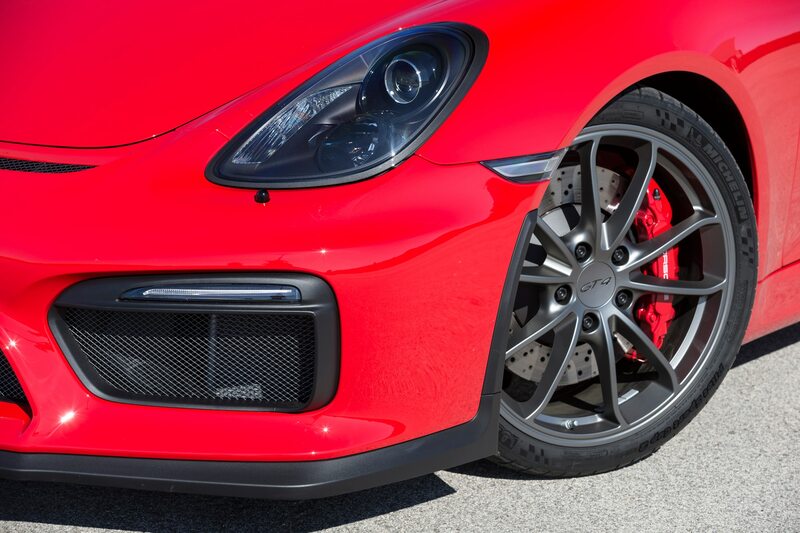 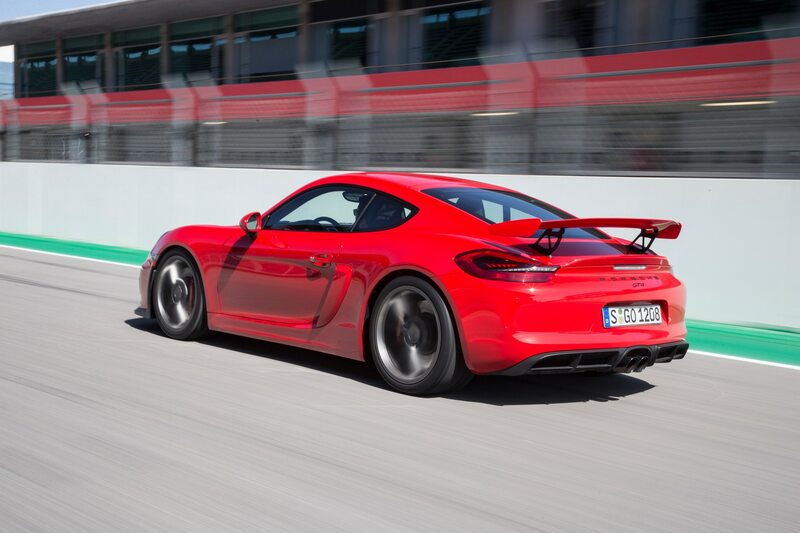 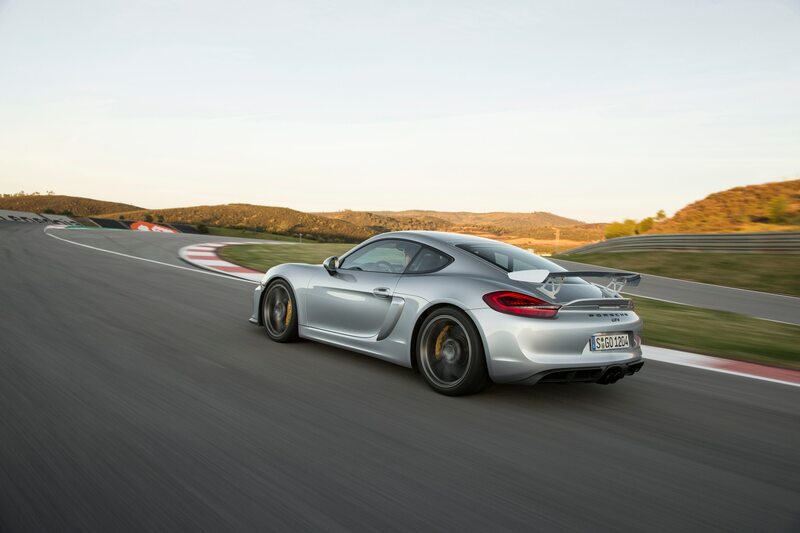 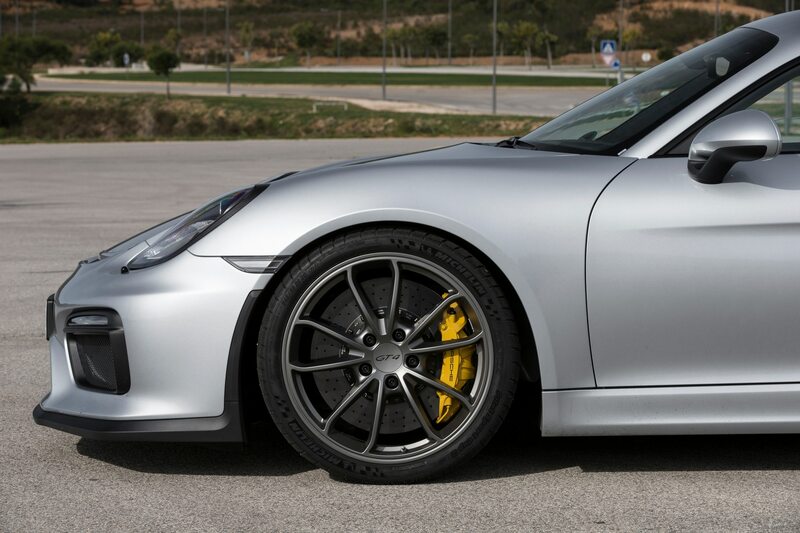 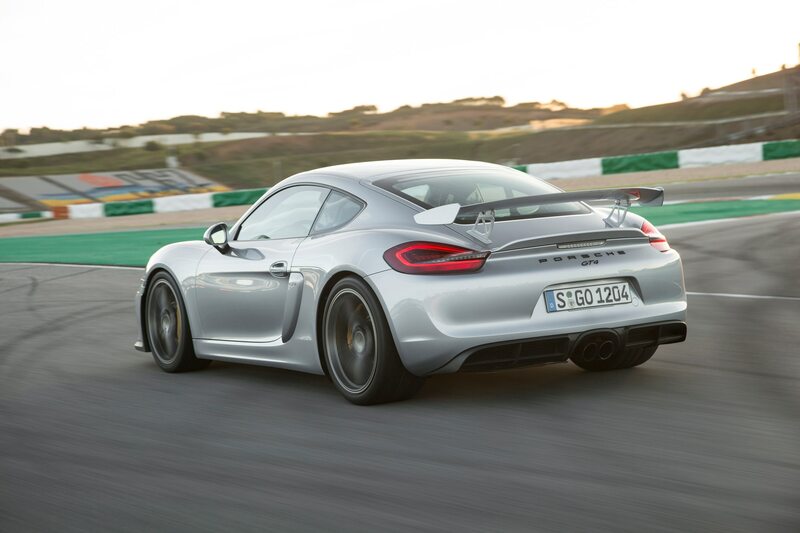 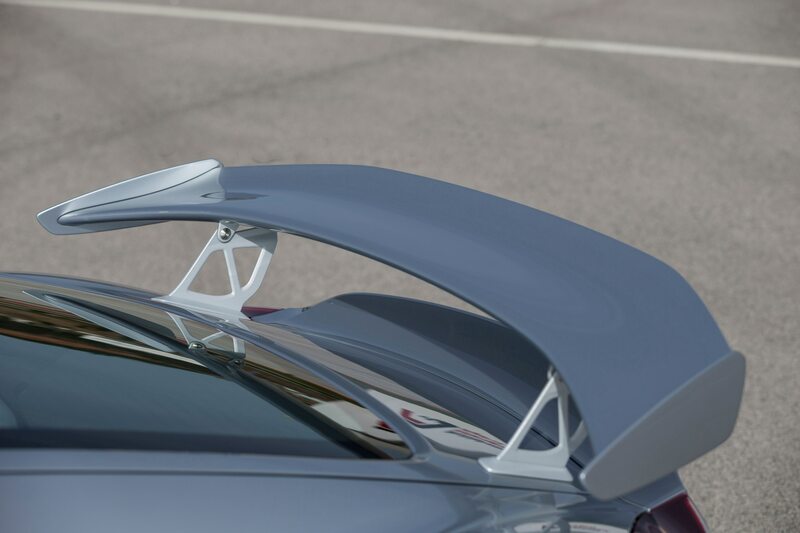 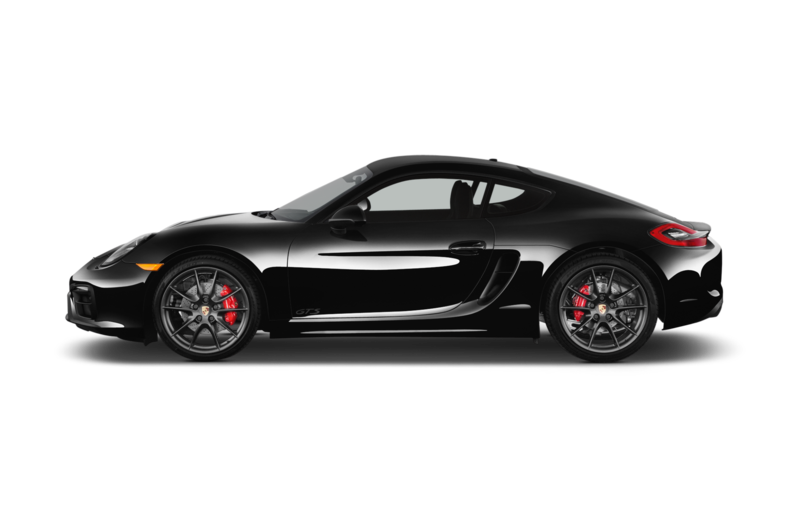 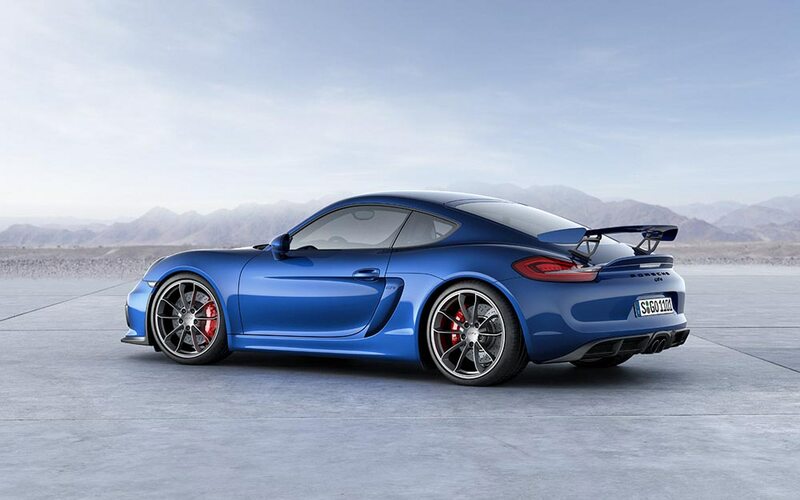 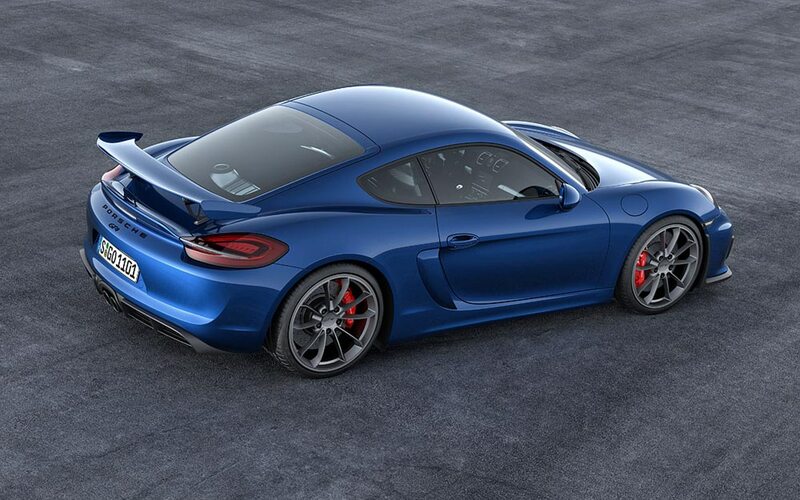 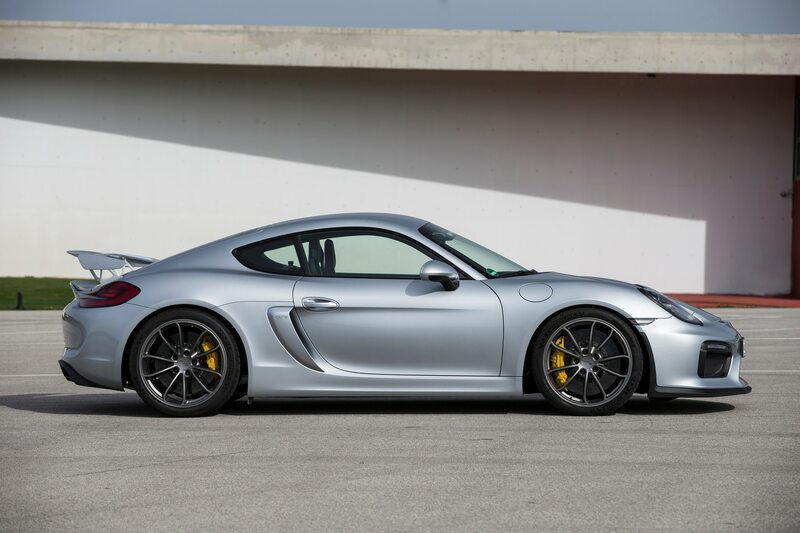 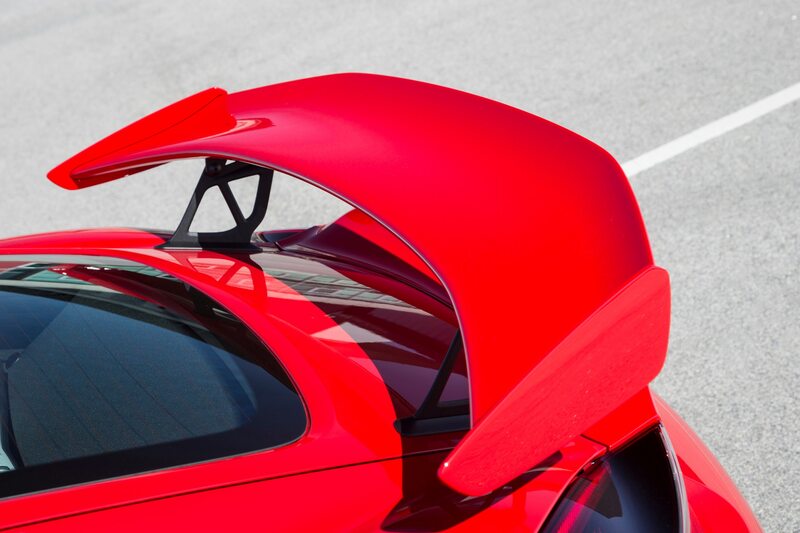 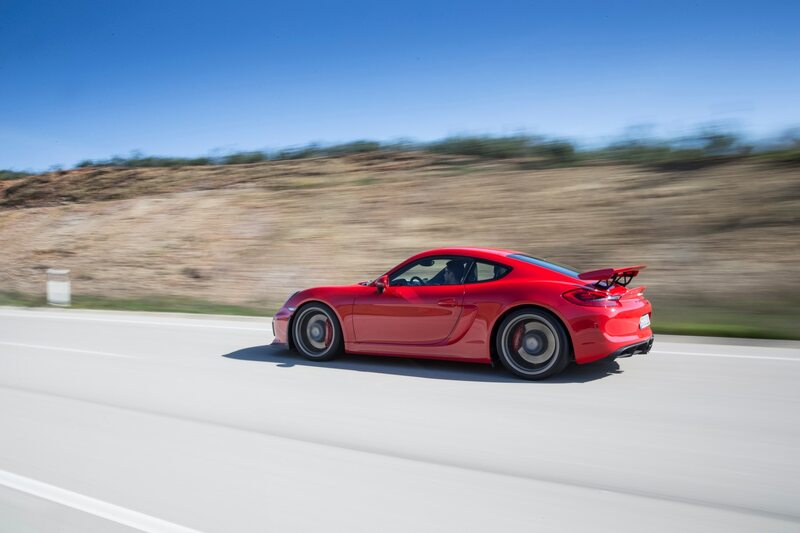 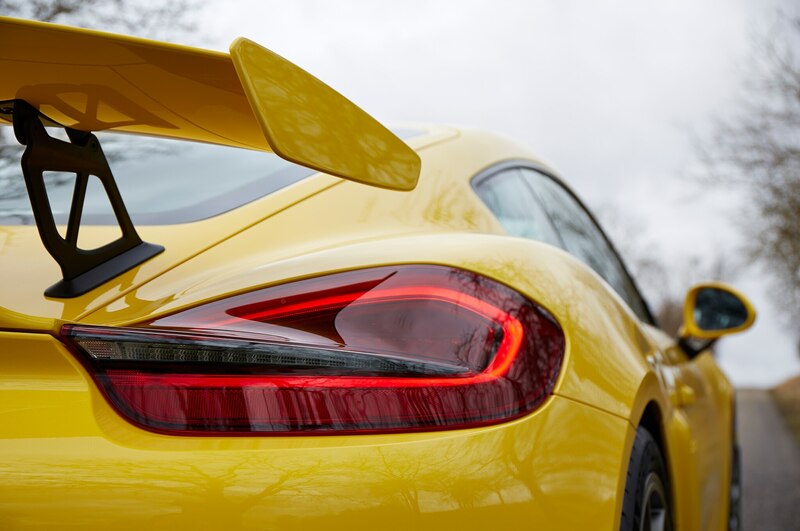 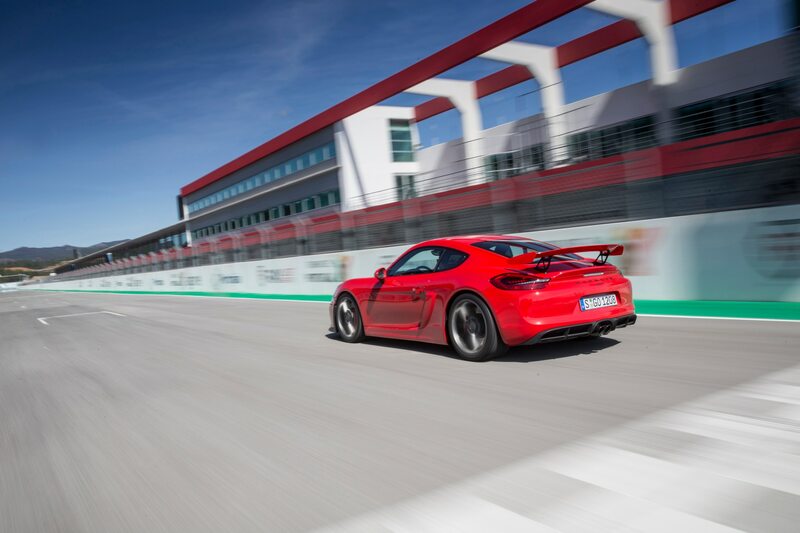 All in all, the sportiest Cayman produces 220 pounds of downforce at speed. 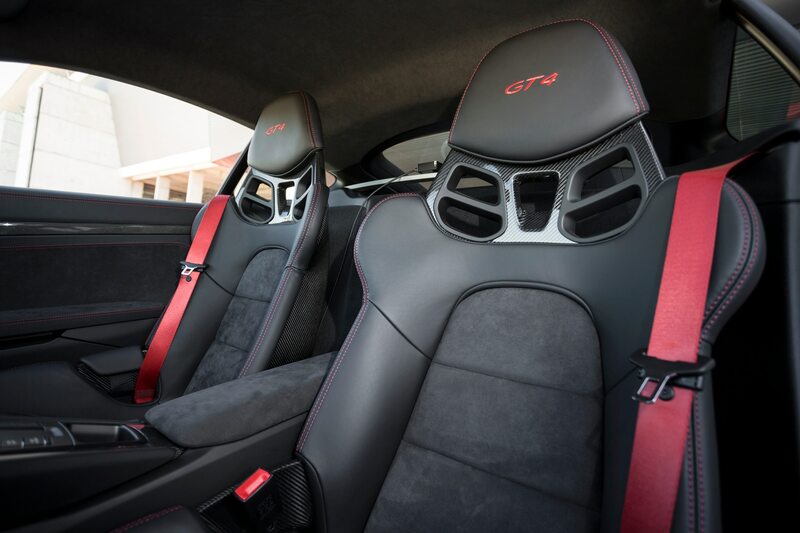 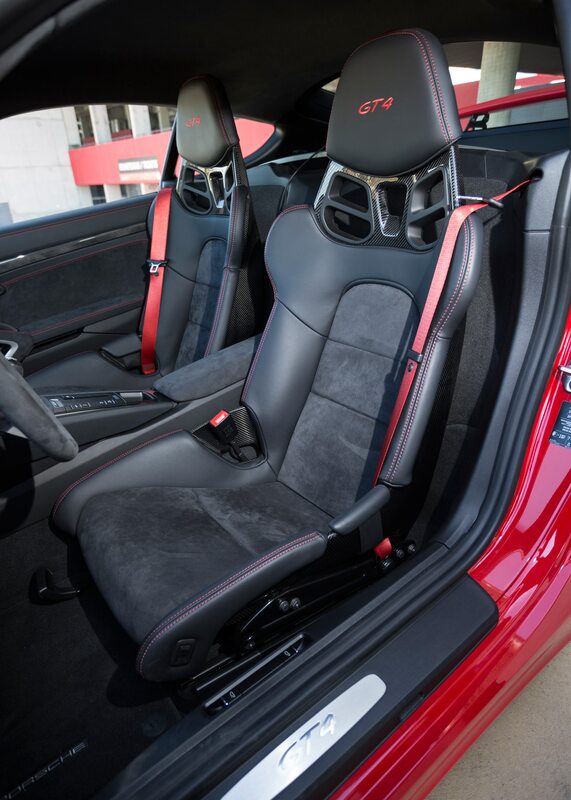 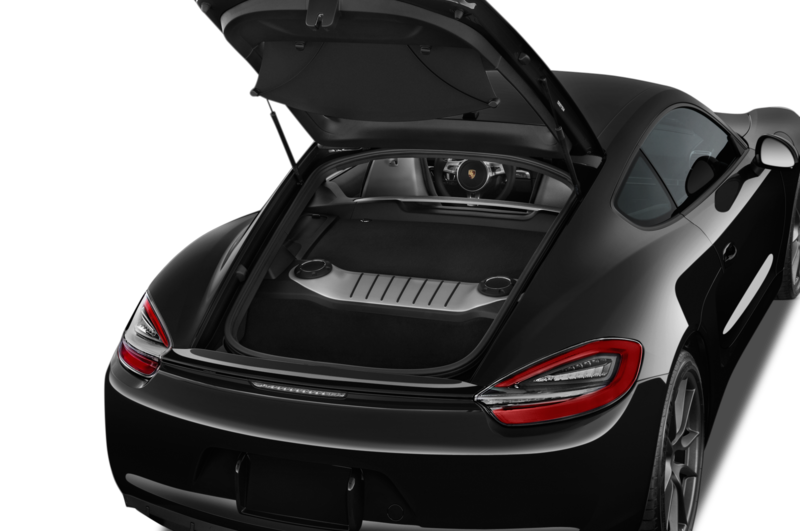 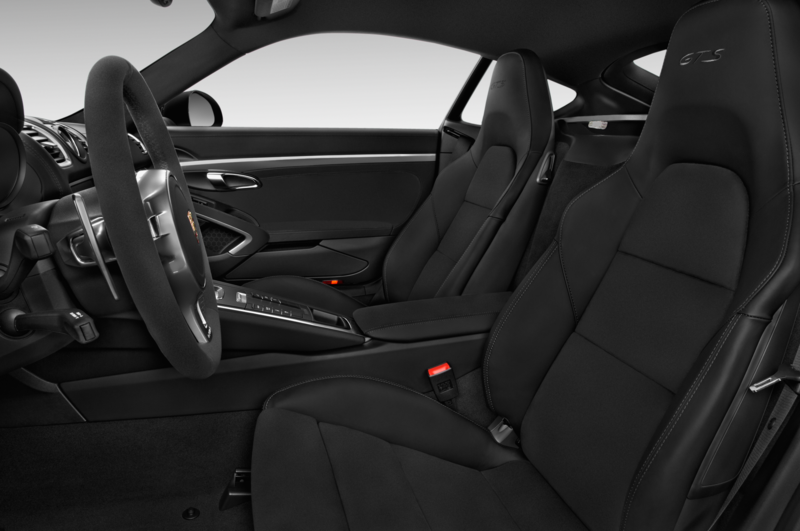 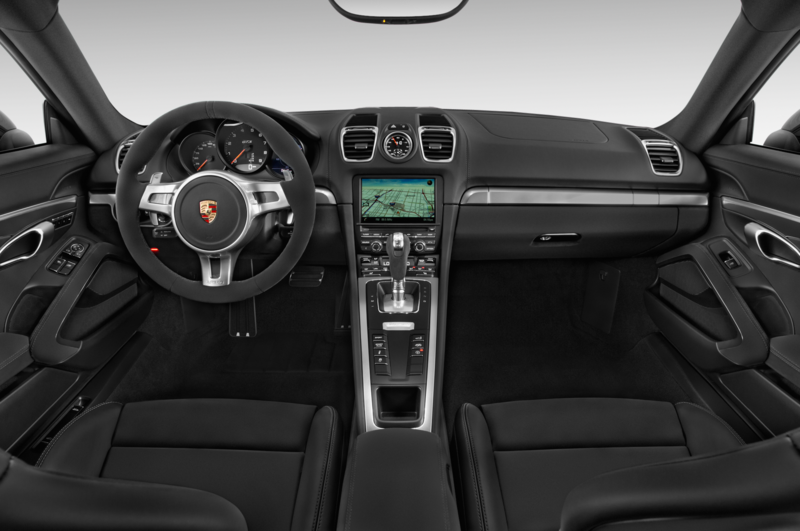 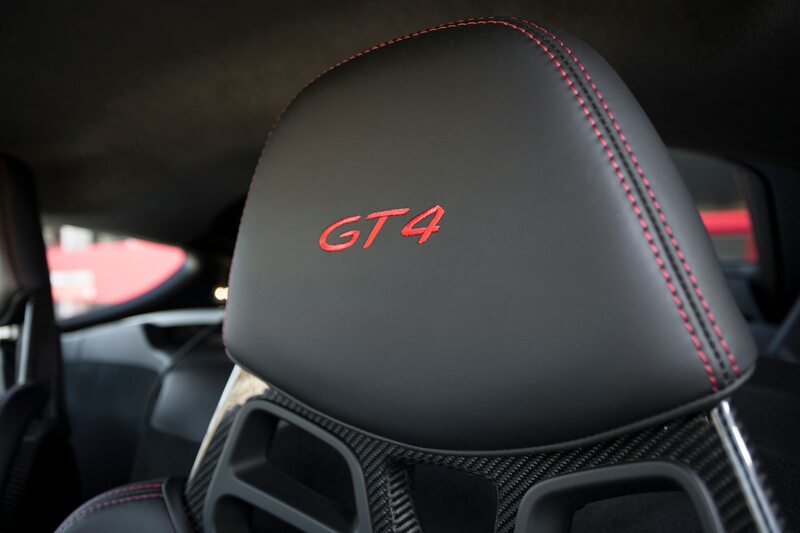 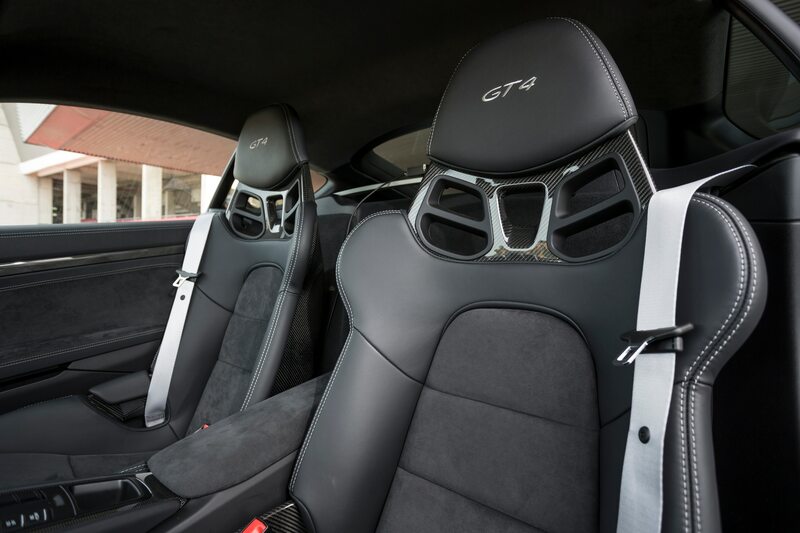 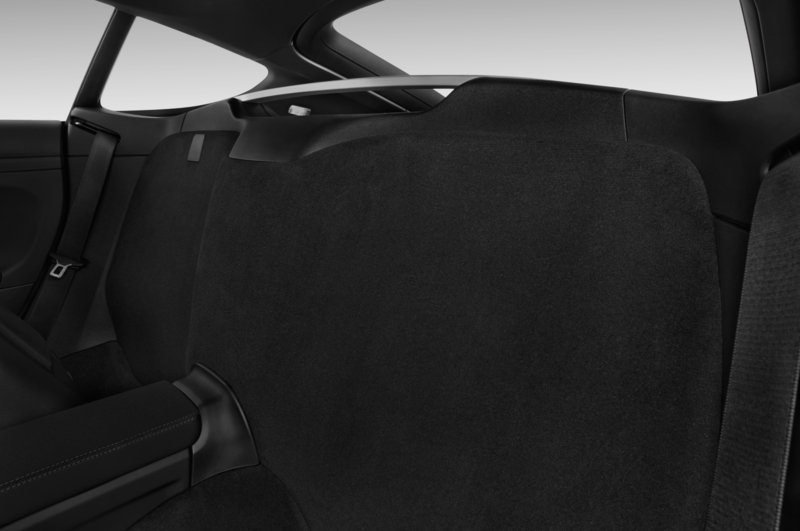 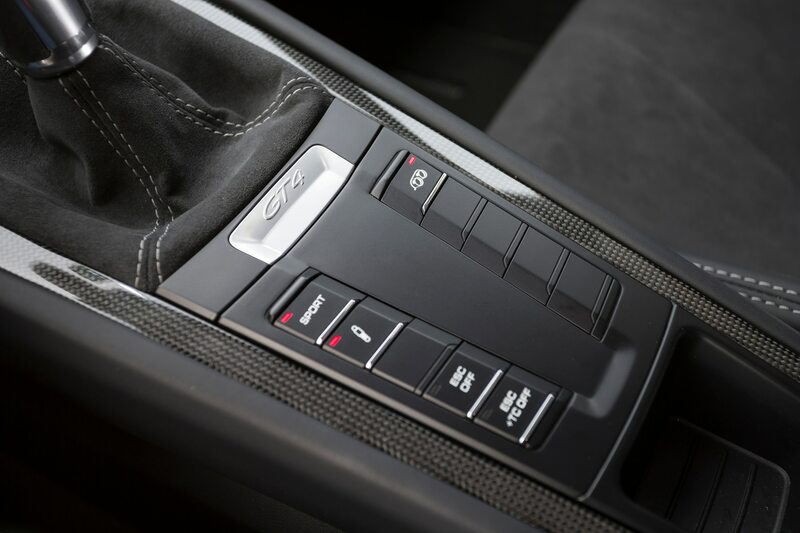 Climb into the optional lightweight bucket seats, reminiscent of those in the 918, and wrap your hands around the Alcantara steering wheel. 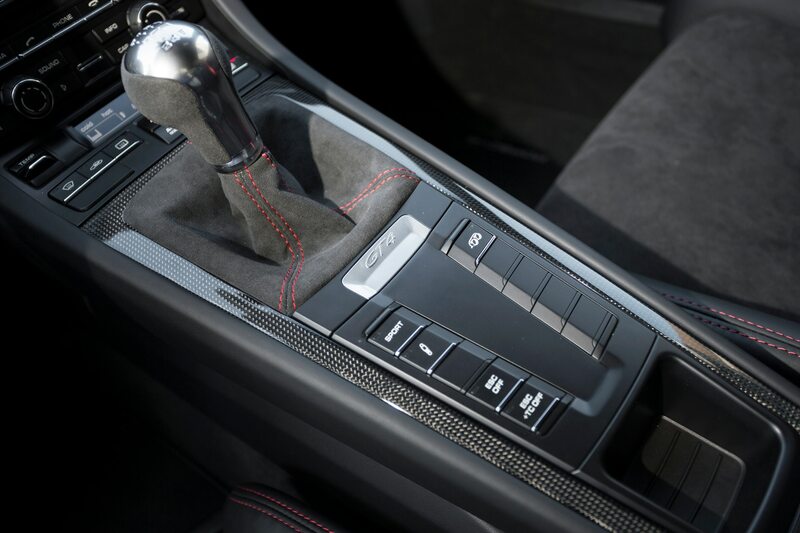 It has no buttons, no thumbwheels, no shift paddles. 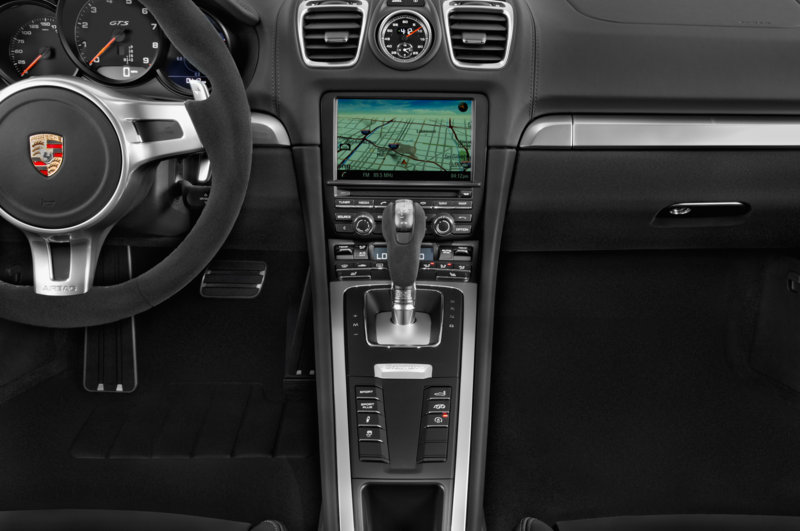 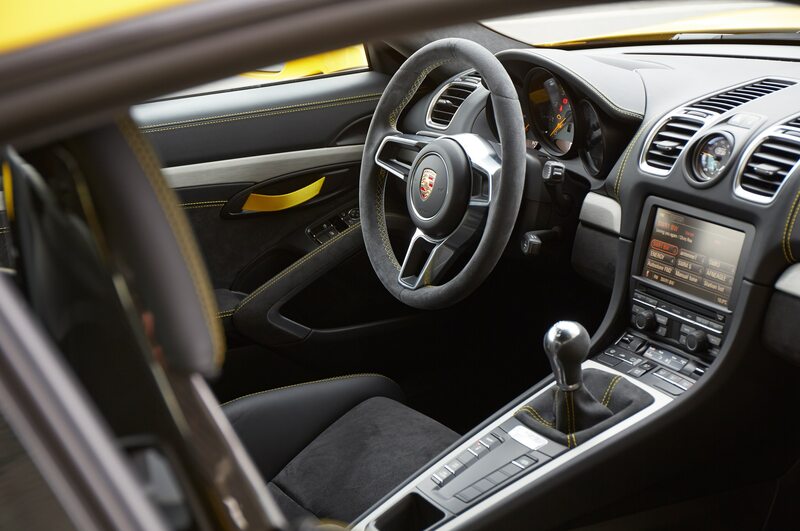 This is an environment for sports-car lovers: clearly legible instruments, no head-up display, and no automatic transmission. 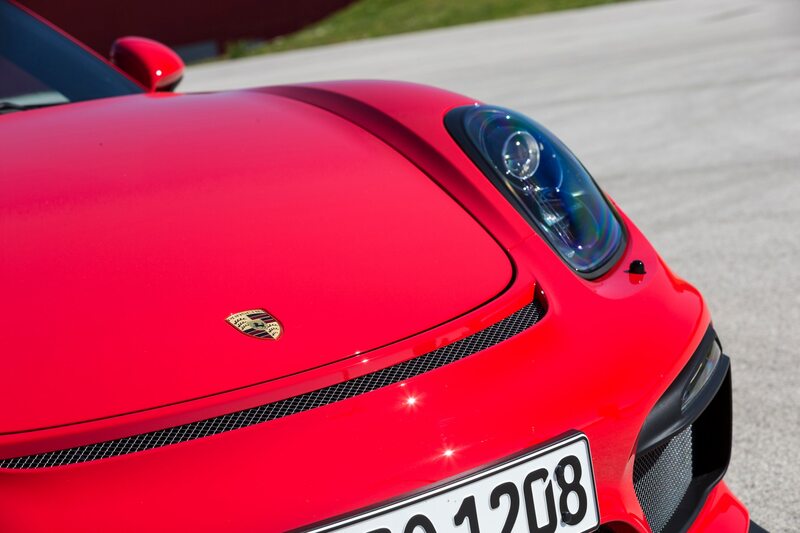 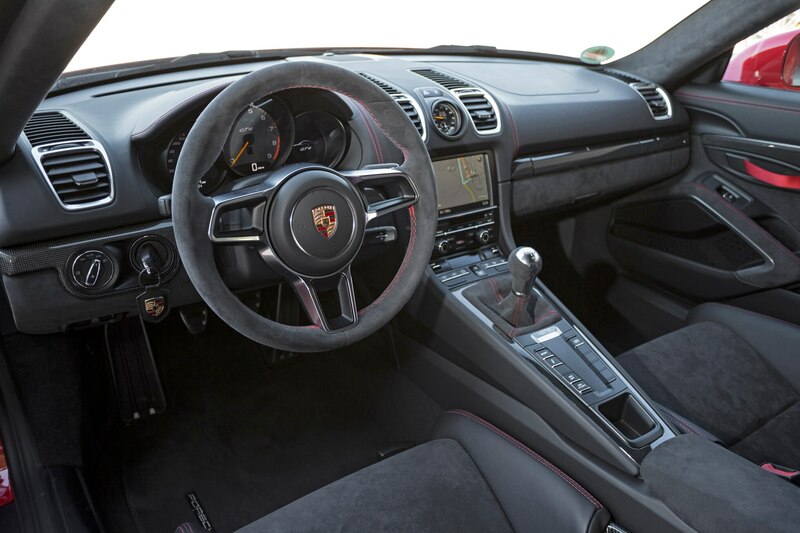 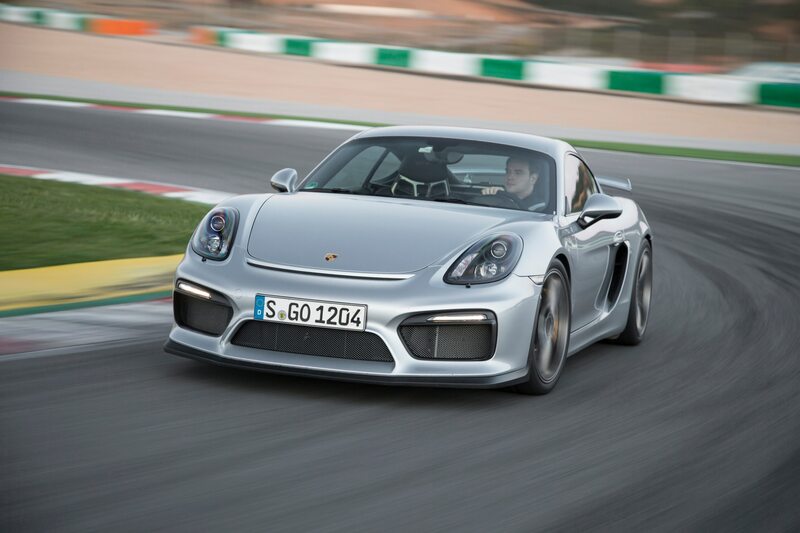 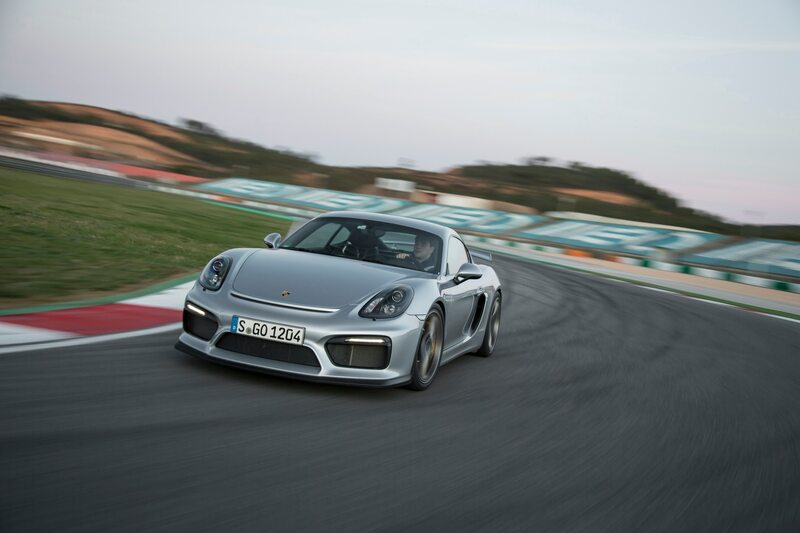 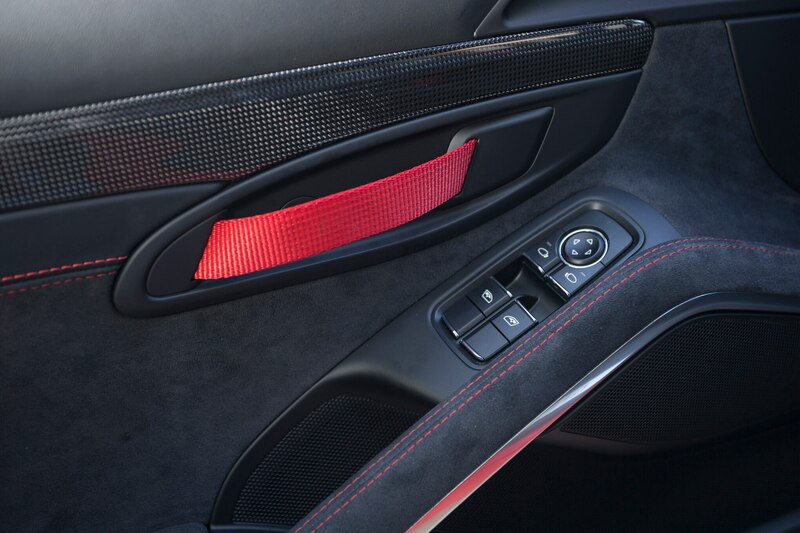 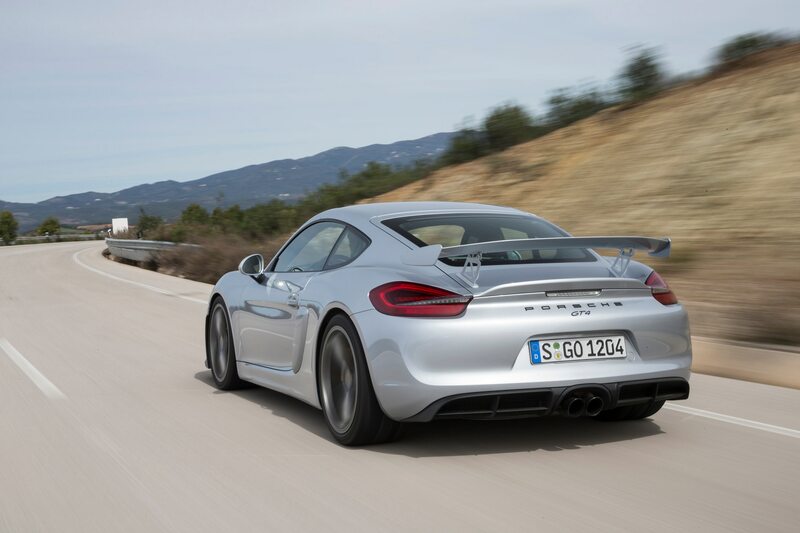 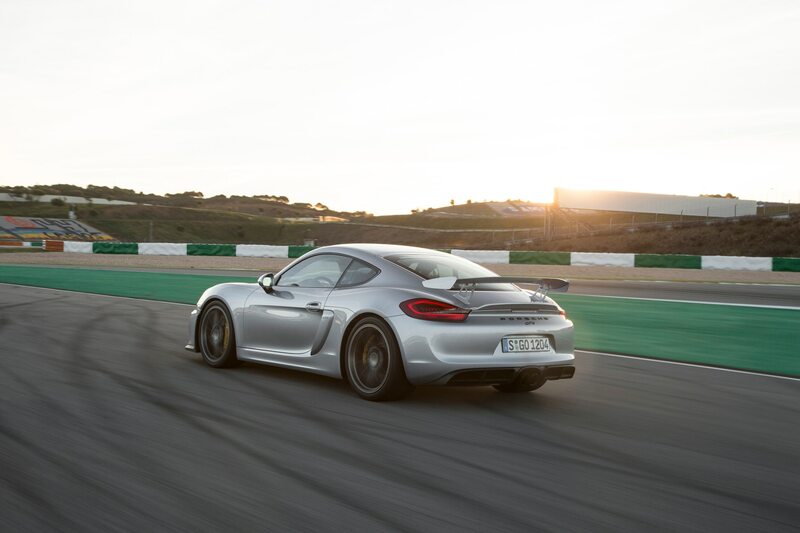 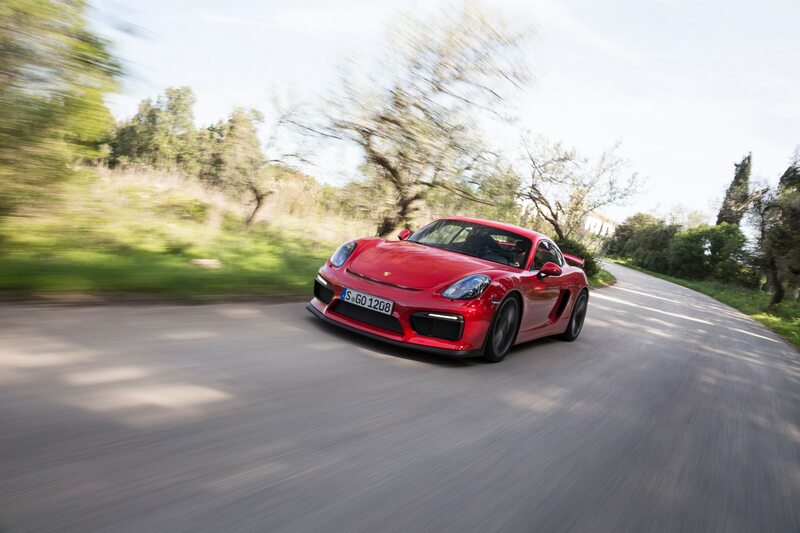 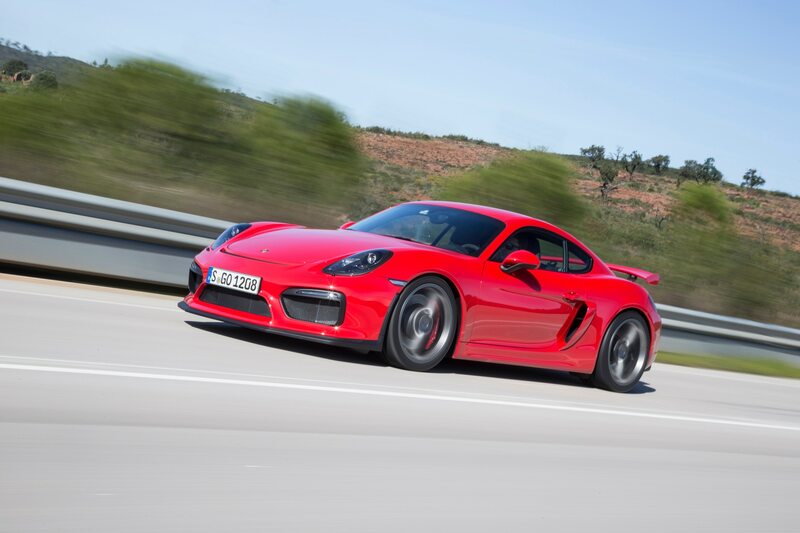 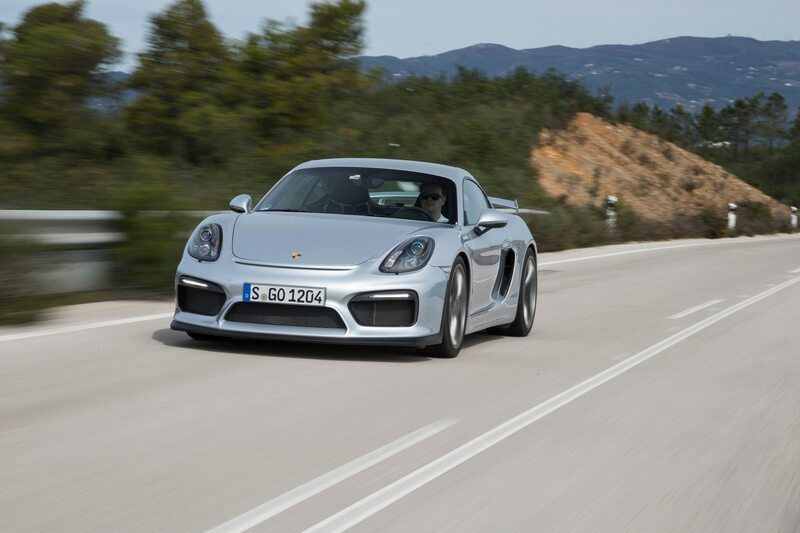 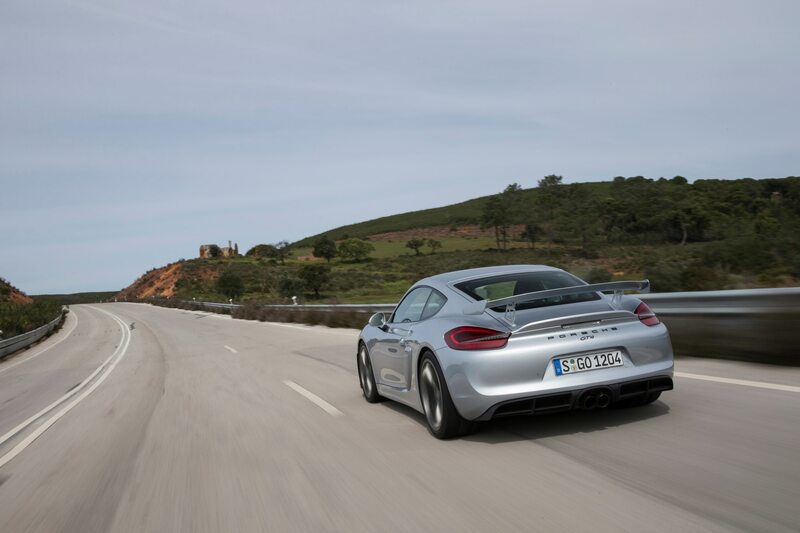 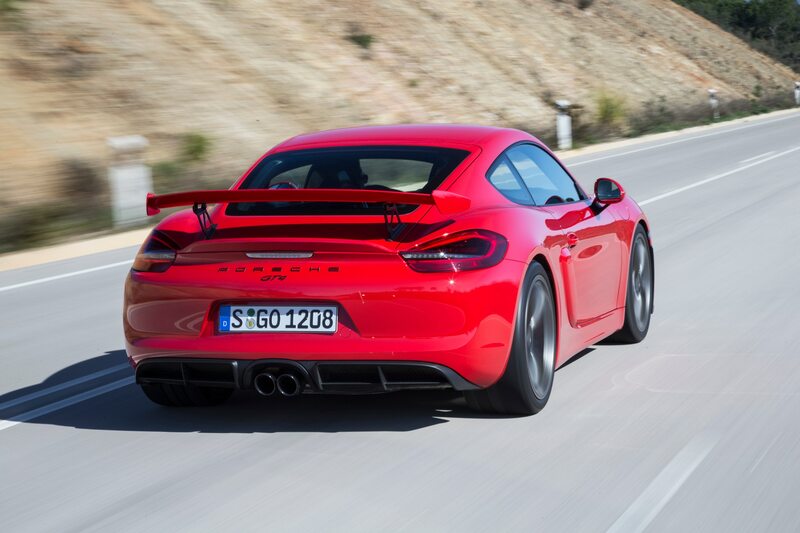 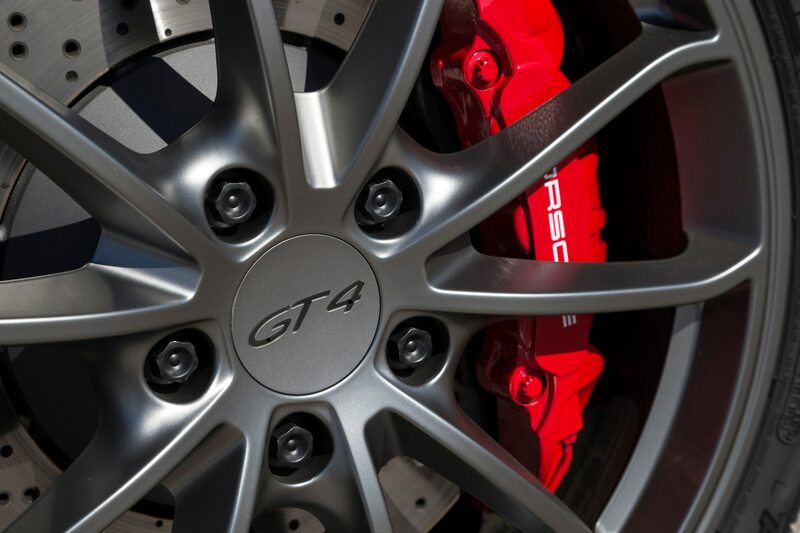 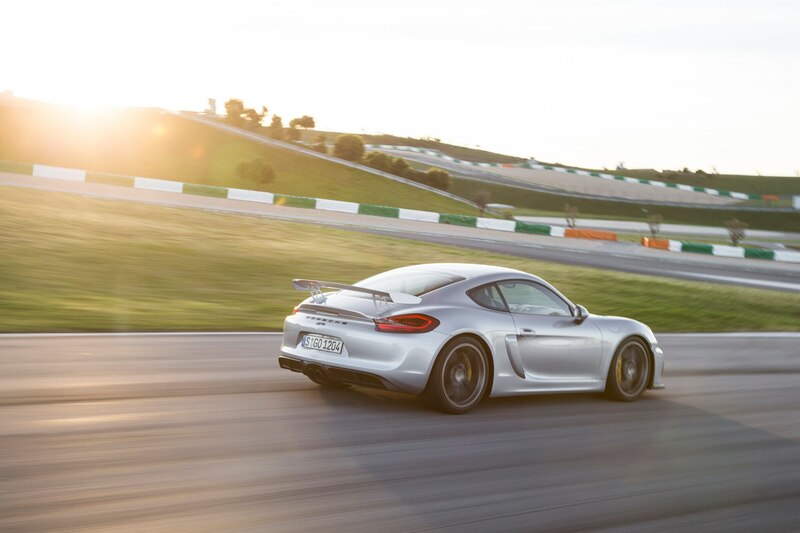 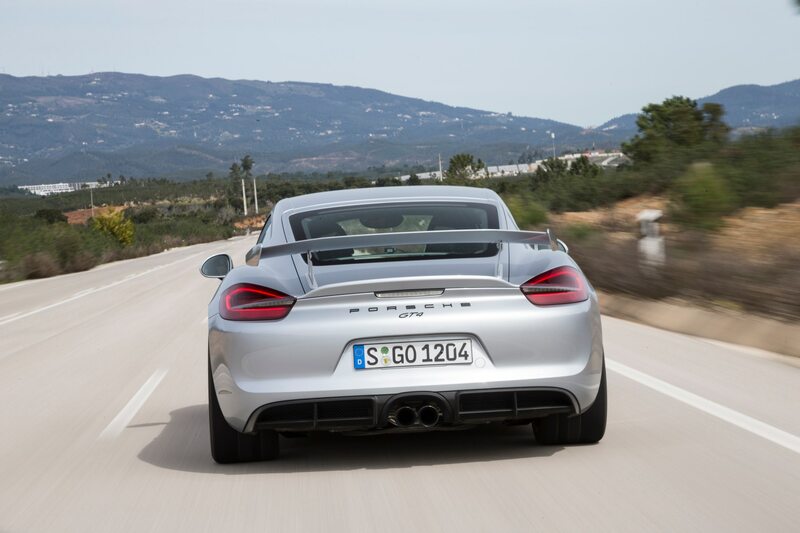 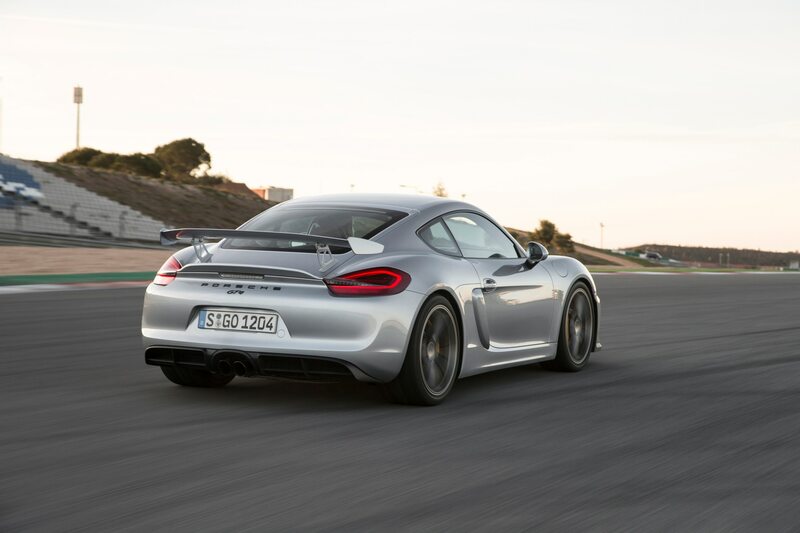 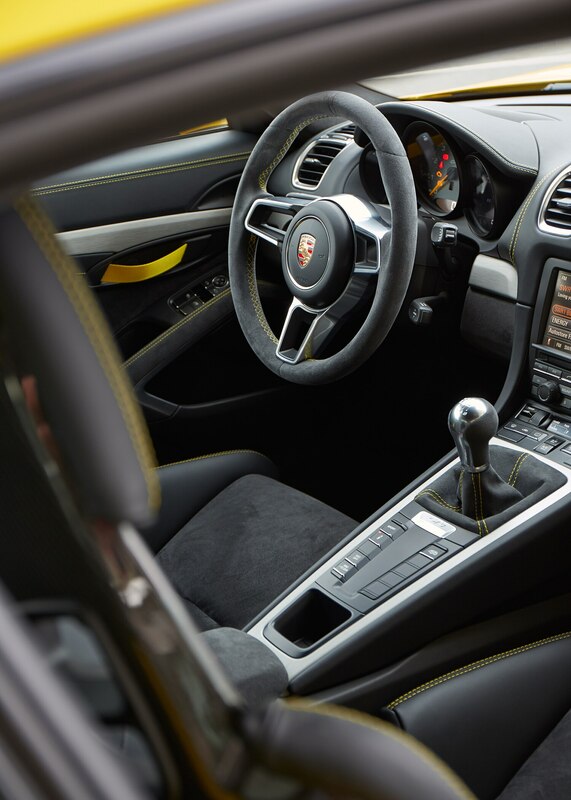 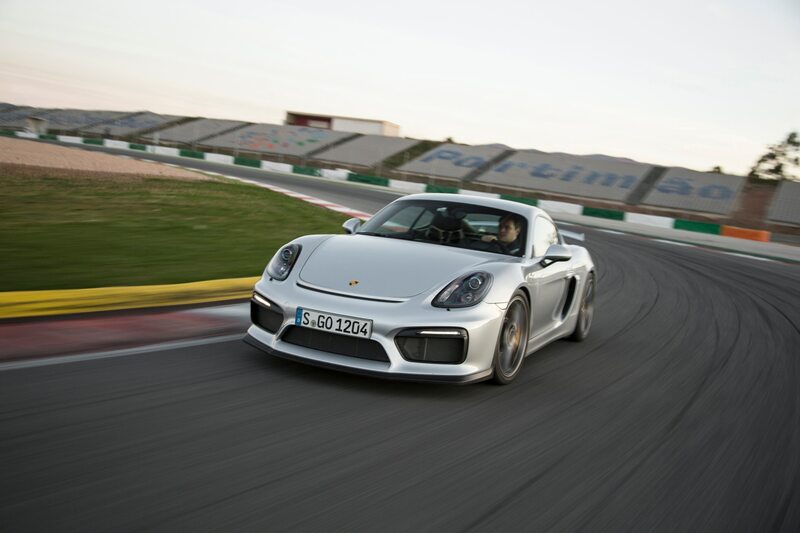 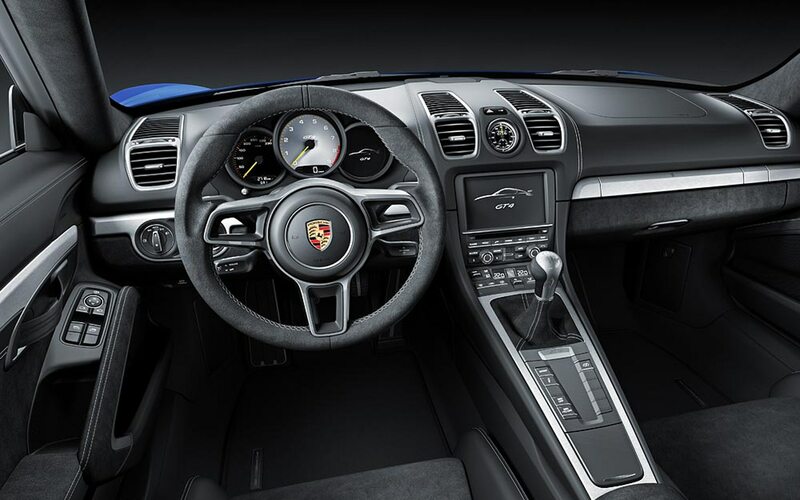 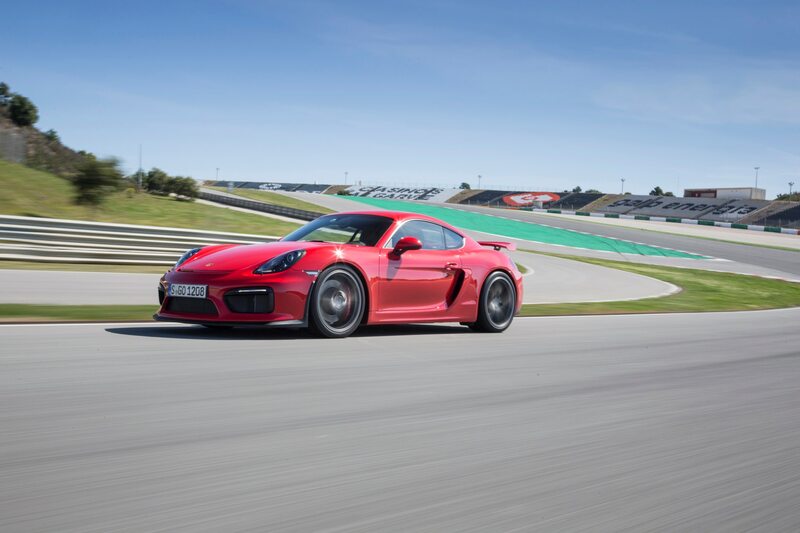 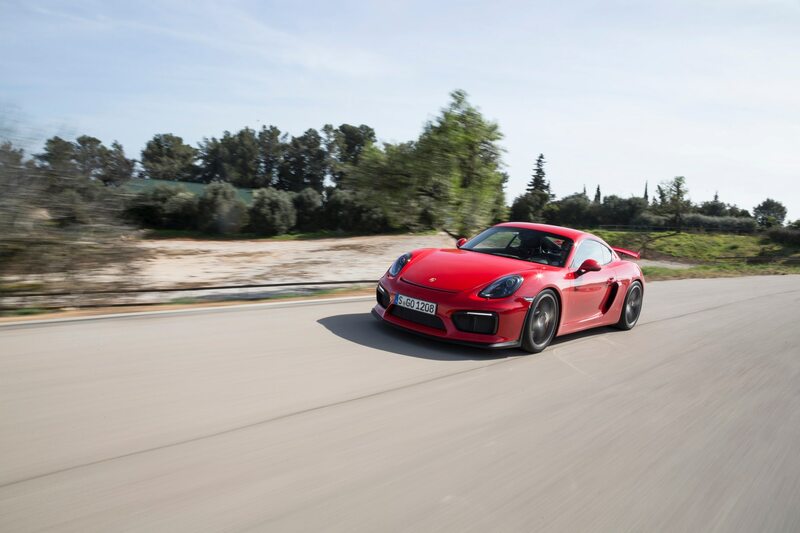 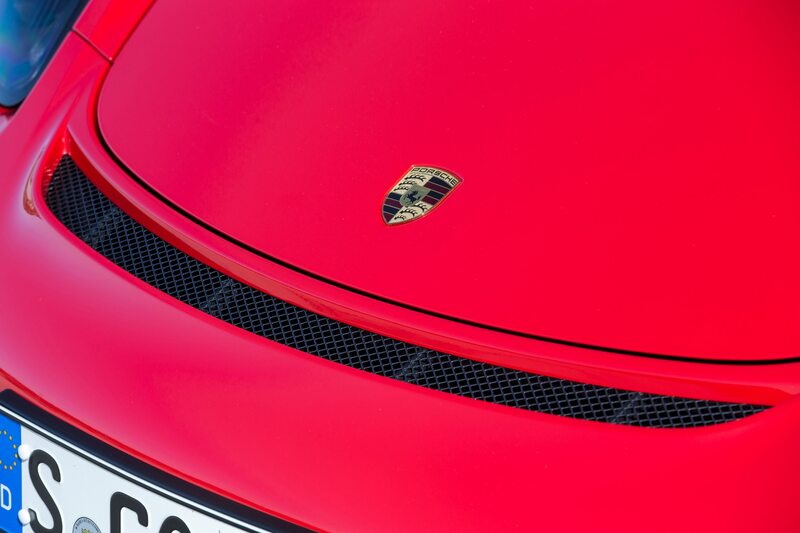 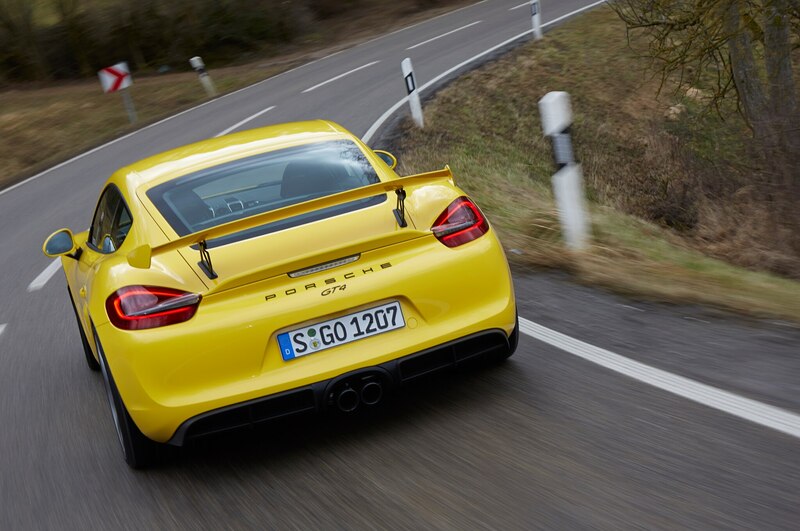 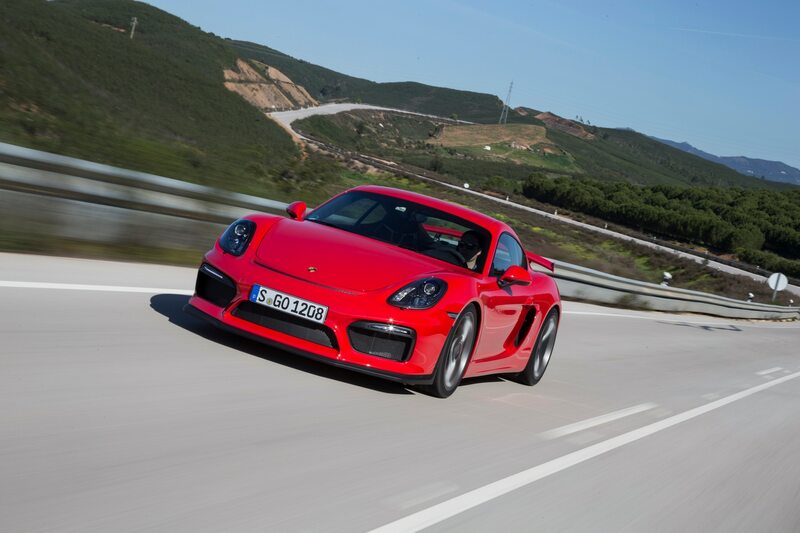 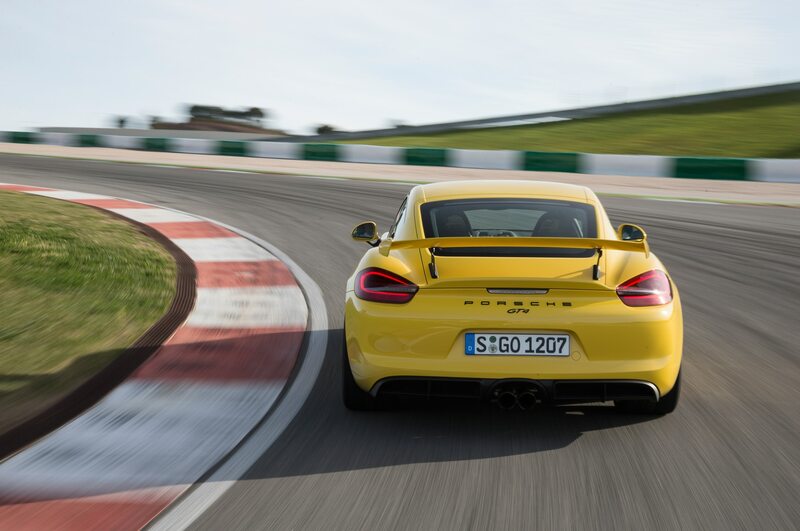 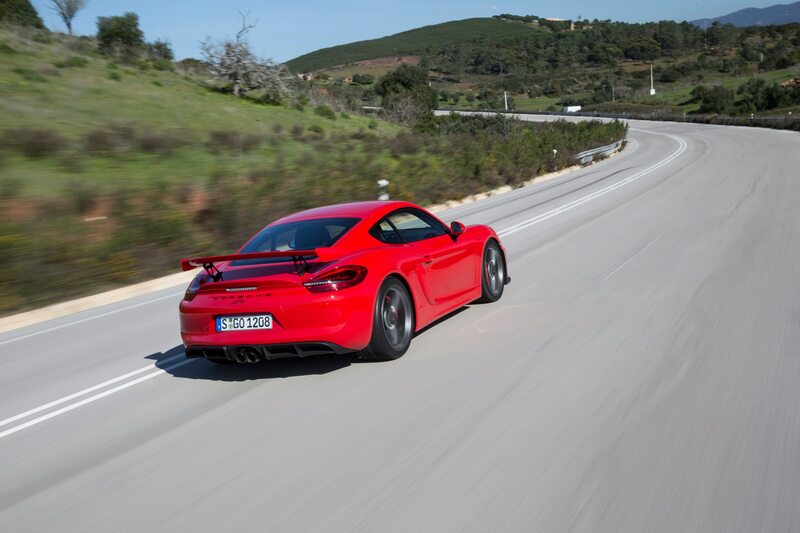 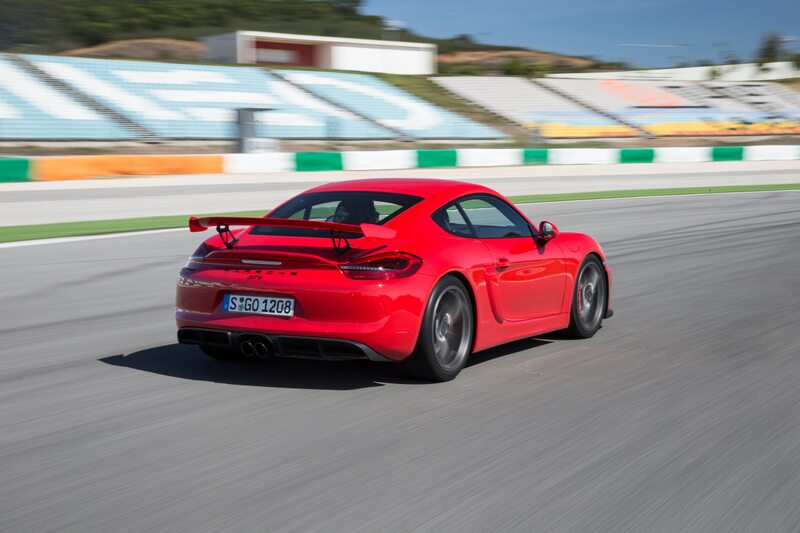 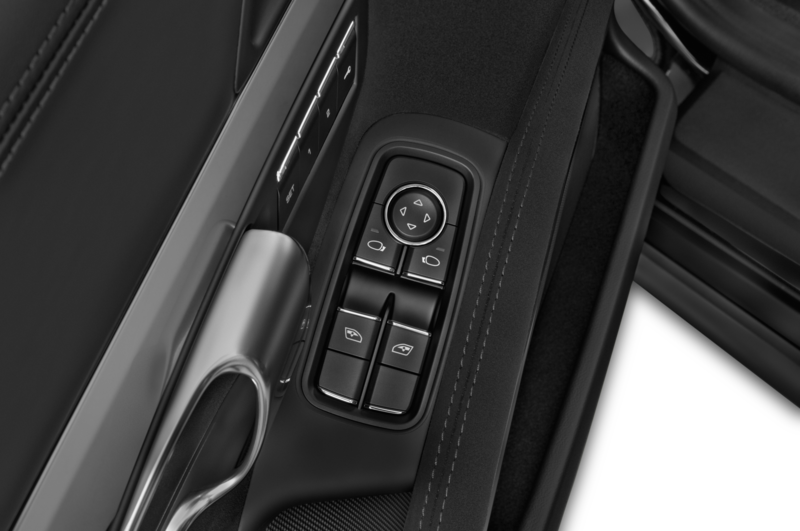 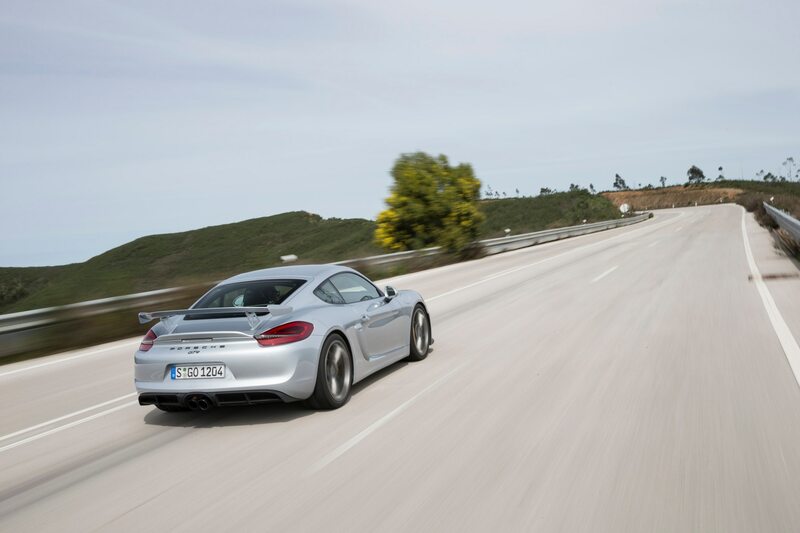 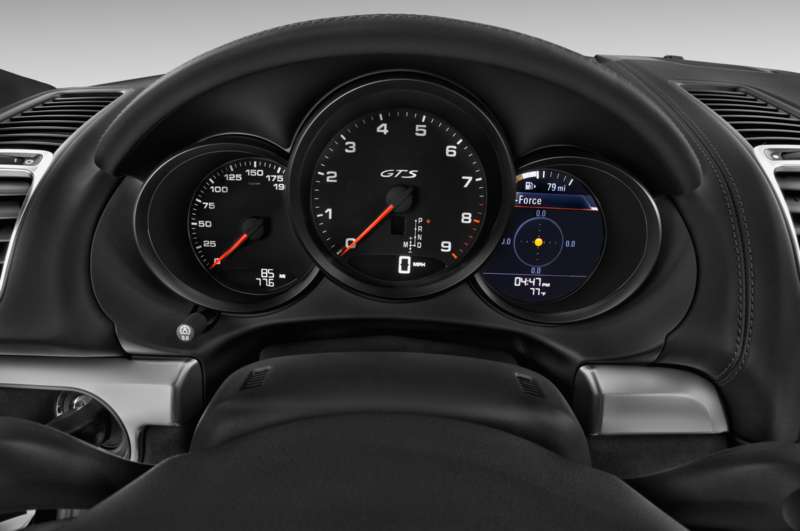 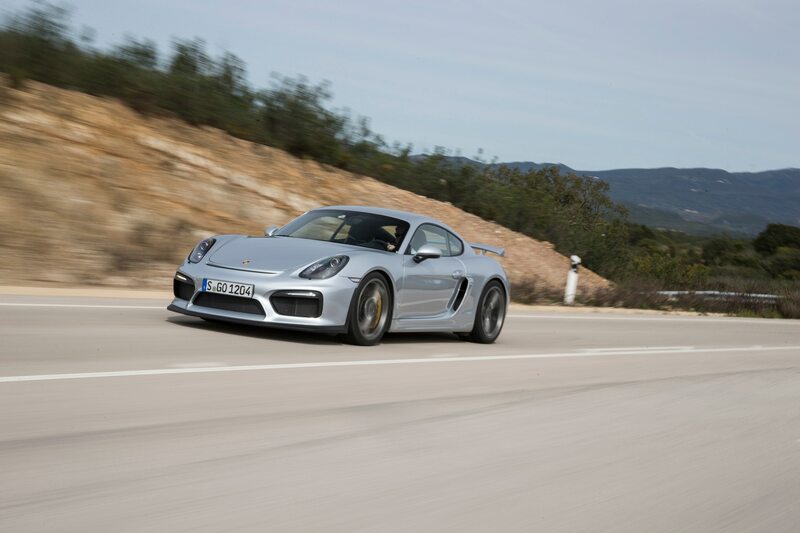 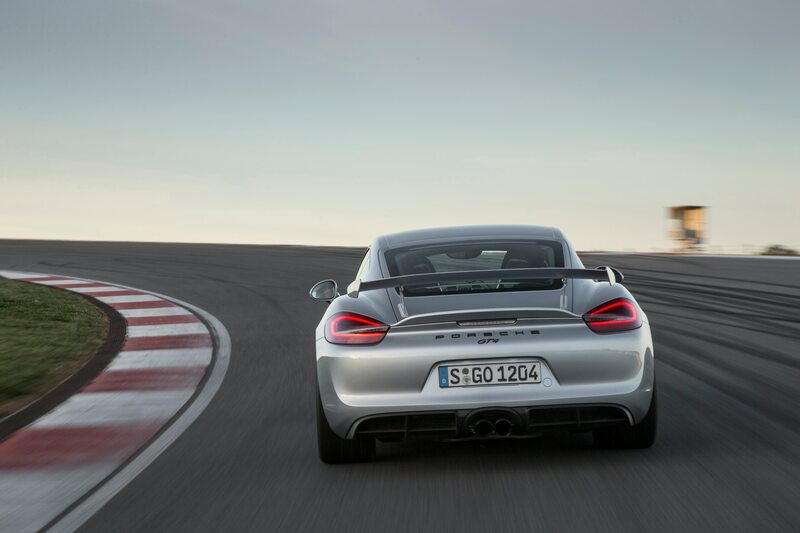 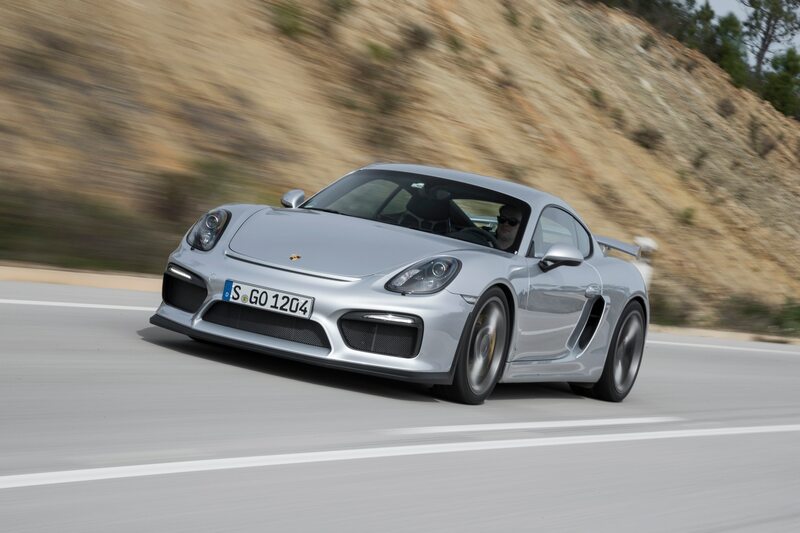 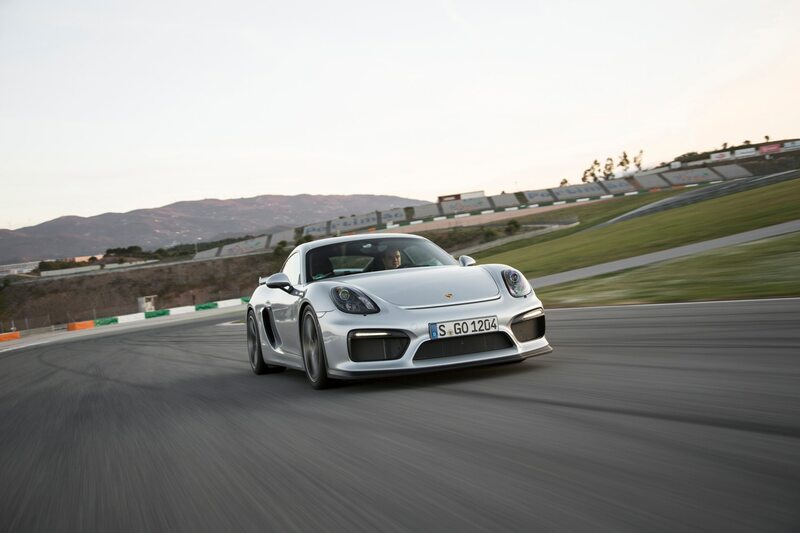 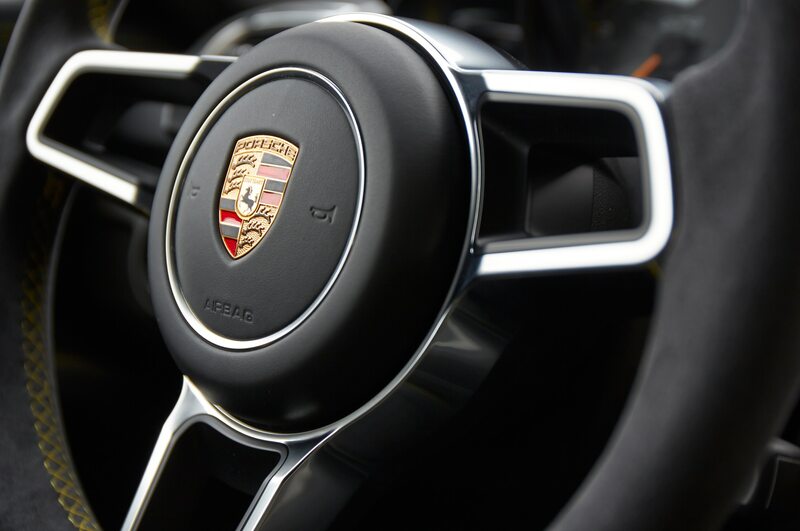 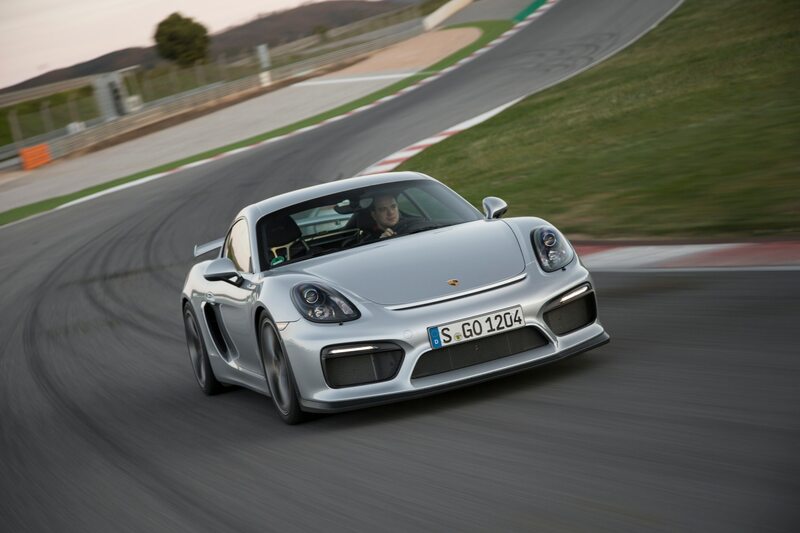 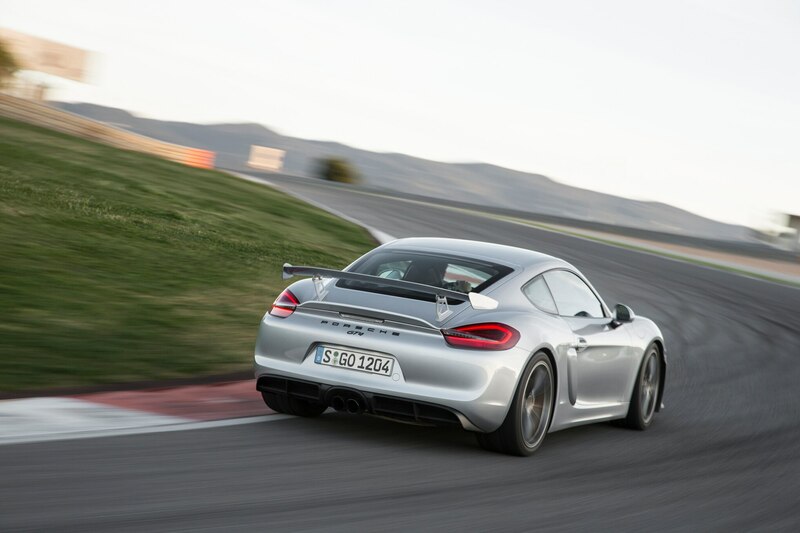 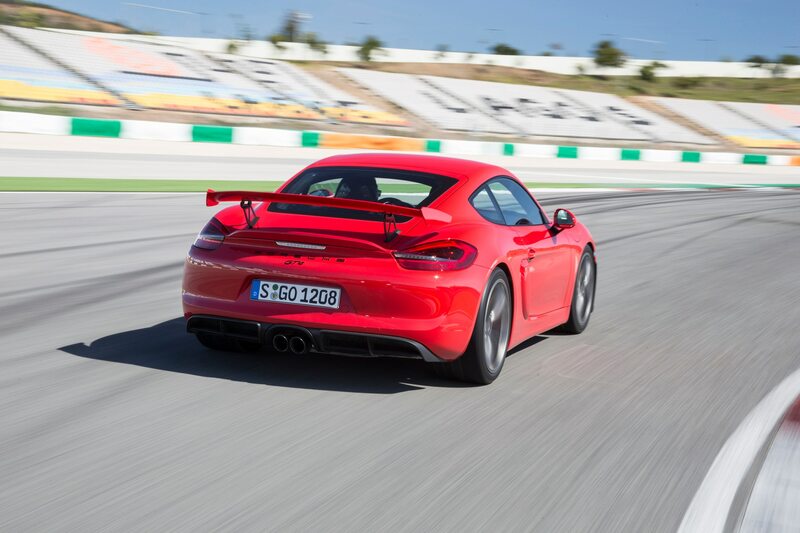 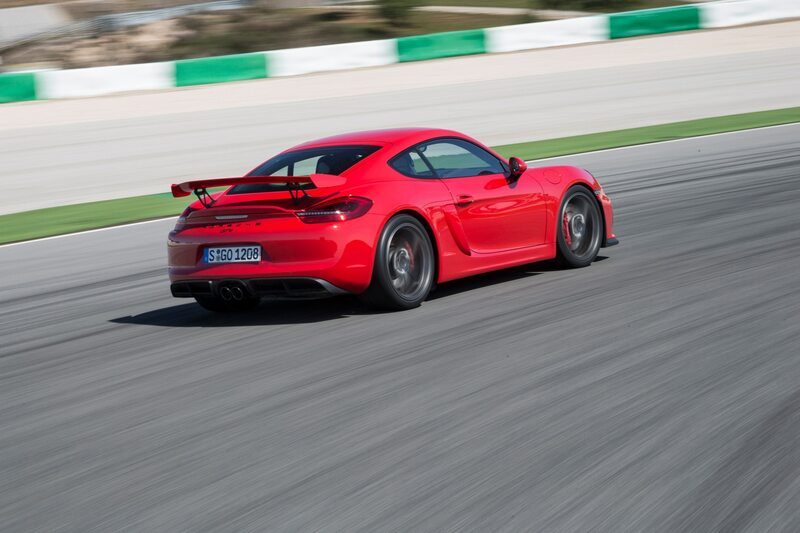 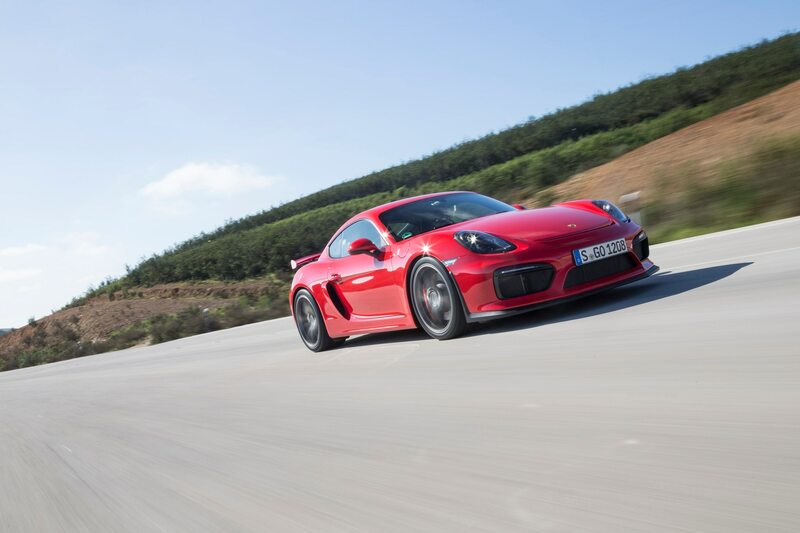 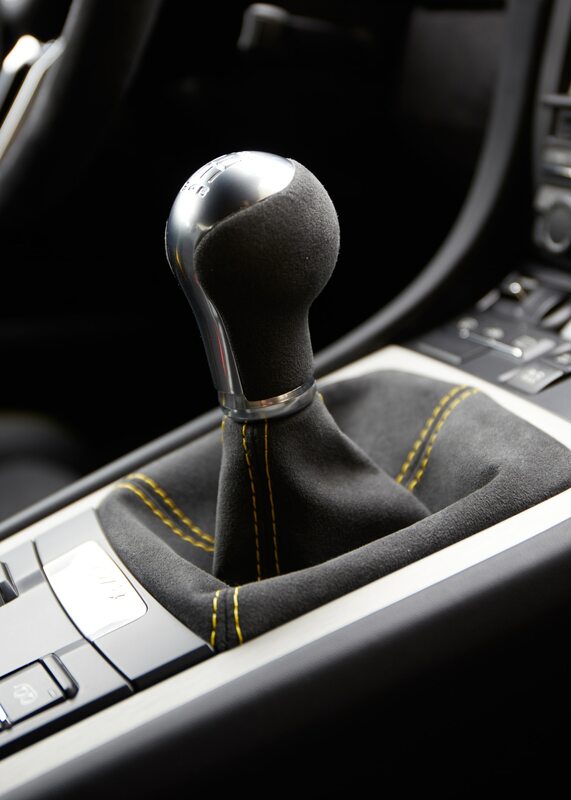 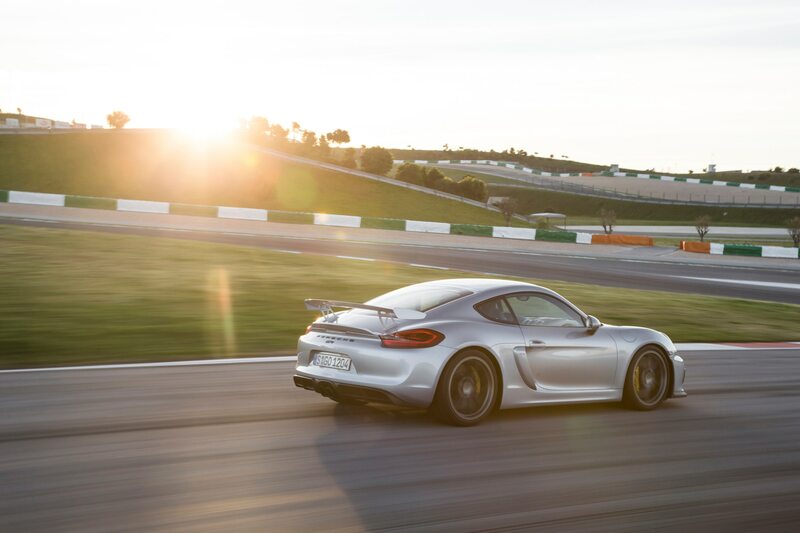 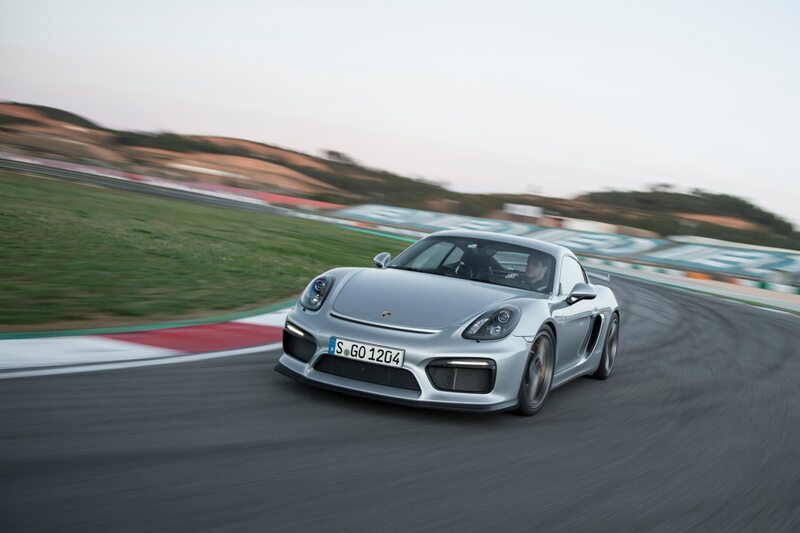 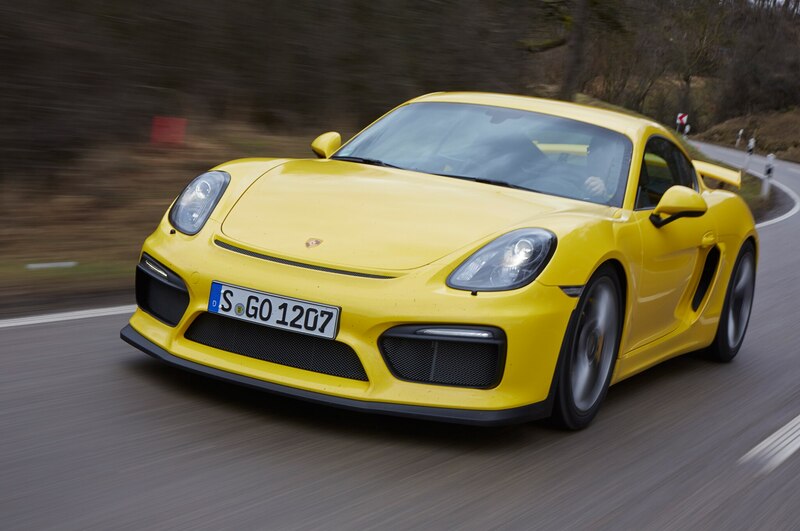 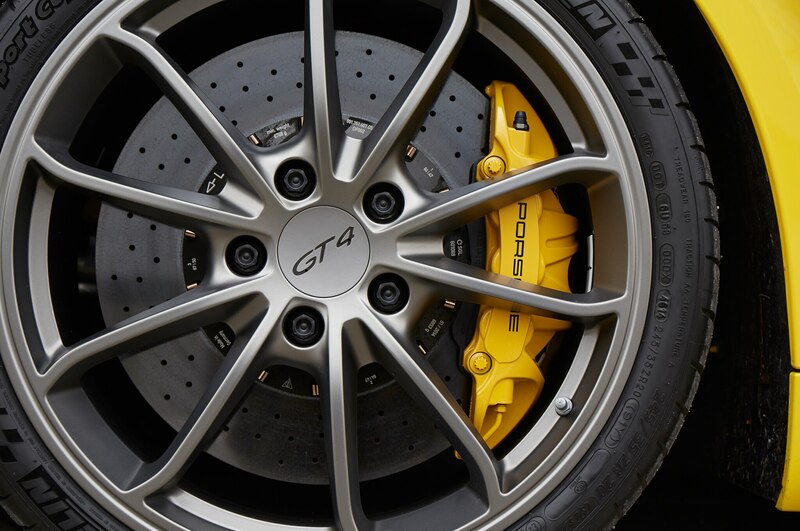 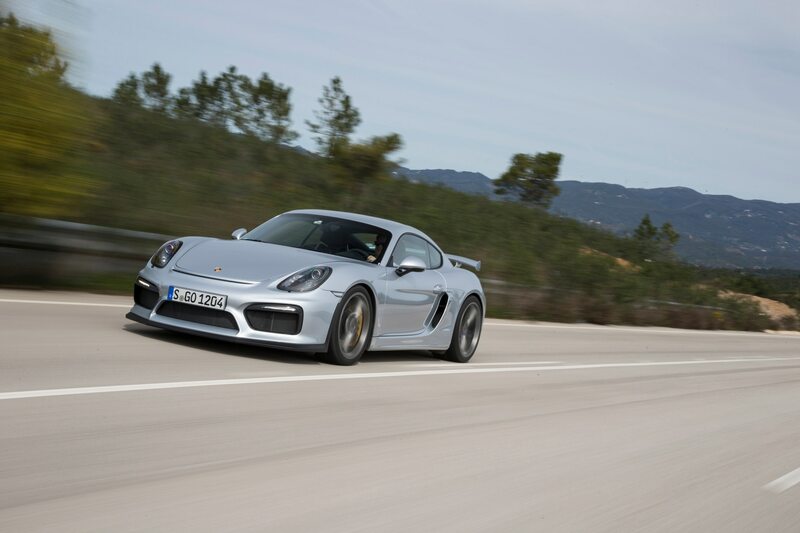 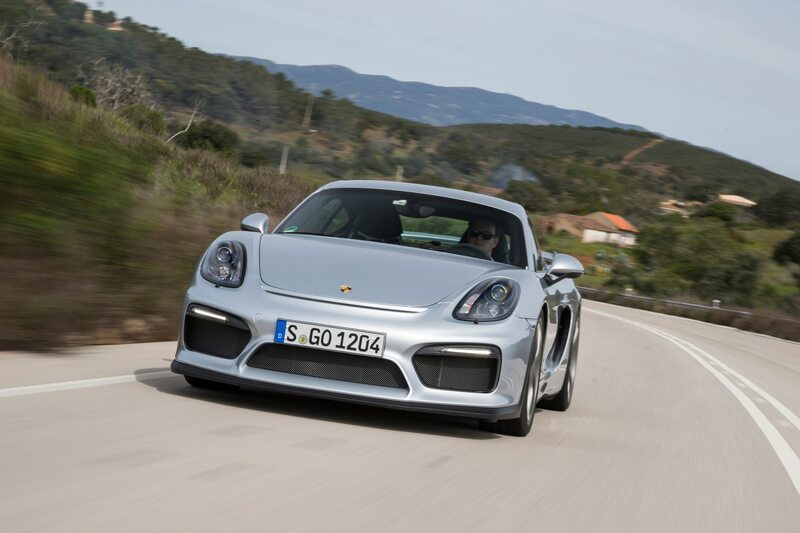 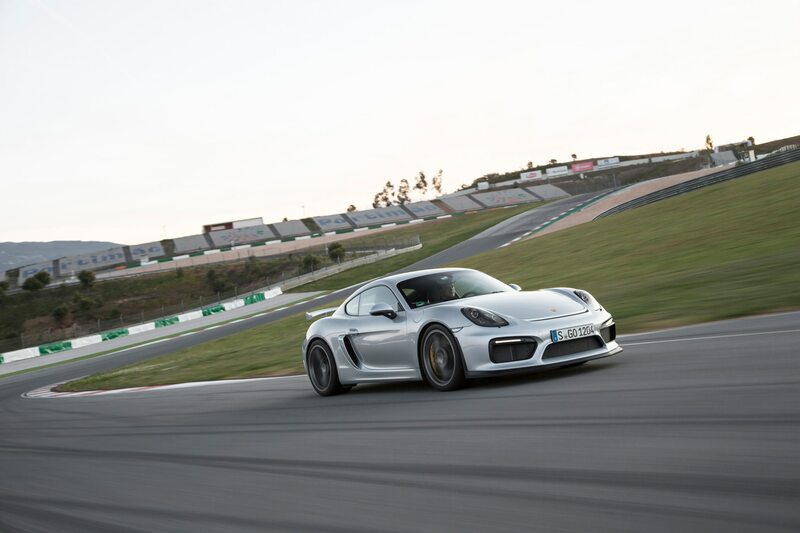 The only available gearbox is a six-speed manual, which is quicker and slicker than the one fitted to the Cayman GTS. 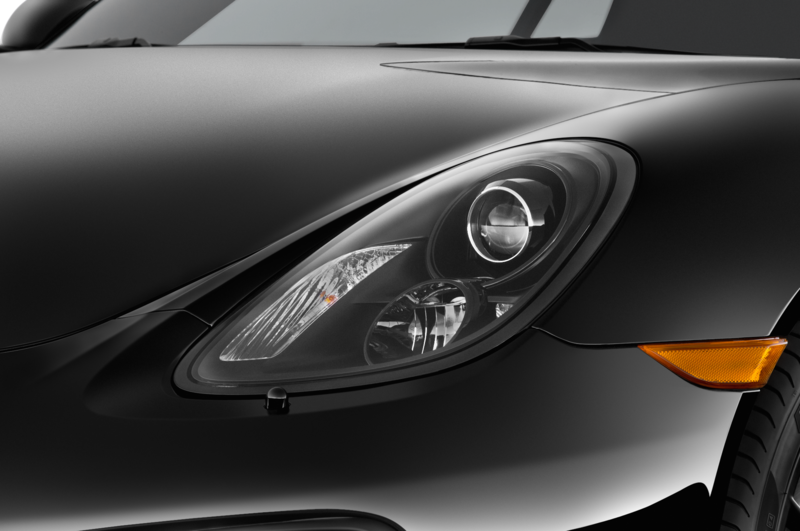 Intimidated yet? 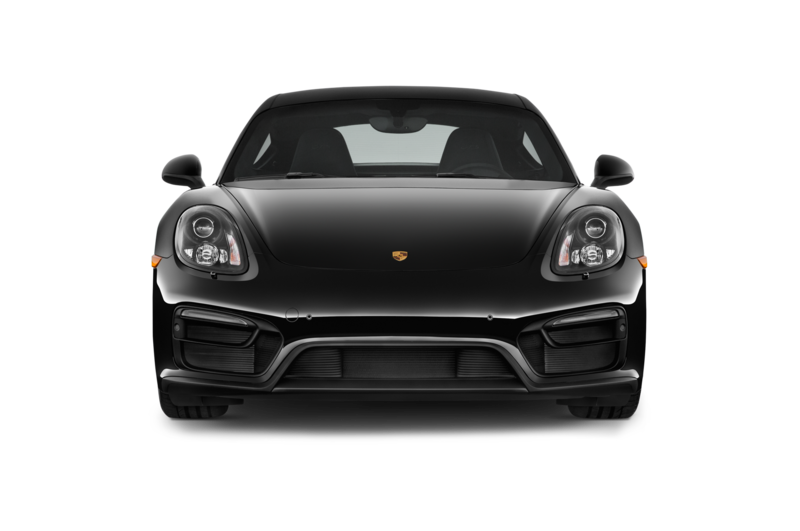 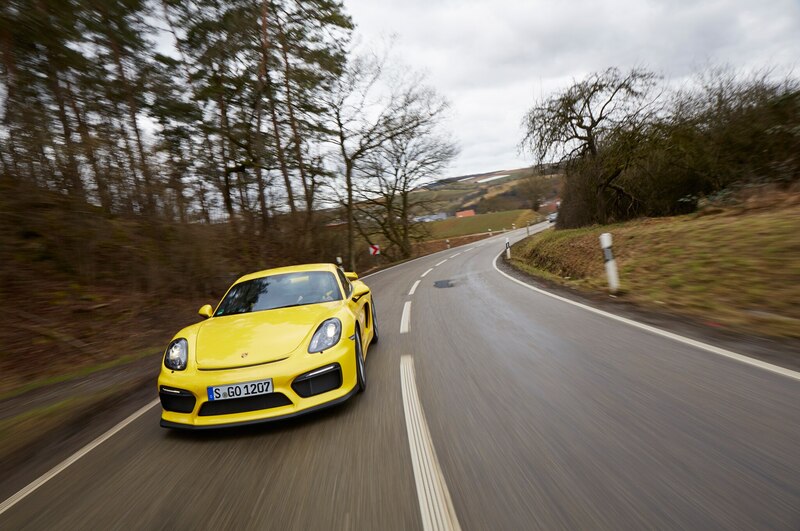 We fire up the Carrera S-sourced 3.8-liter flat-six and head off on Stuttgart roads that are still coated with what was freezing rain only a couple hours ago. 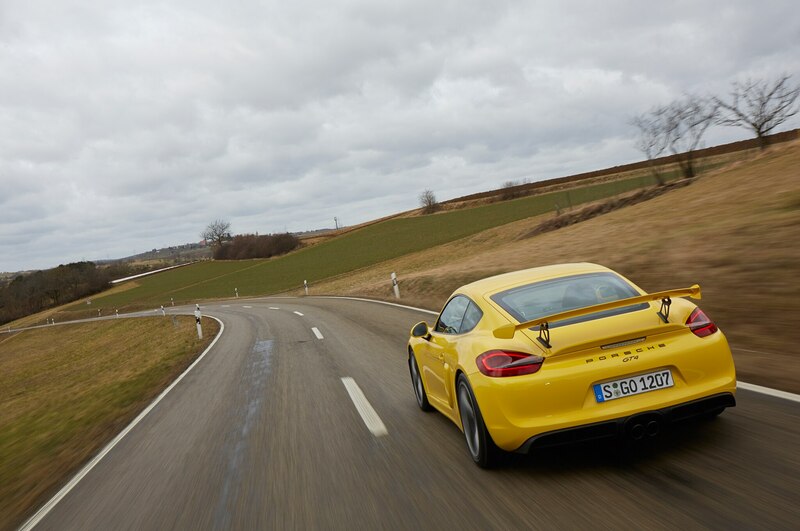 The first stretch of autobahn is restricted to 75 mph. 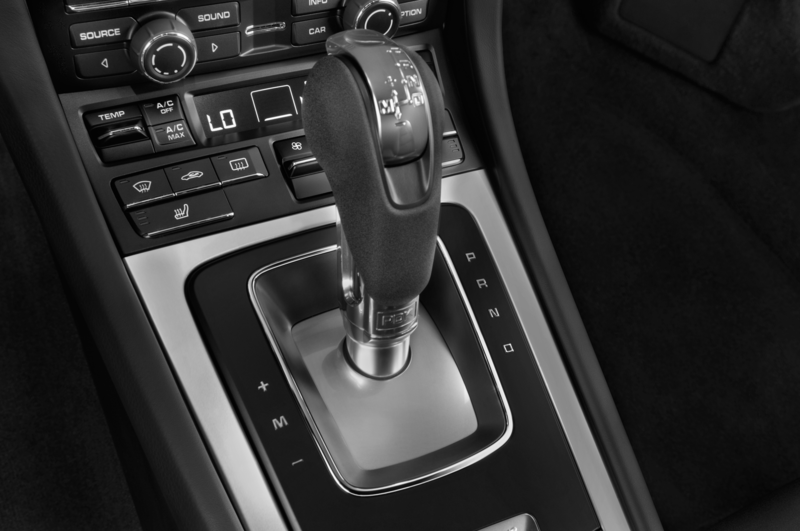 The instant the ban lifts, we shift down into third and give her stick. 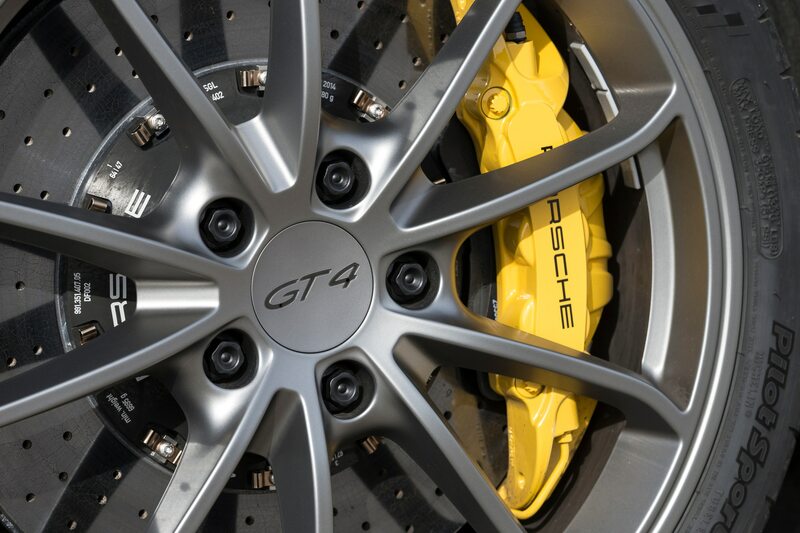 The naturally aspirated six picks up at 4,750 rpm, where peak torque of 309 lb-ft comes on, but it really wails around 7,400, when it delivers all 385 hp. 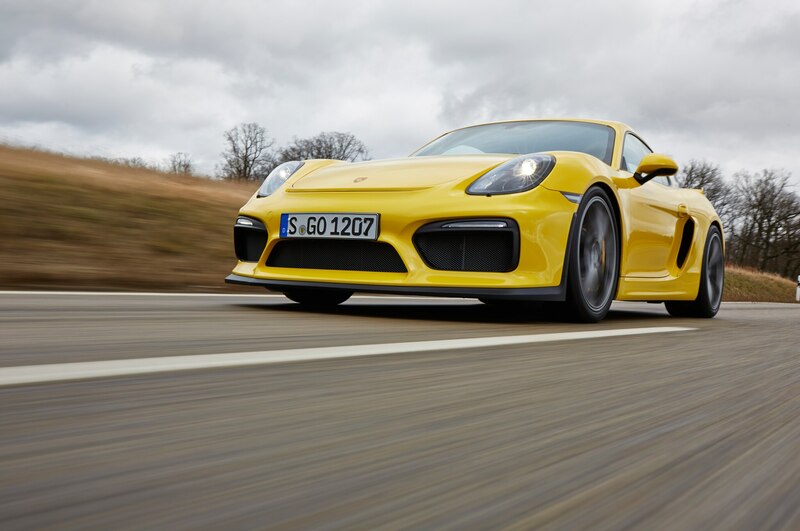 Porsche’s next-generation turbo engines, just around the corner, will deliver more power and achieve better fuel efficiency (the GT4 is 15 percent worse than the Cayman GTS on the European cycle), but they won’t give you goosebumps like this engine does. 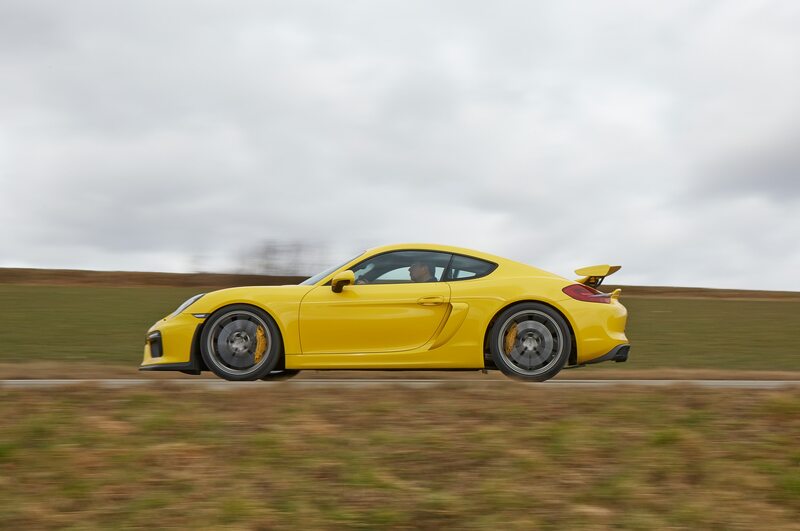 The 2016 Porsche Cayman GT4 feels rock solid at autobahn spends, barely irritated by washed-out tarmac, yawning expansion joints, and impromptu surface variations. 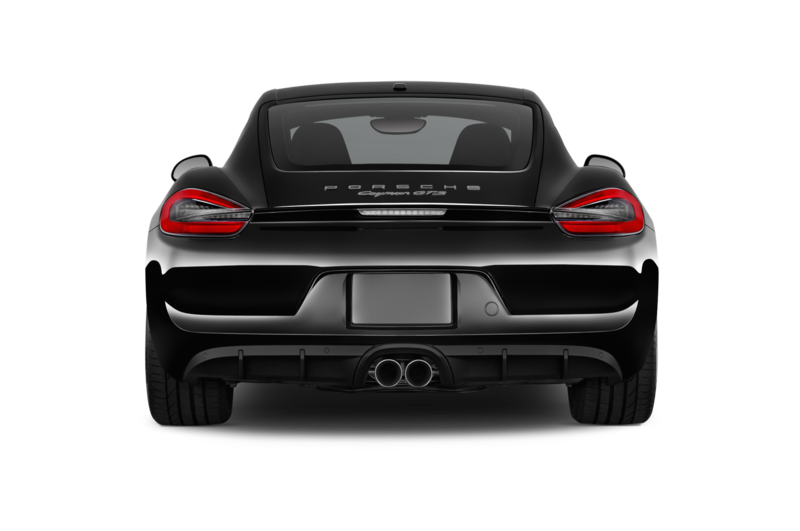 At 145 mph, traffic starts clogging our flight path, and soon after the next speed limit is enforced with radar-eyed vigor. 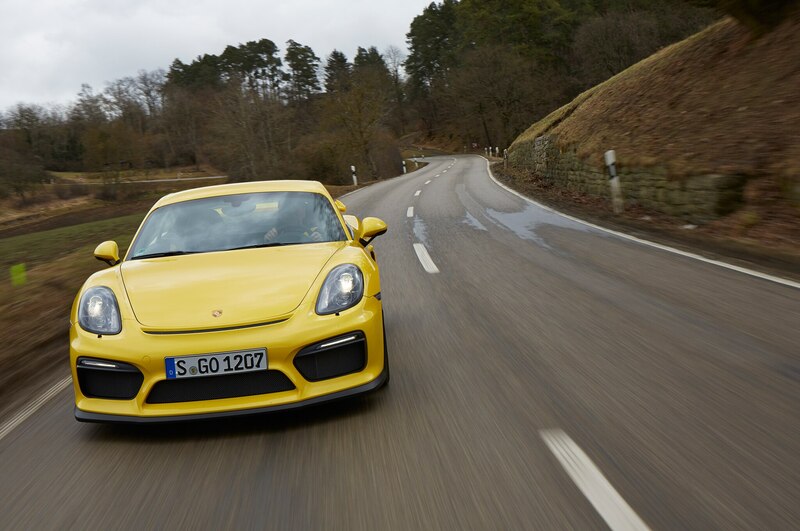 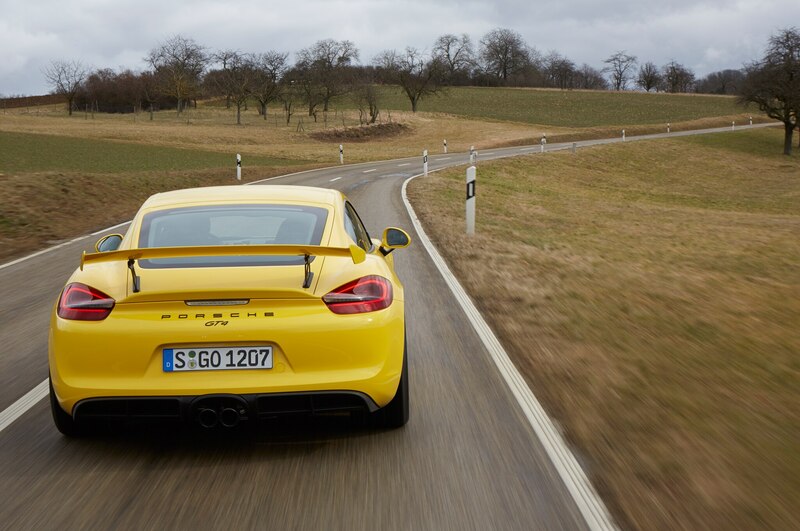 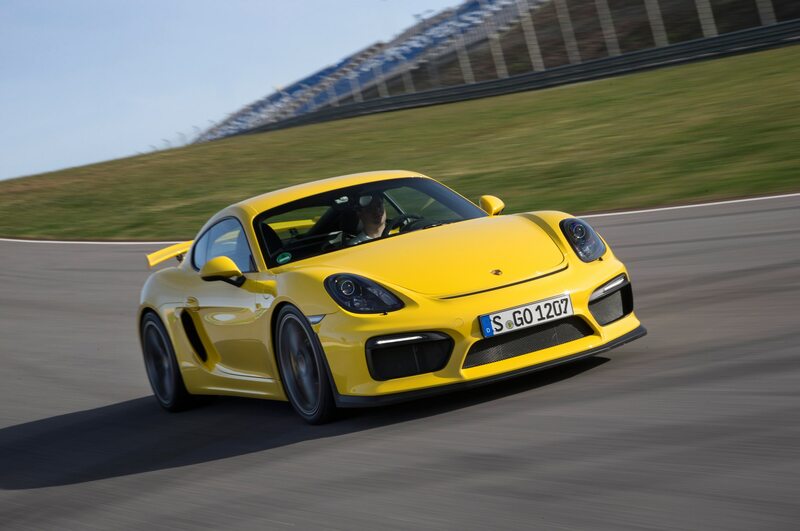 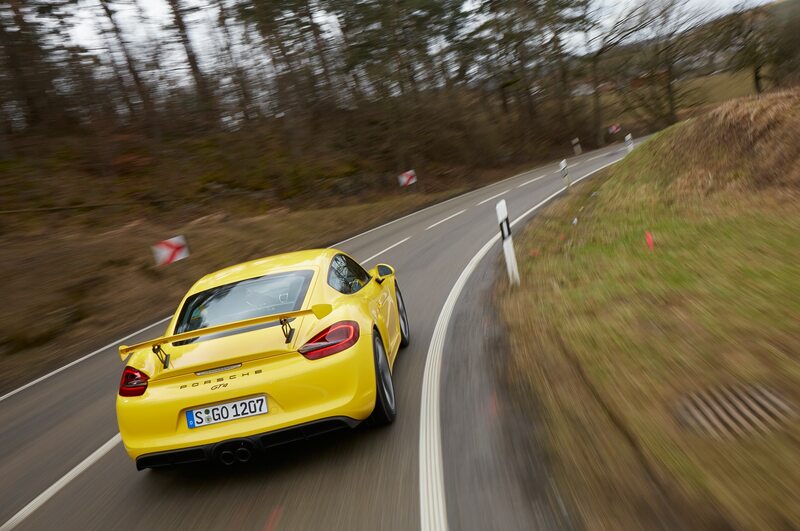 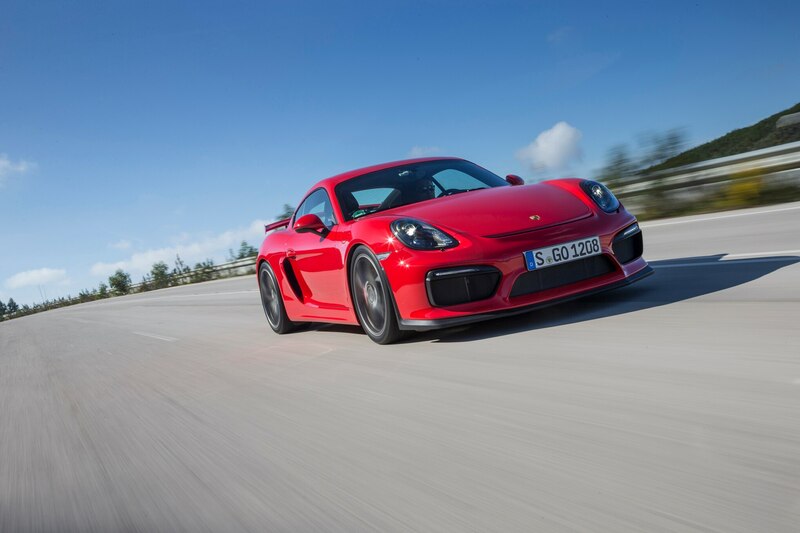 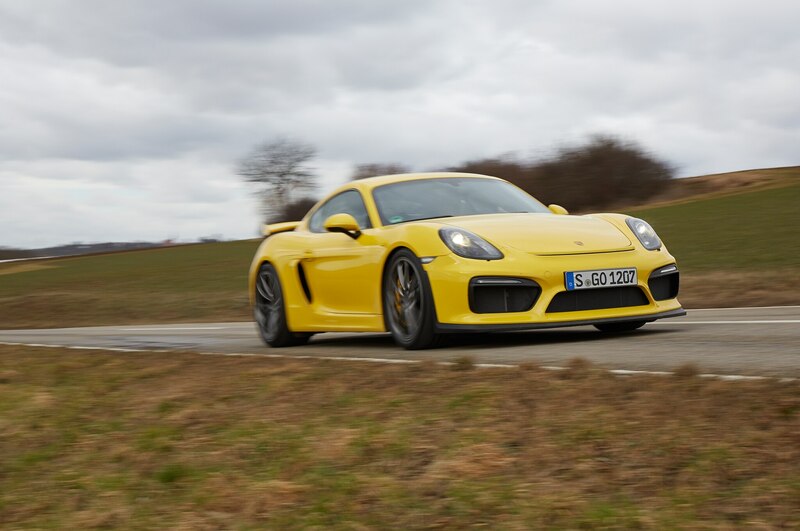 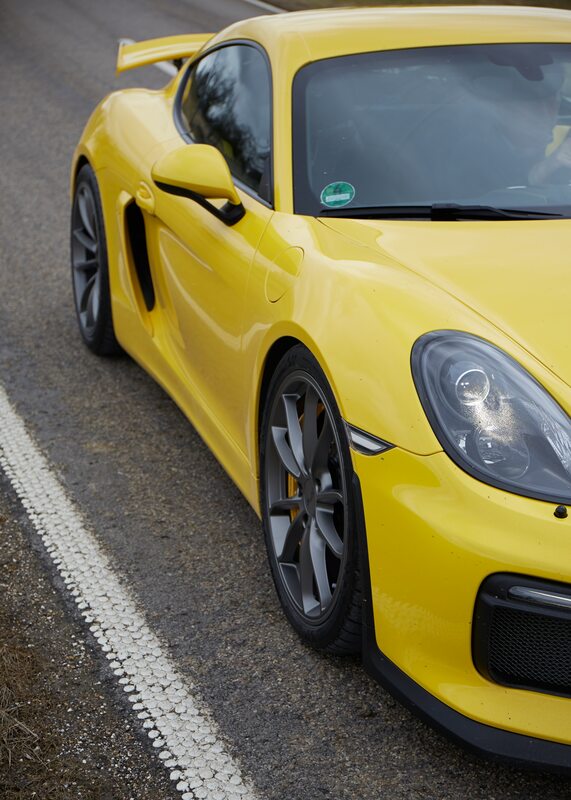 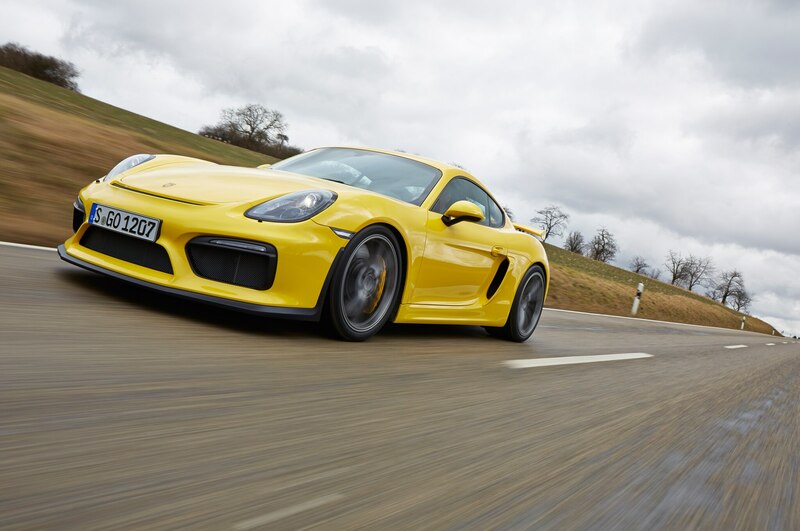 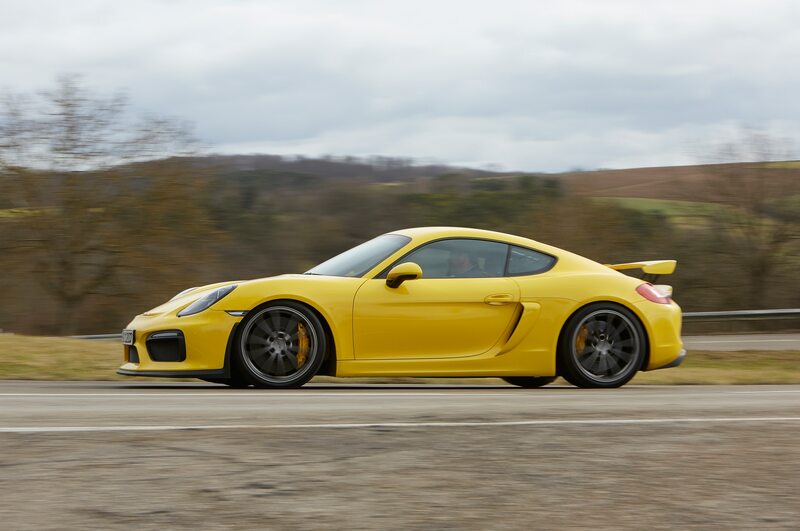 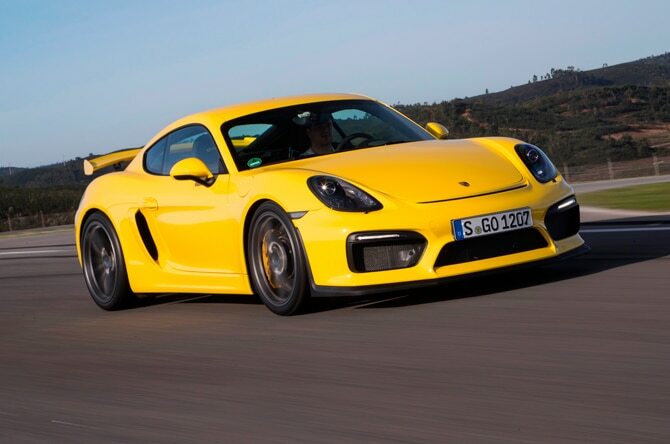 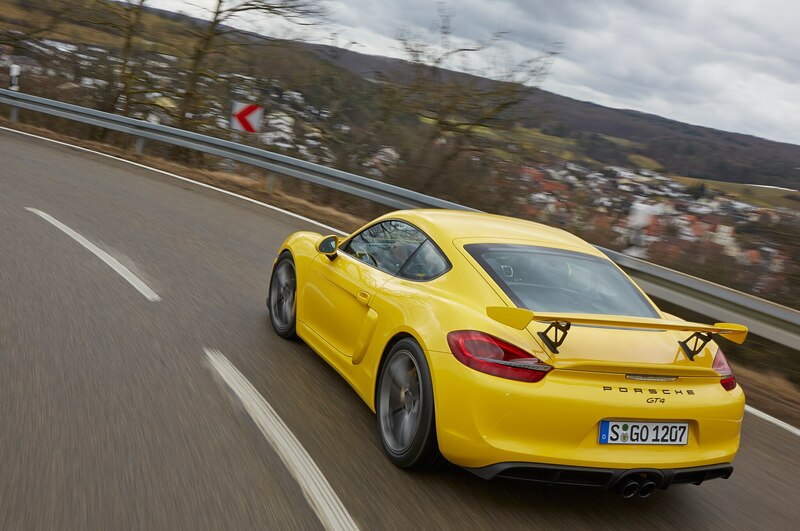 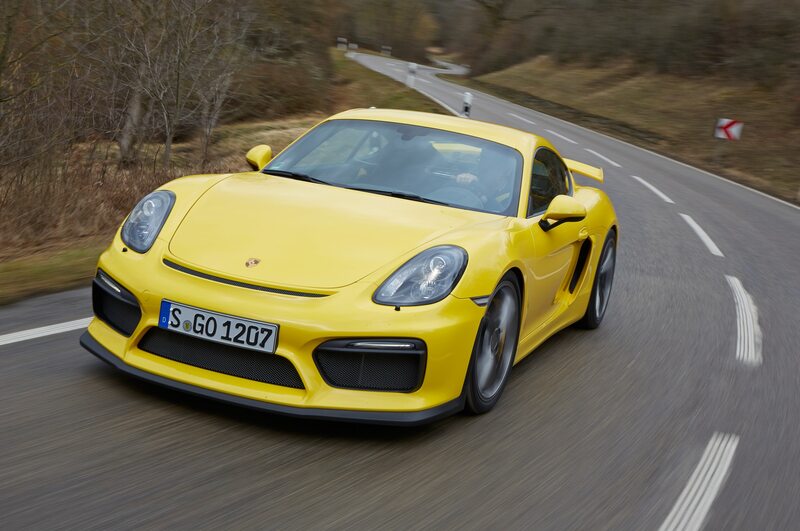 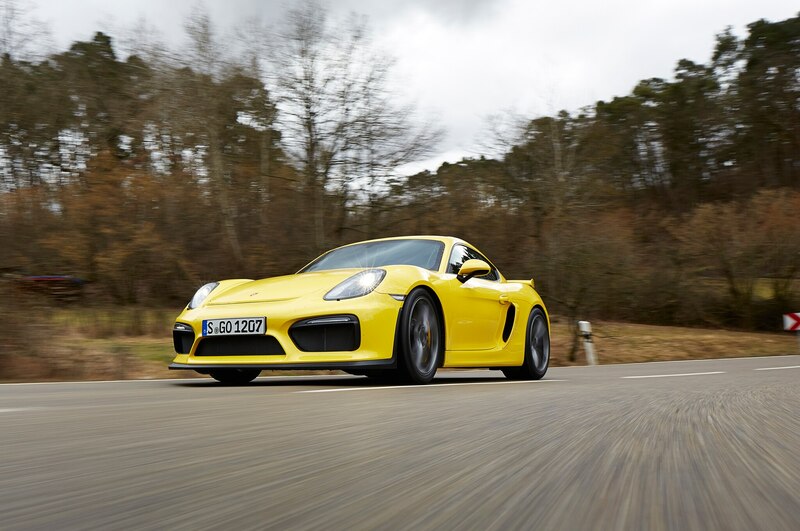 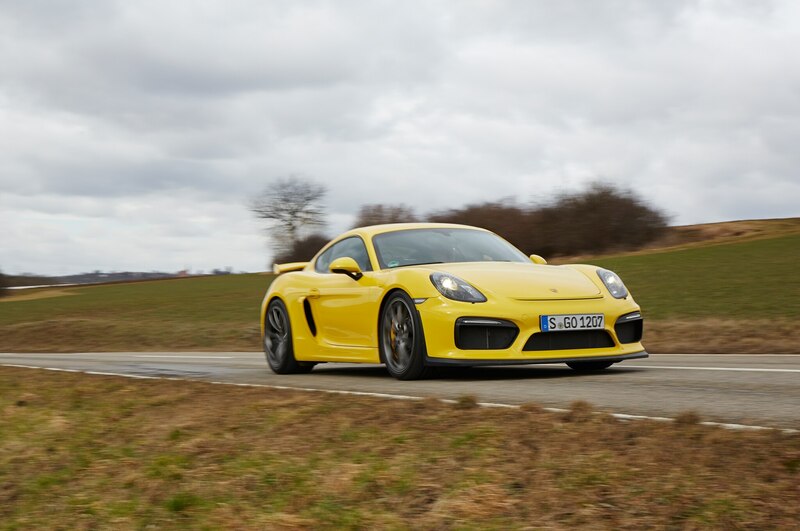 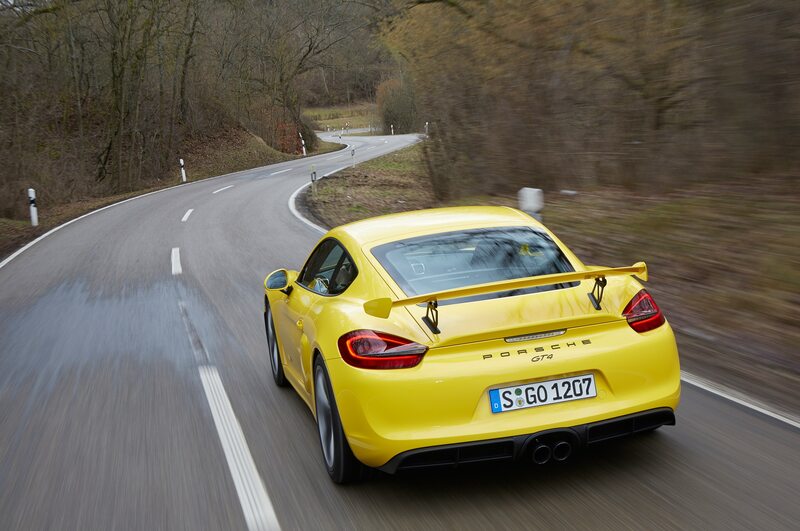 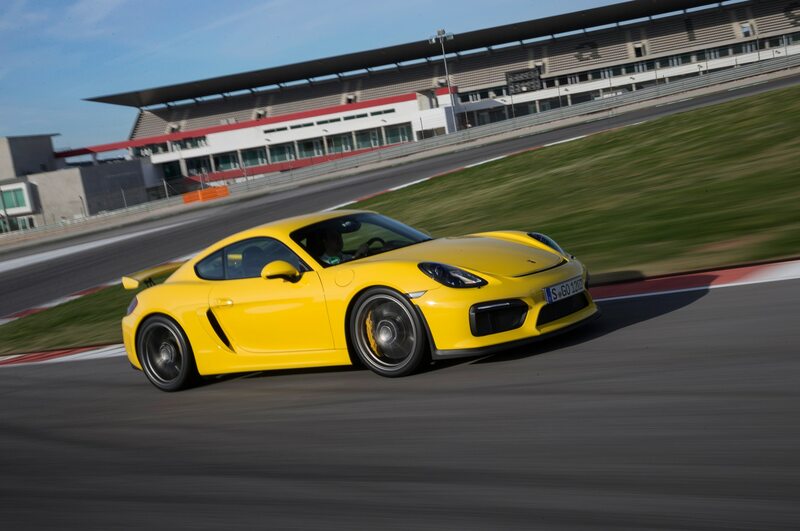 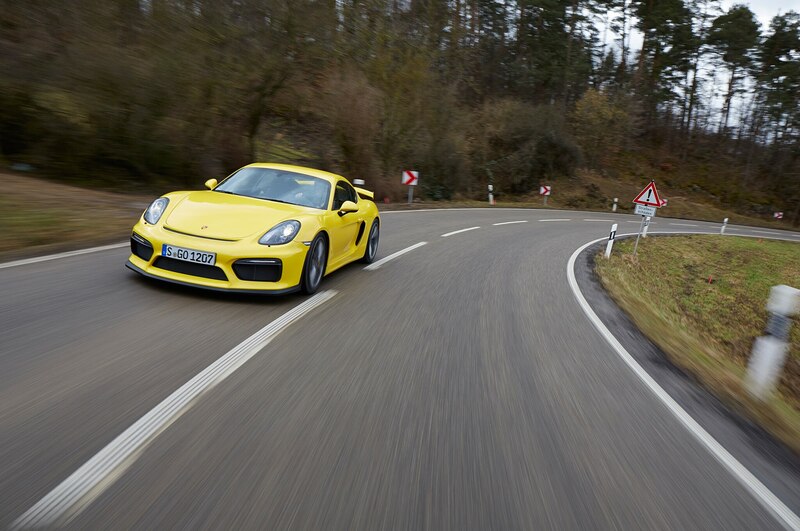 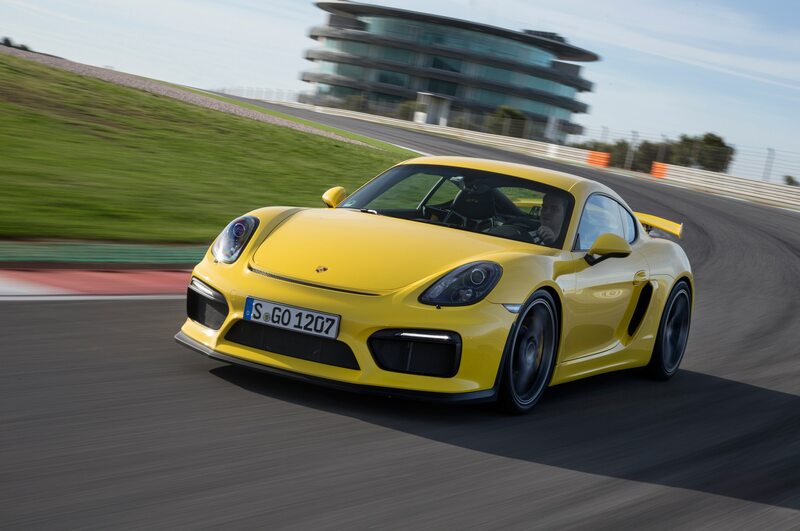 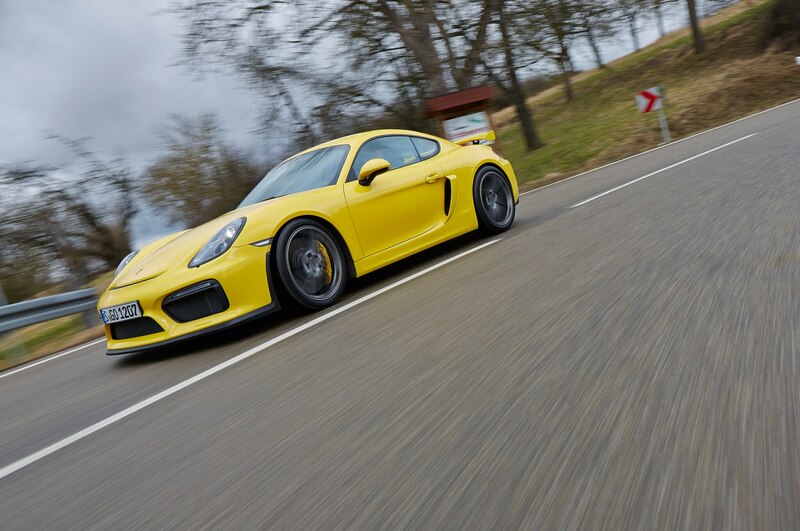 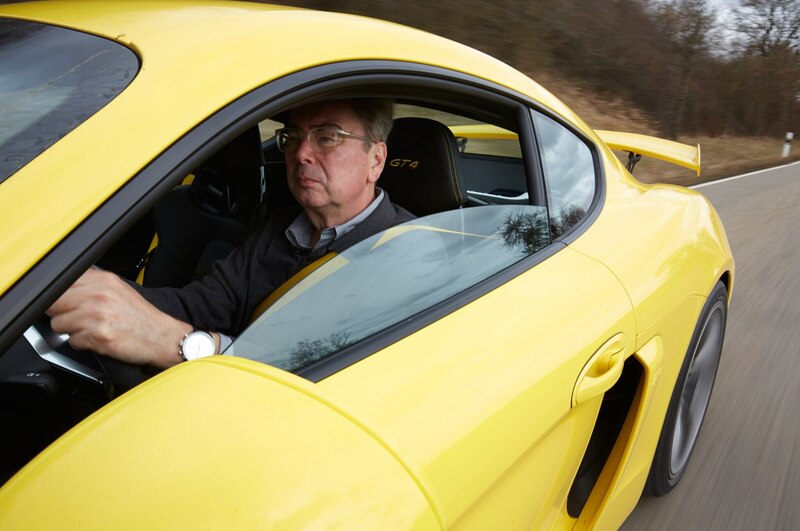 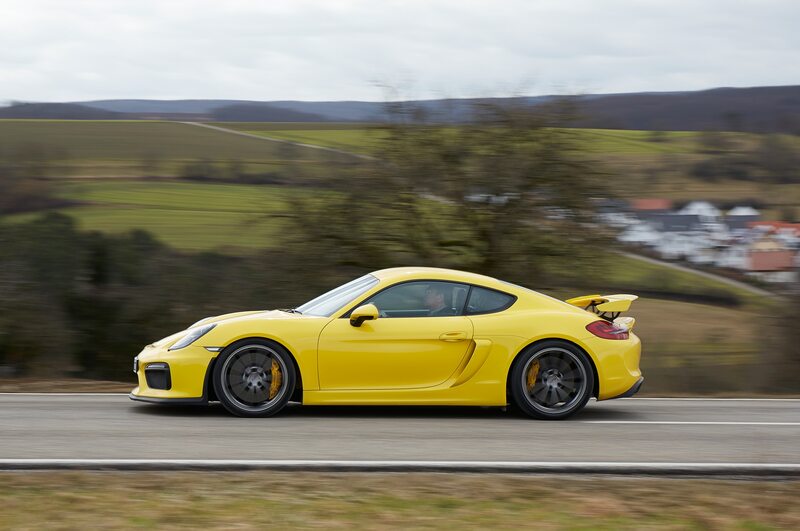 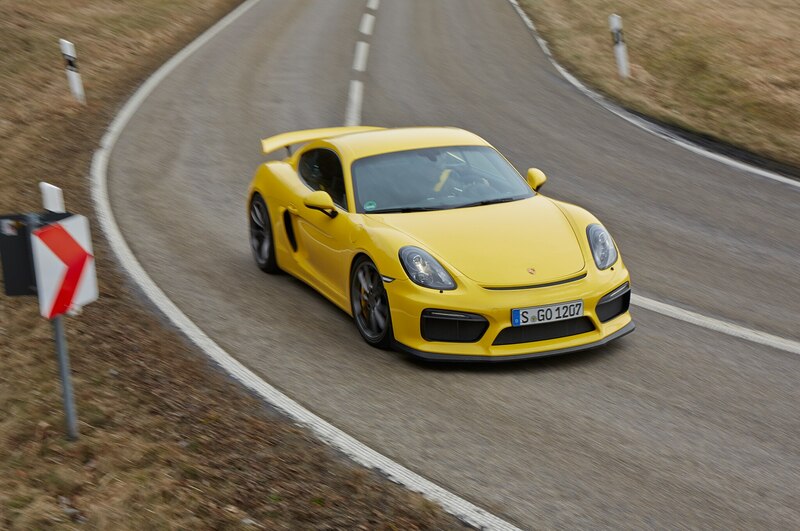 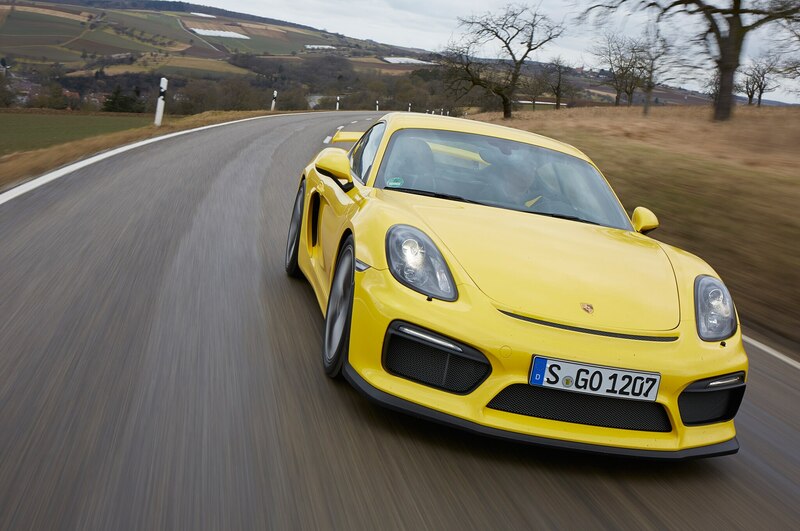 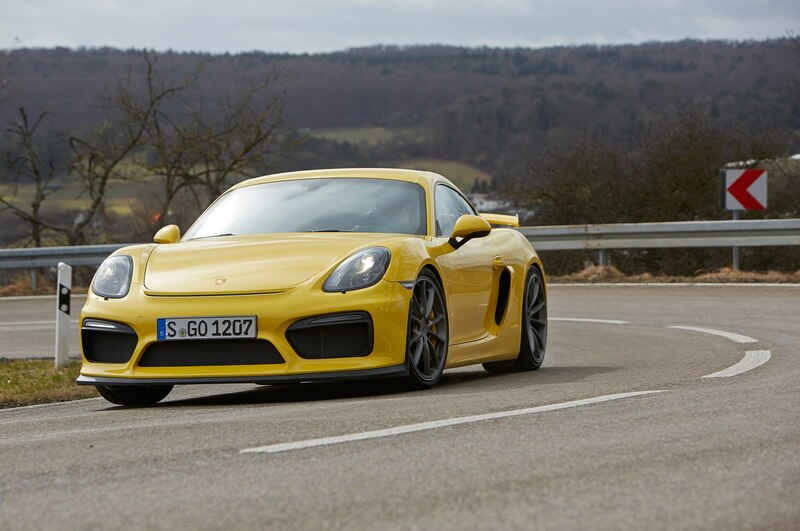 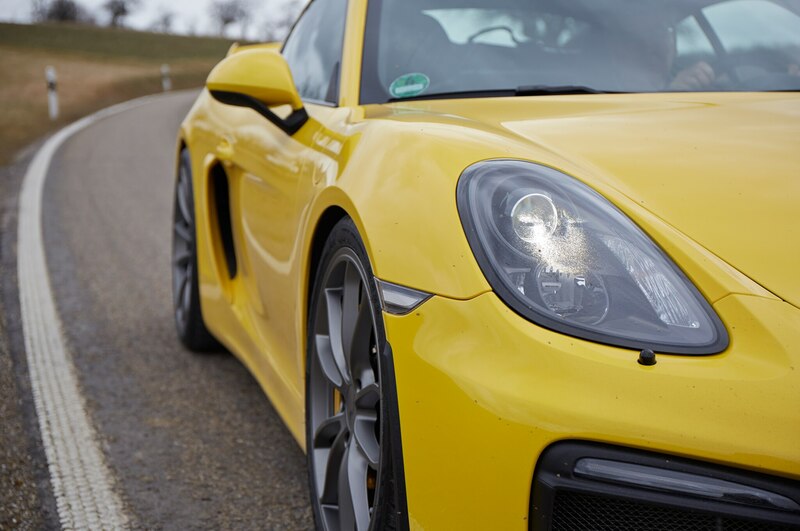 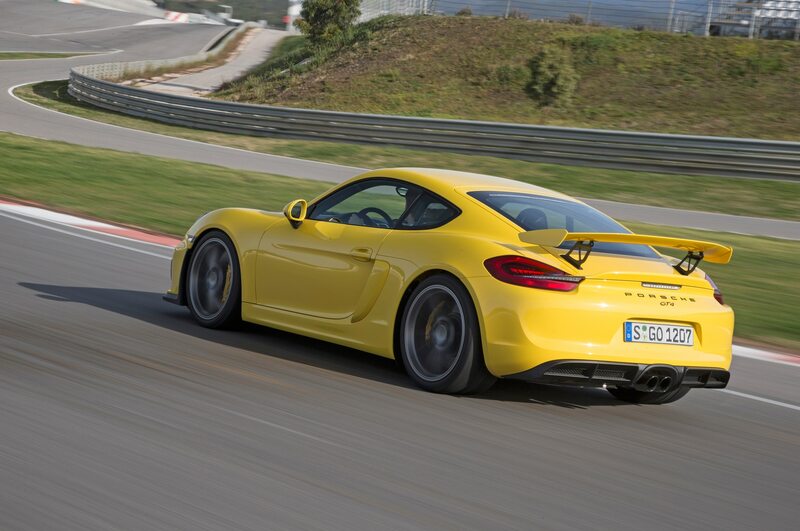 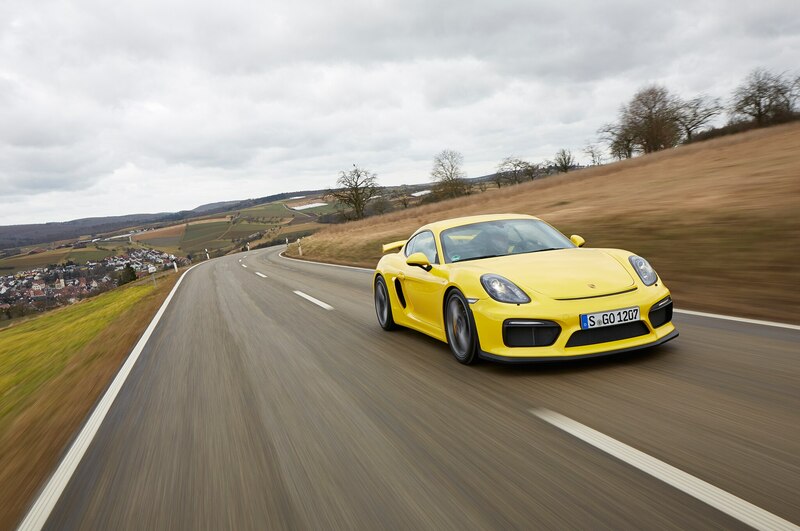 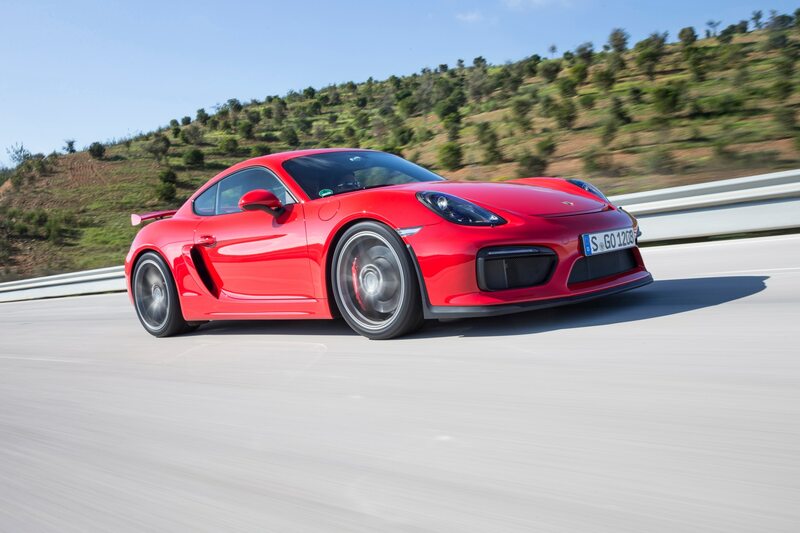 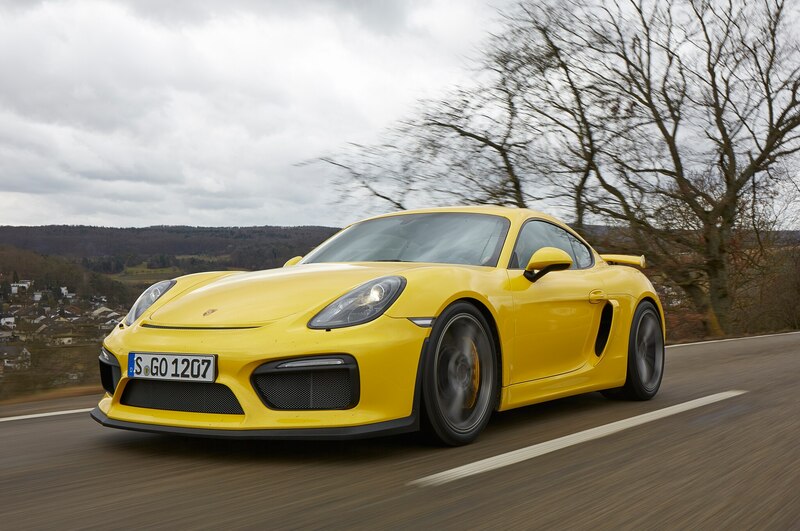 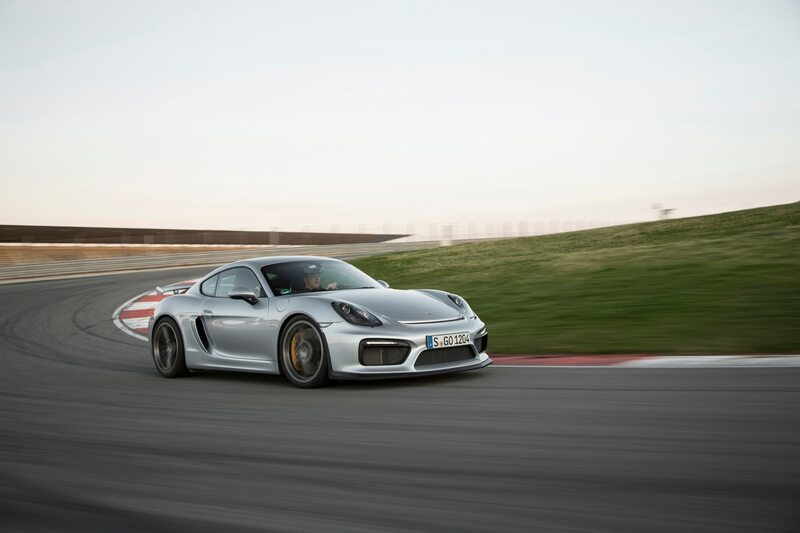 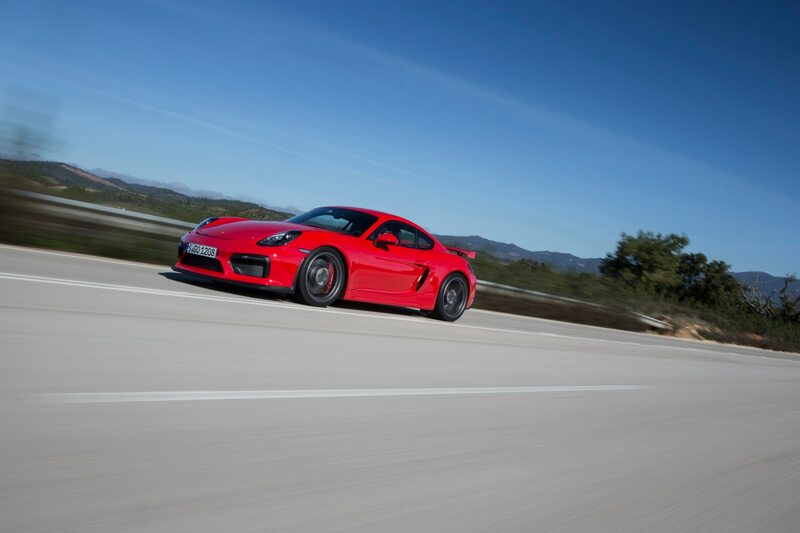 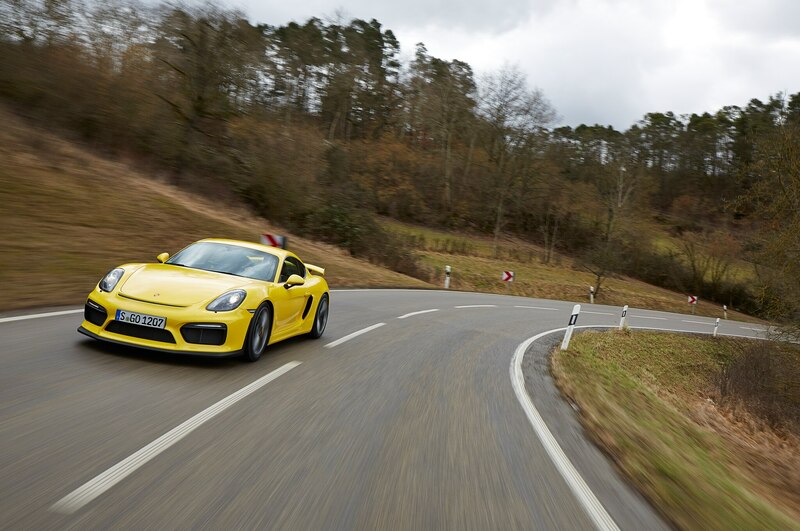 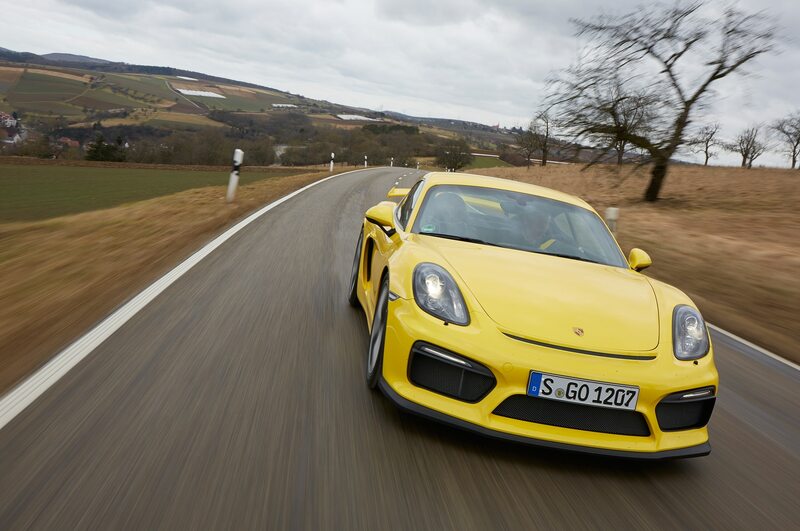 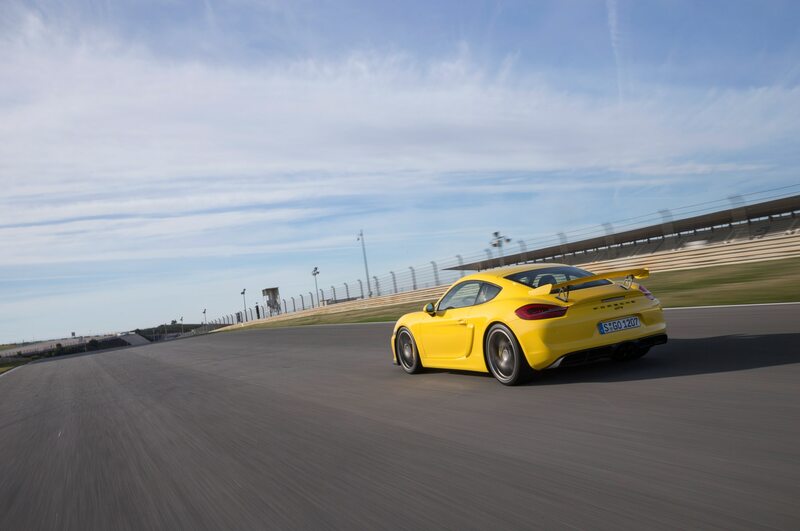 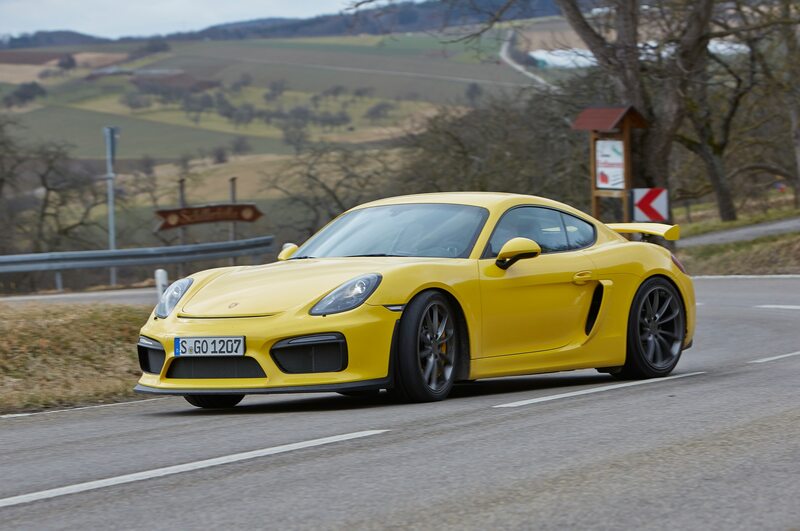 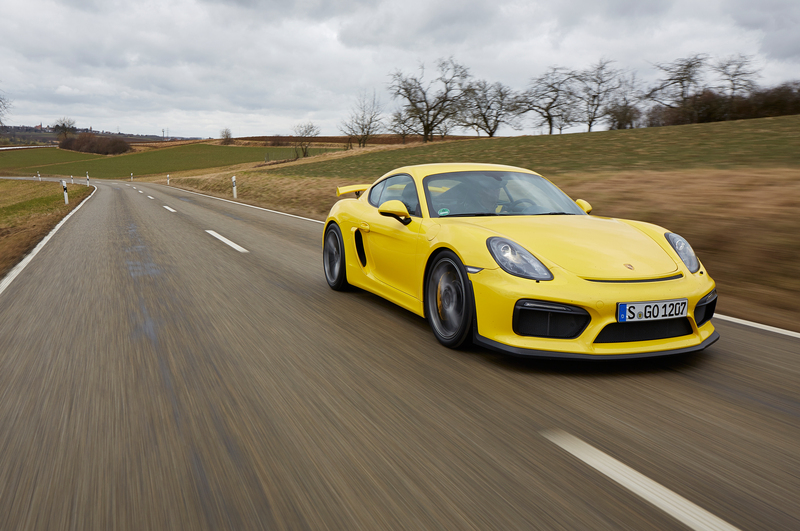 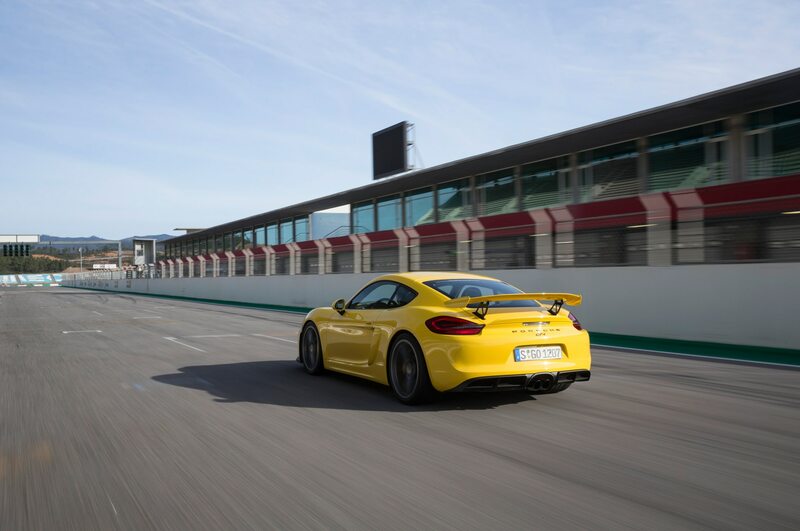 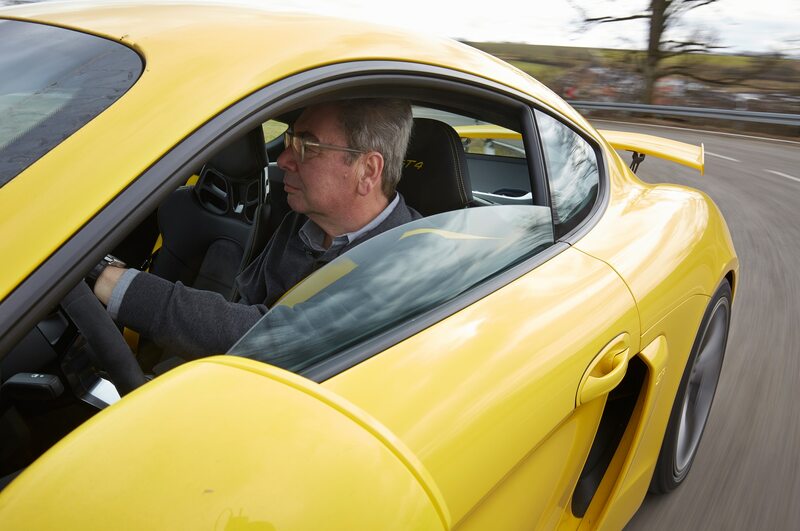 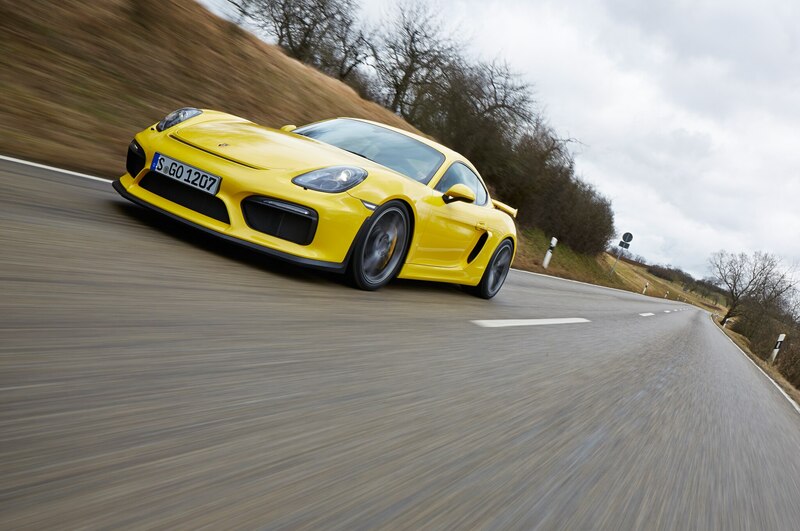 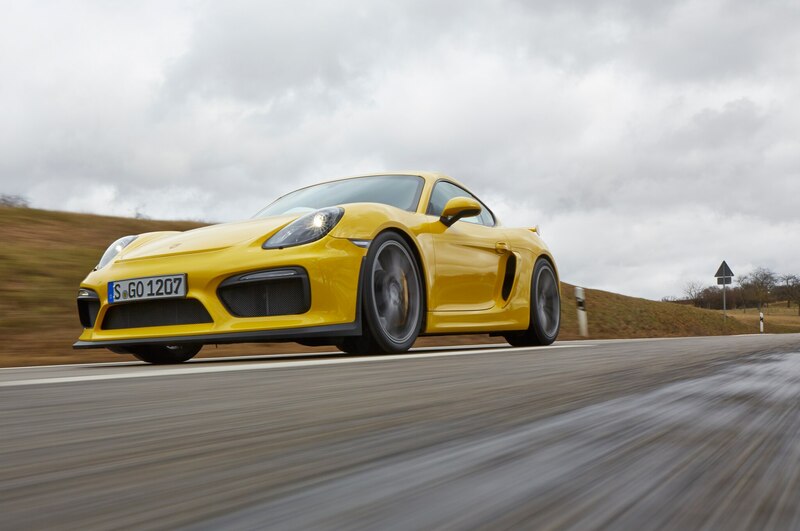 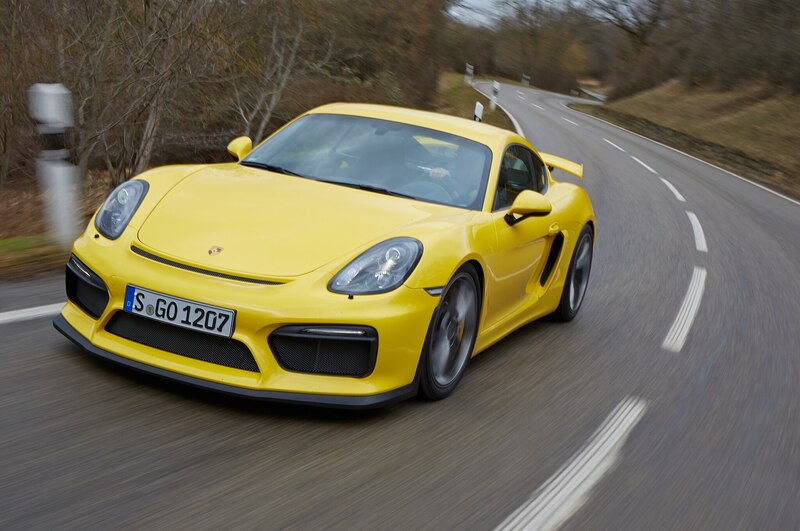 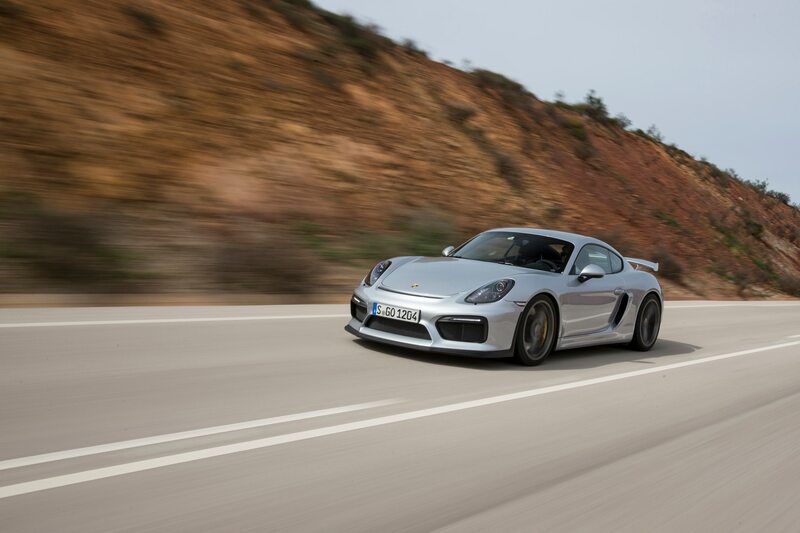 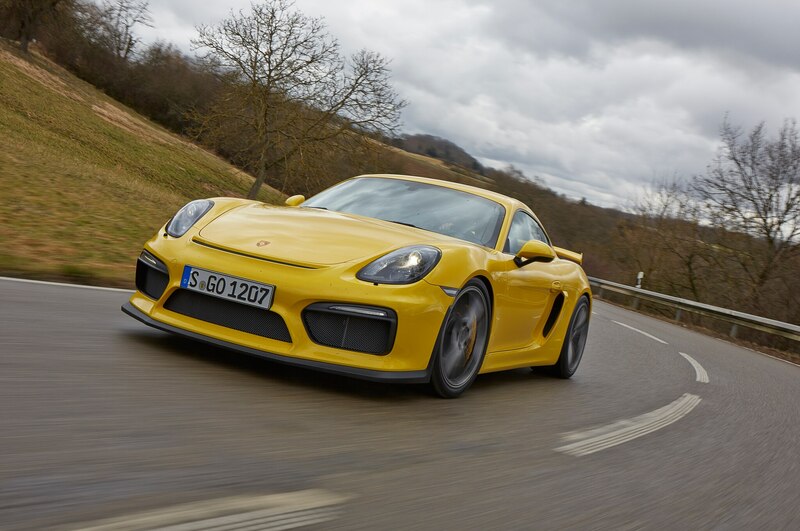 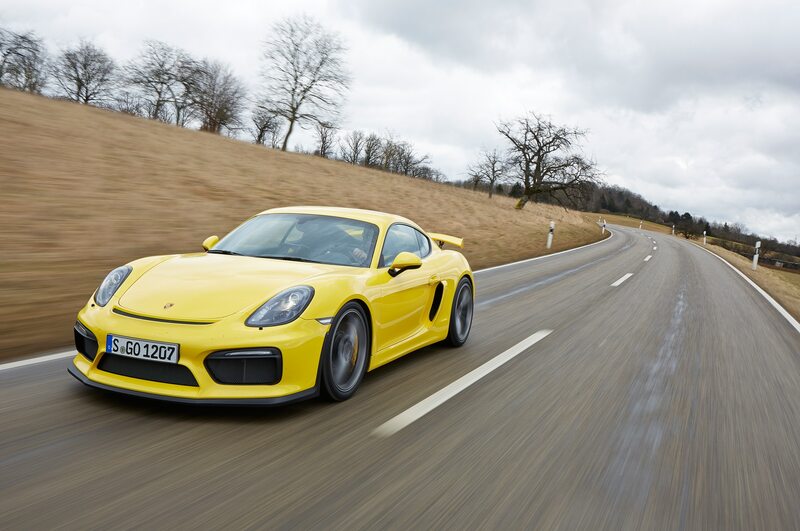 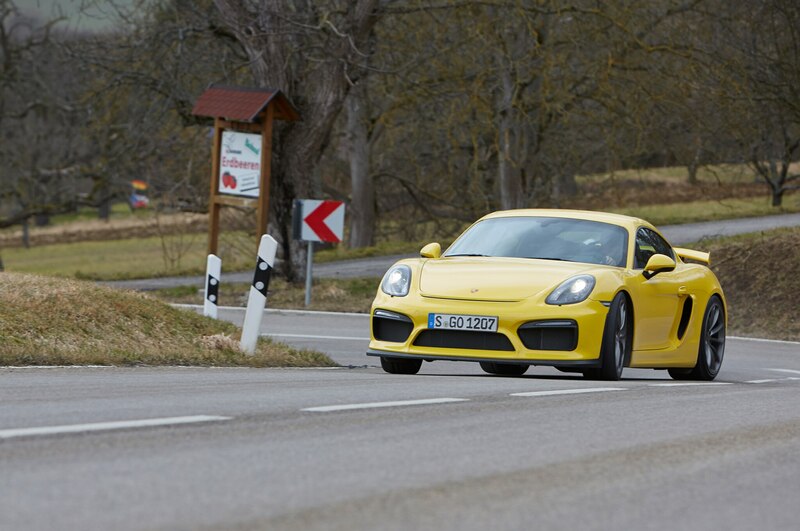 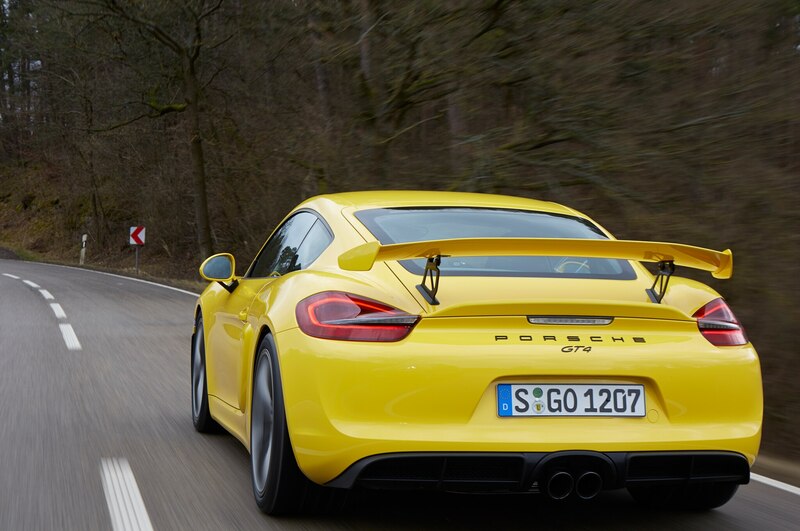 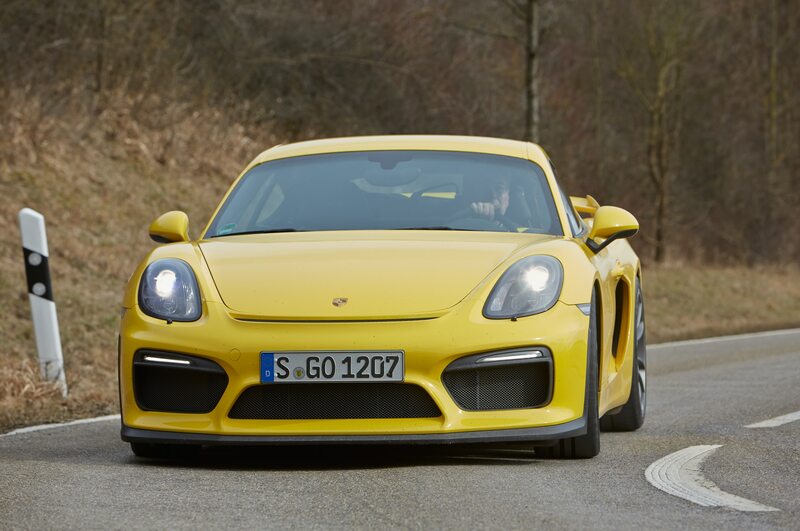 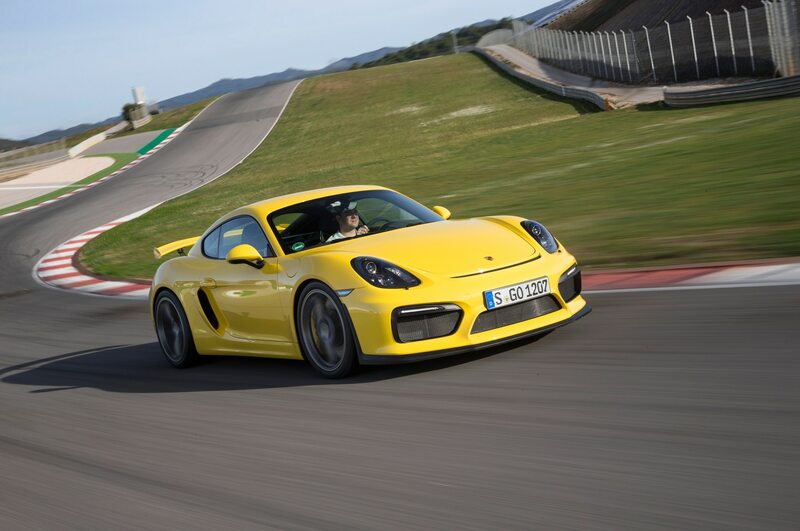 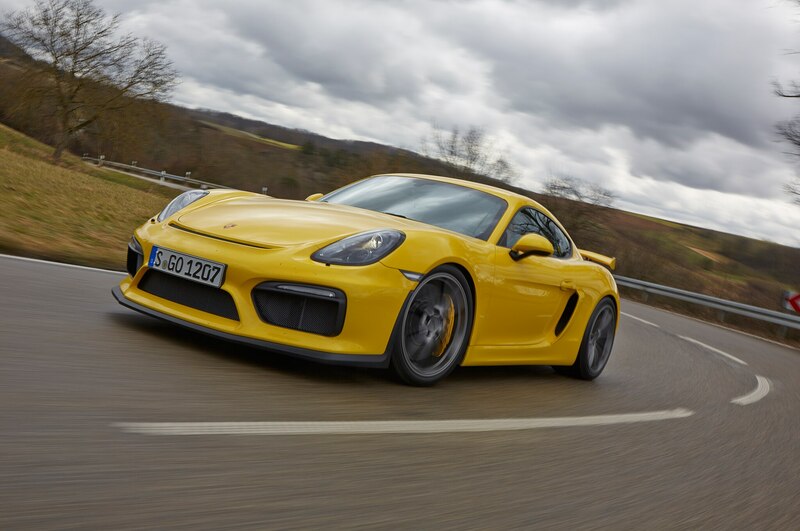 On an empty, dry, and reasonably straight autobahn, the Cayman GT4 can top 183 mph. 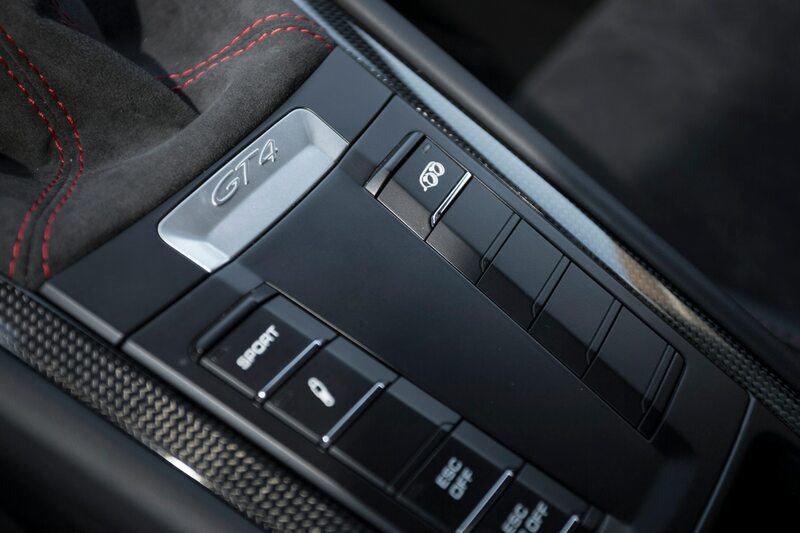 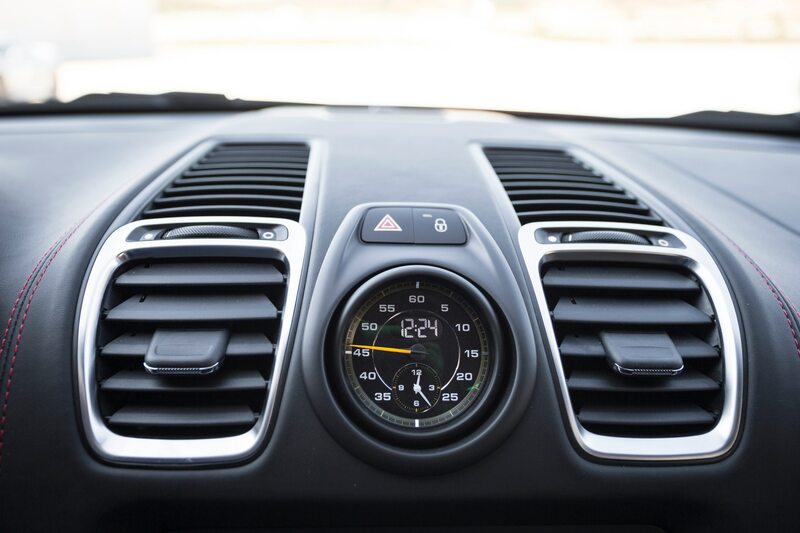 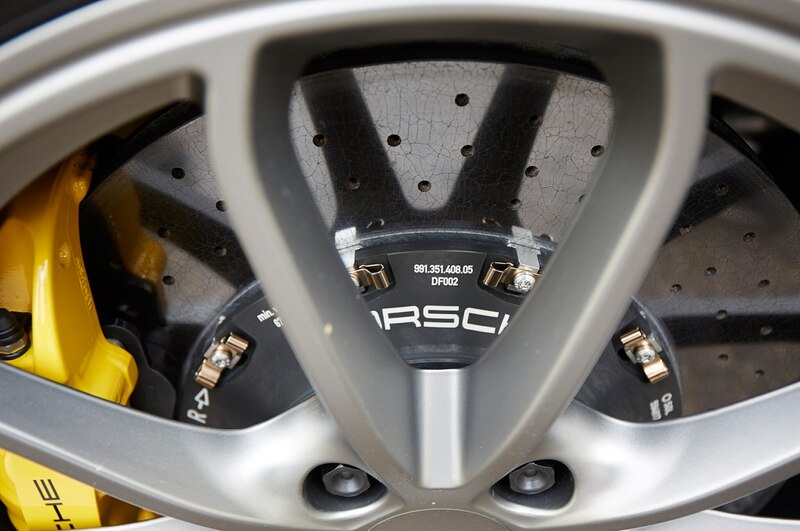 Simplicity is the watchword for this car, and so the GT team pruned the electronic systems and adjustable doodads that are so prevalent on modern Porsches. 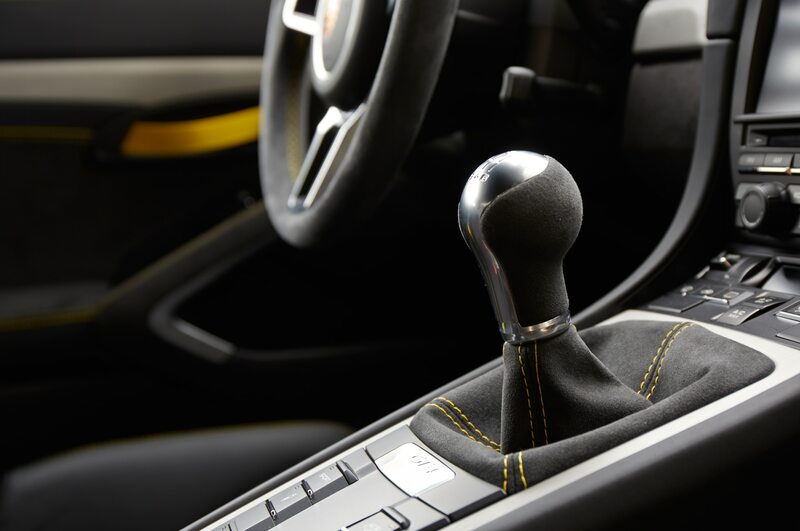 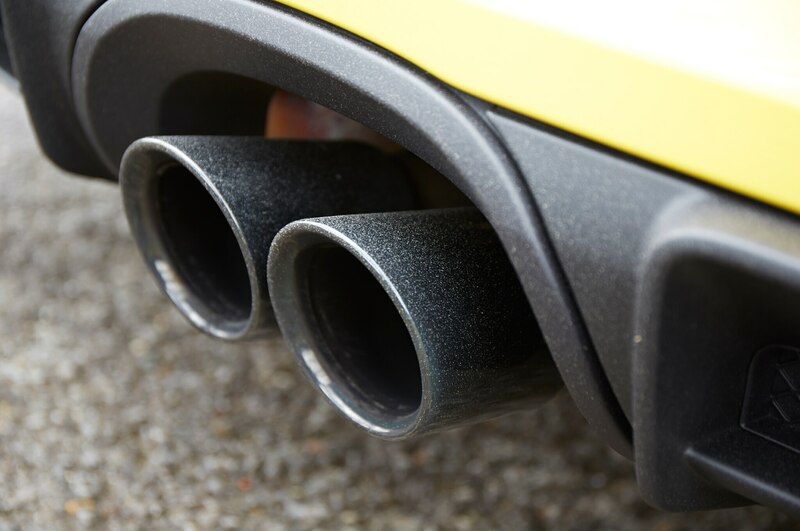 The active dampers, for instance, know only two settings: Normal, which is tailor-made for the bumpy Nordschleife, and Sport, which is just fine for a smooth GP circuit. 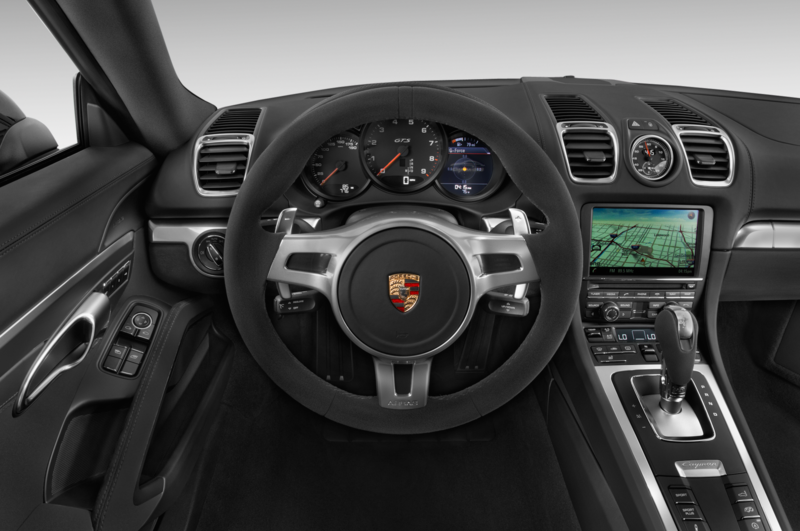 There is no swooshy Comfort mode and no please-number-your-bones Sport Plus calibration. 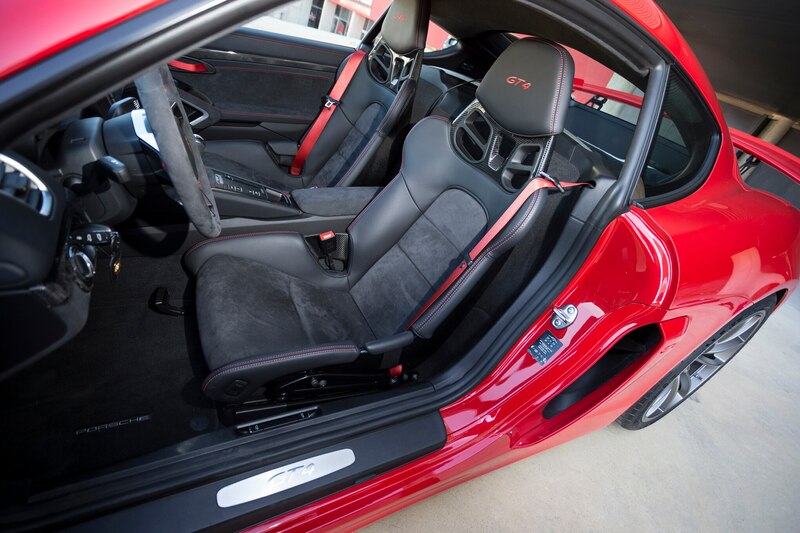 Sure enough, it rides just fine. 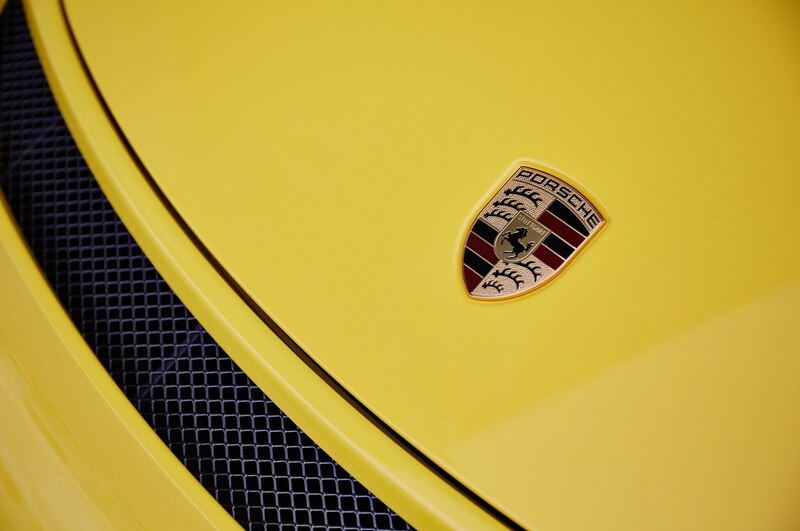 The yellow streak does not exactly love manhole covers, sleeping policemen, and cobblestone sections, but most of the time the Porsche soaks up pavement imperfections with aplomb. 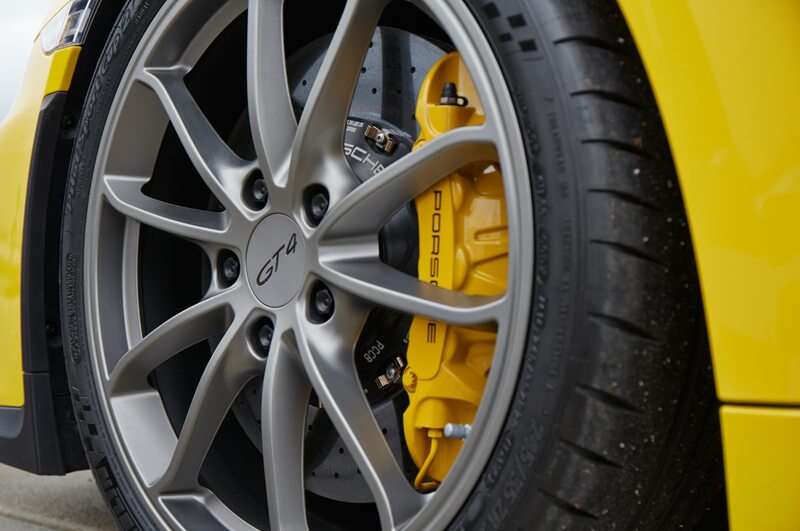 The steering rack, along with the front axle and suspension, wheel bearings, shock absorbers, and front tires come straight out of the GT3. 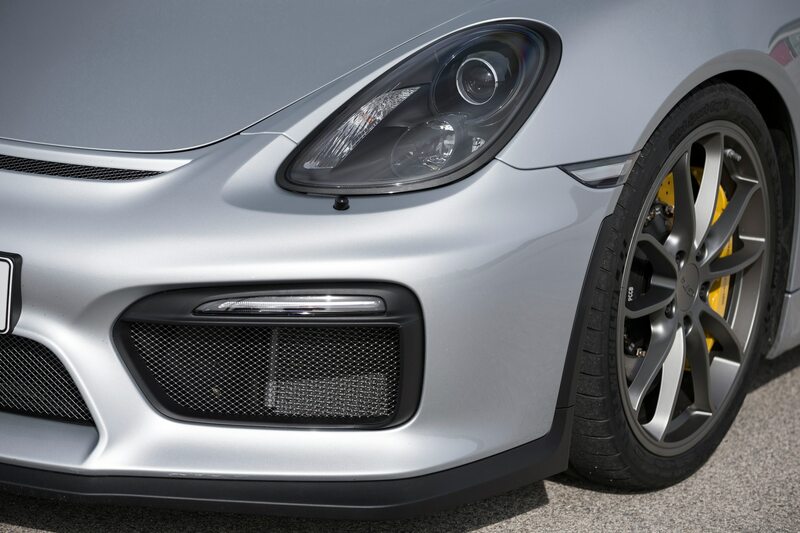 The steering feels reassuringly meaty on-center and stays steady over camber changes, yet is quick and eager to turn in. 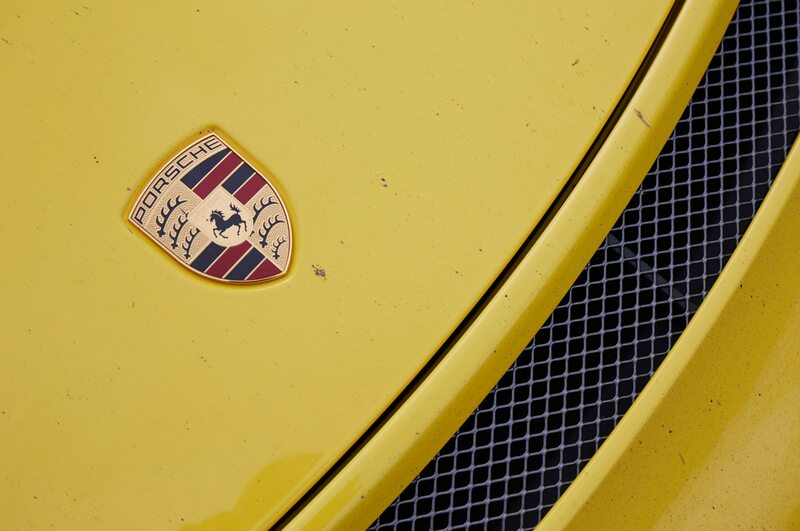 It is, above all, utterly predictable. 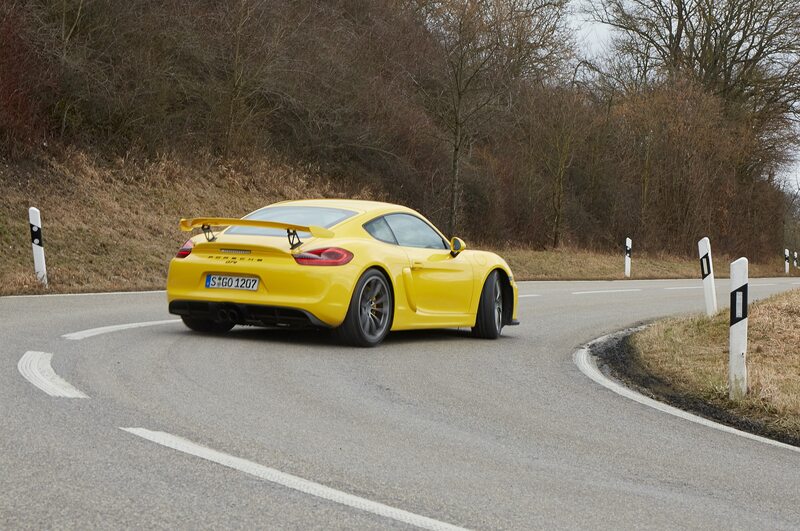 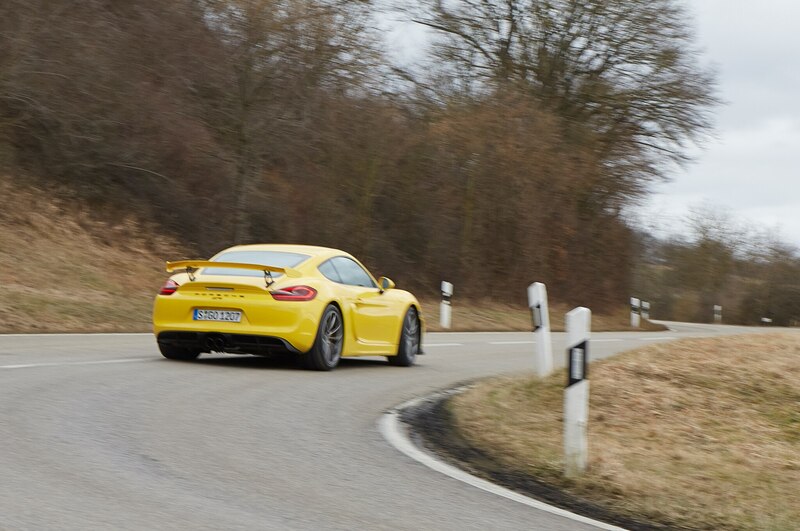 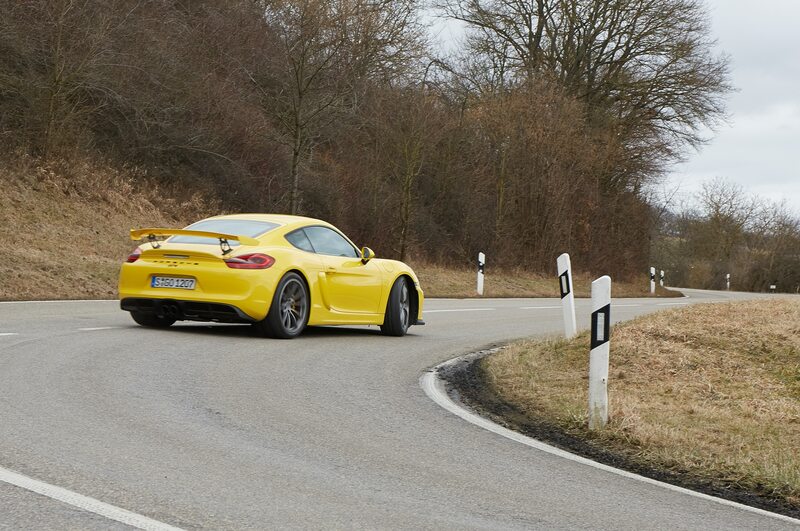 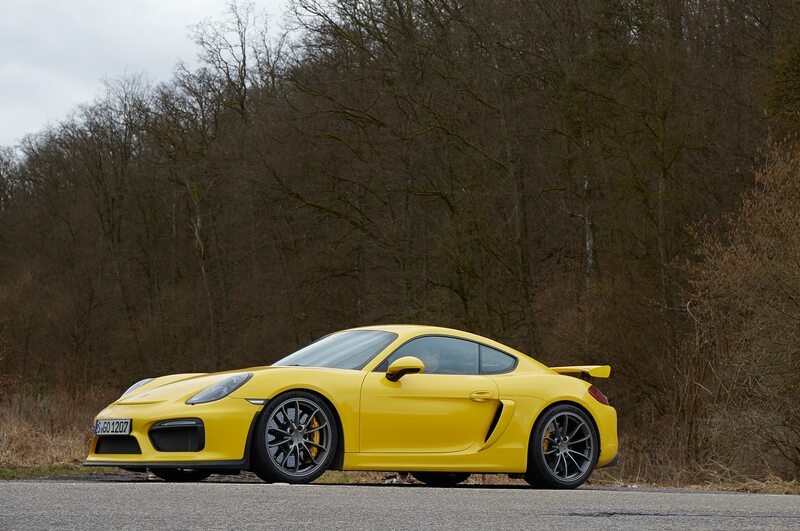 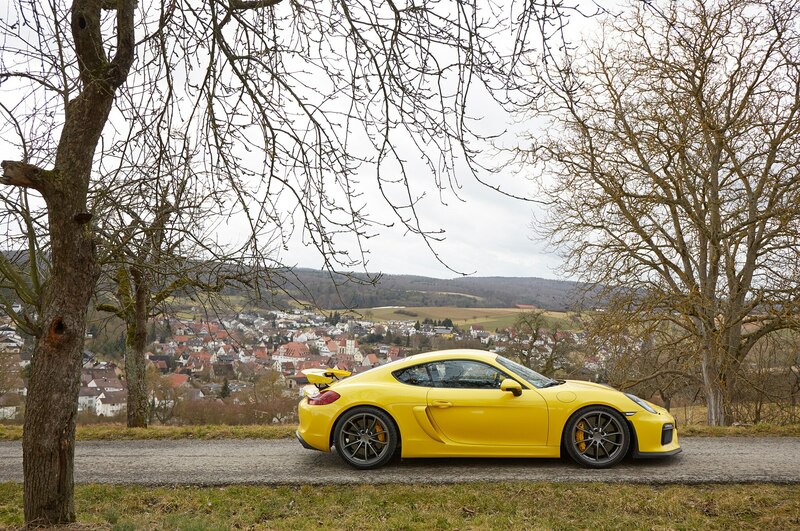 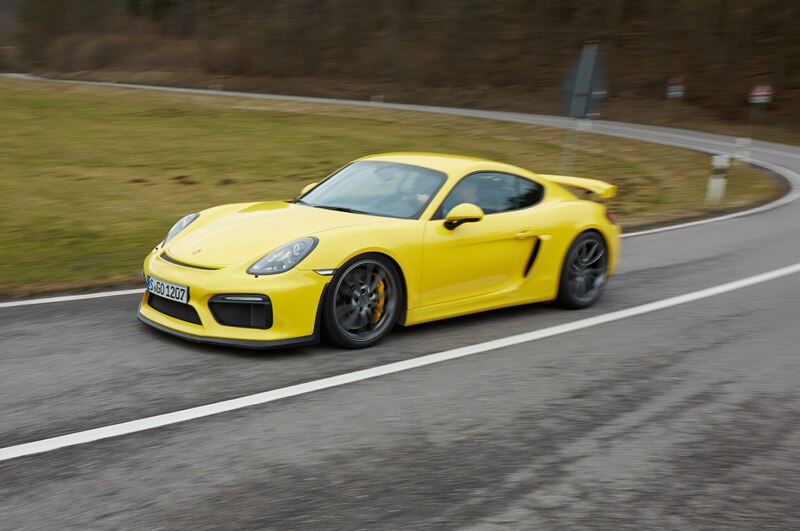 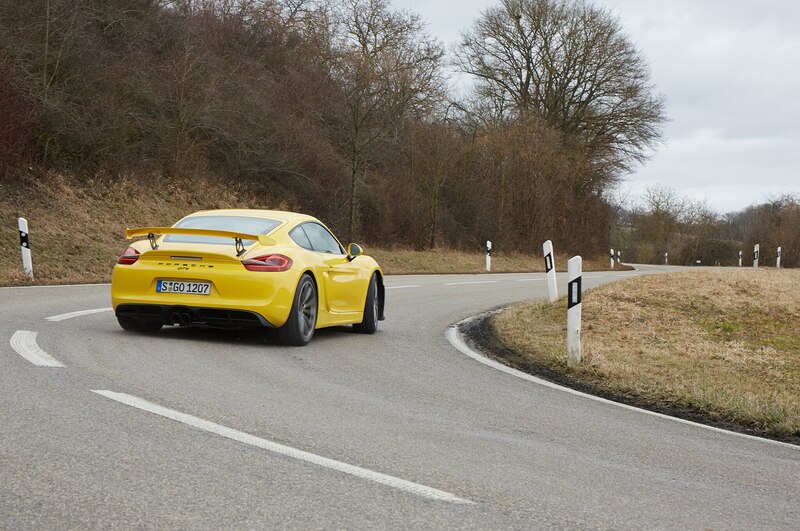 The country roads in the Stuttgart-Heilbronn-Karlsruhe triangle are the natural habitat for pure driving machines like the GT4. 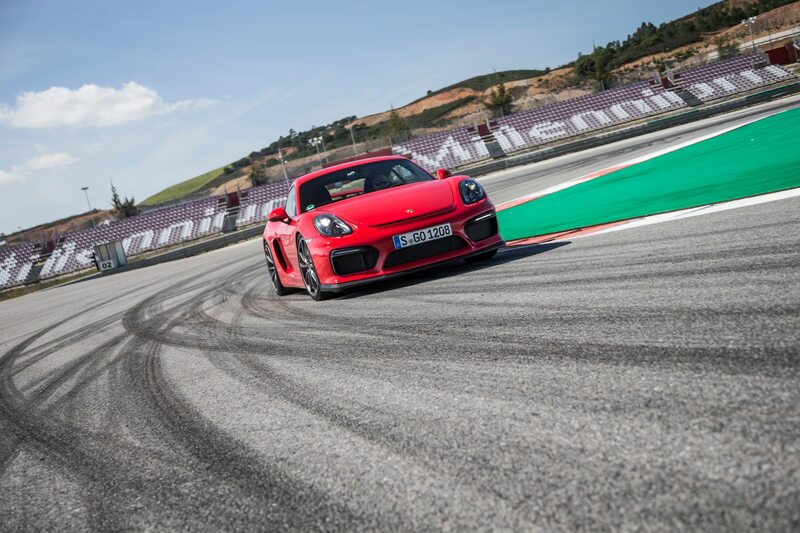 By midday, the temperature has climbed to 43 degrees, and the tarmac is now dry in places. 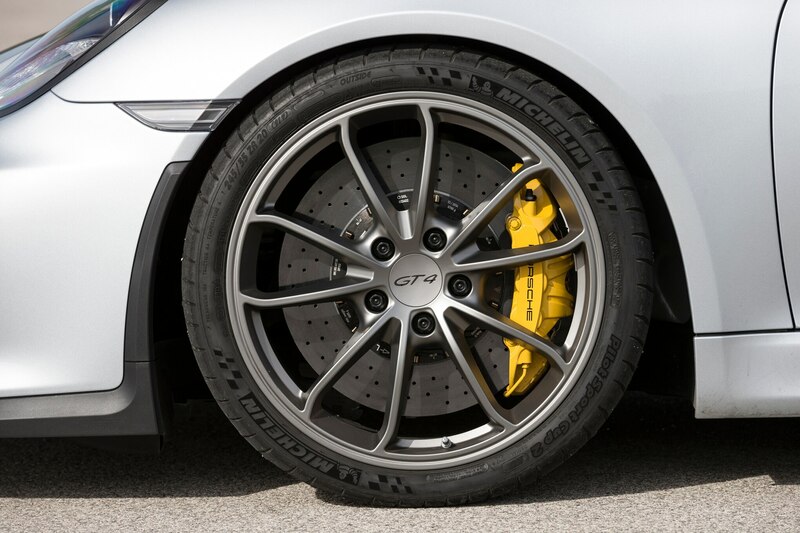 The 20-inch Michelin Pilot Sport Cup 2 tires have finally warmed up, and they bite hard as we flick the wheel. 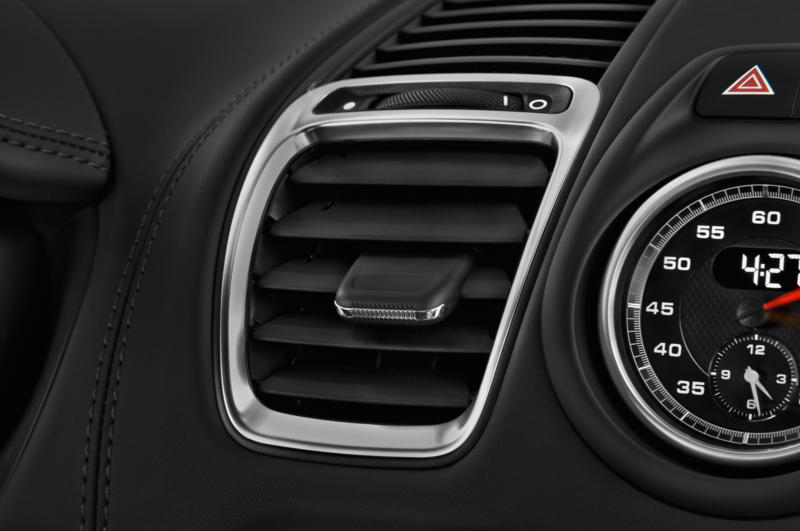 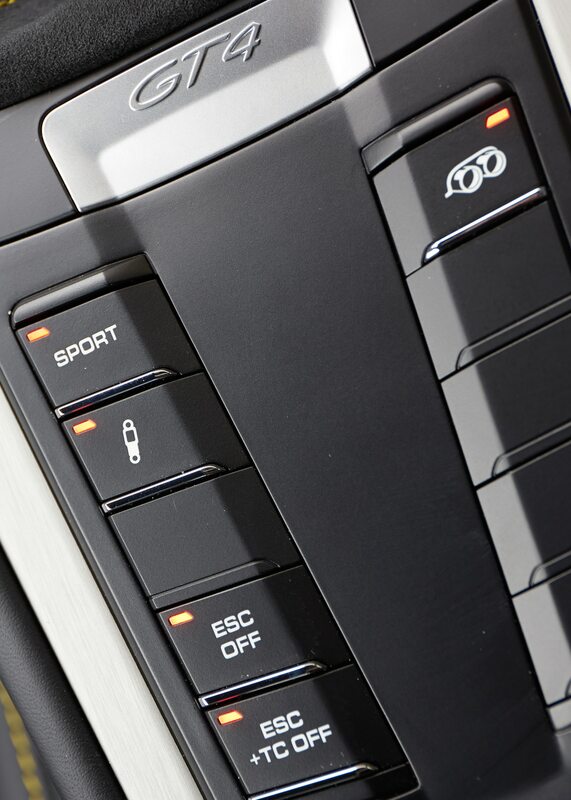 We turn off stability control and, while we’re at it, hit the Sport and exhaust buttons, too. 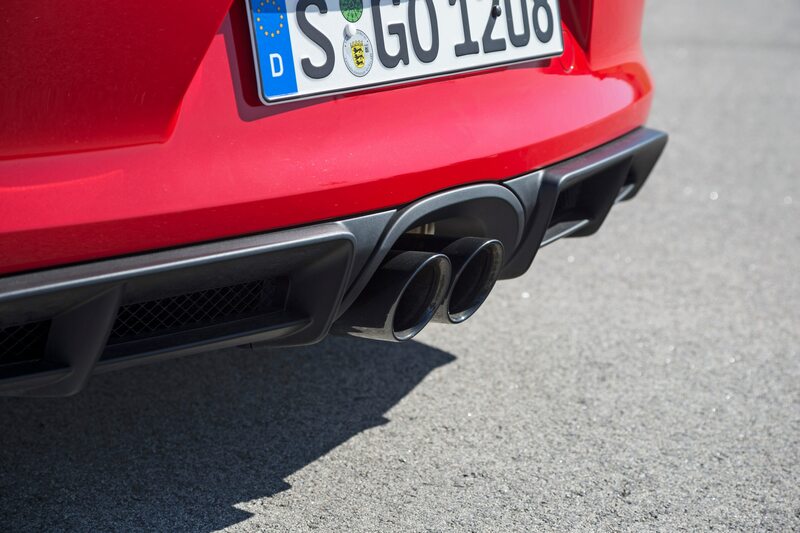 Now the twin tailpipes speak up with the rusty voice of the Marlboro Man, and the black box blips the throttle prior to downshifts. 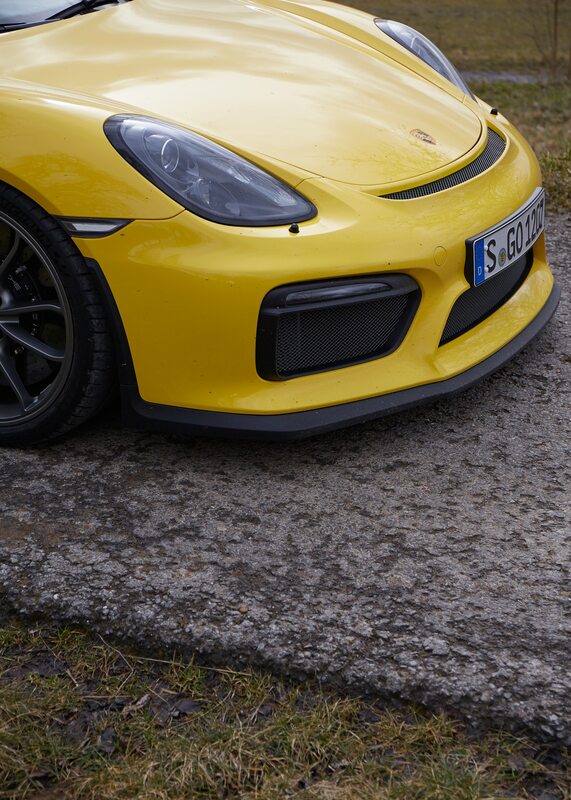 Ready to scare the locals? 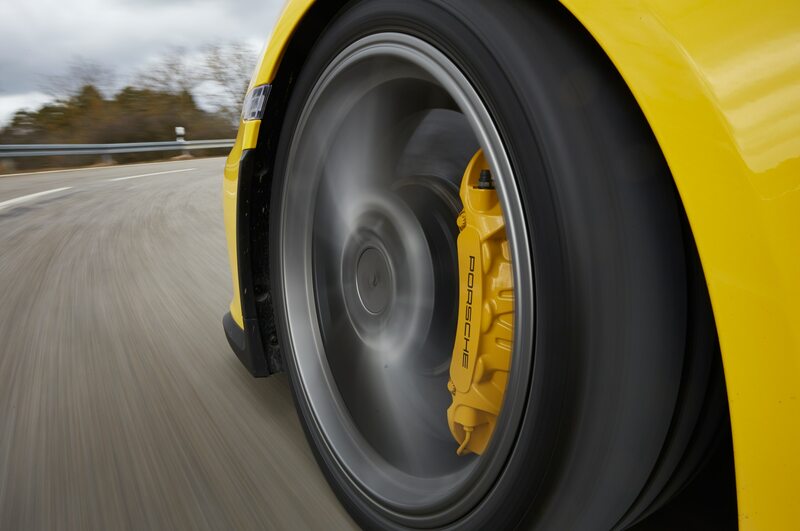 Select second gear, feed torque well before the apex, tighten the line, and boot it. 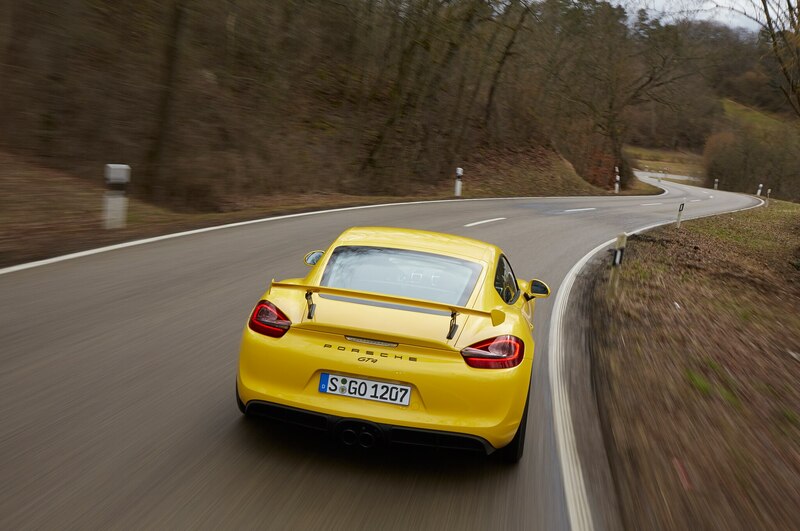 What follows is an exhilarating blend of fast forward and slow motion. 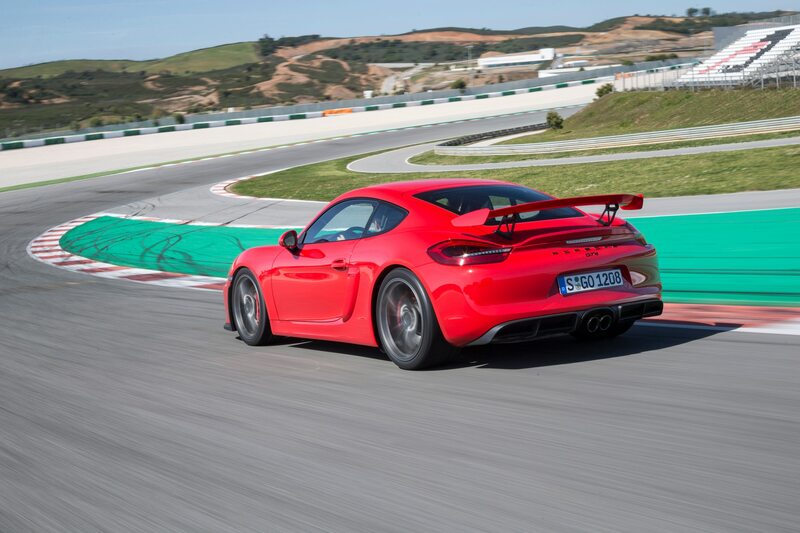 The rear tires, which stay superglued to the pavement with the electronic nannies on, now feel more like sticky licorice, never snapping but allowing a progressive slide before they grab hold once more and pull the tail back in line. 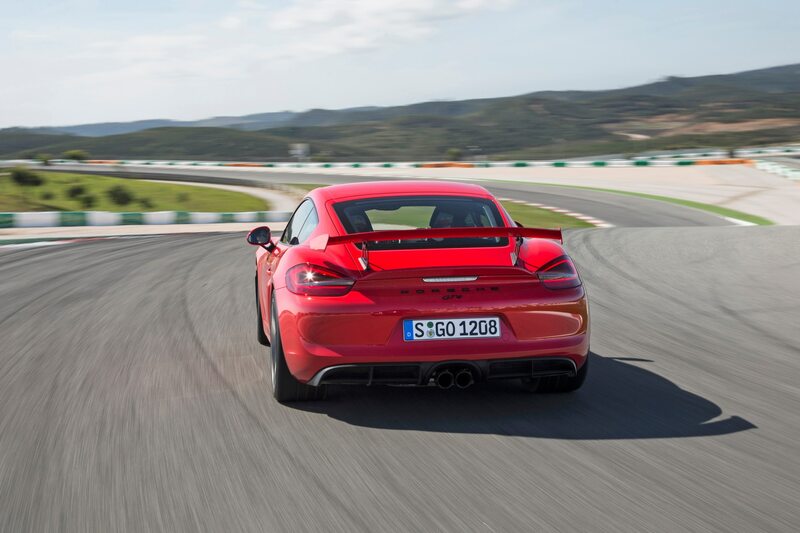 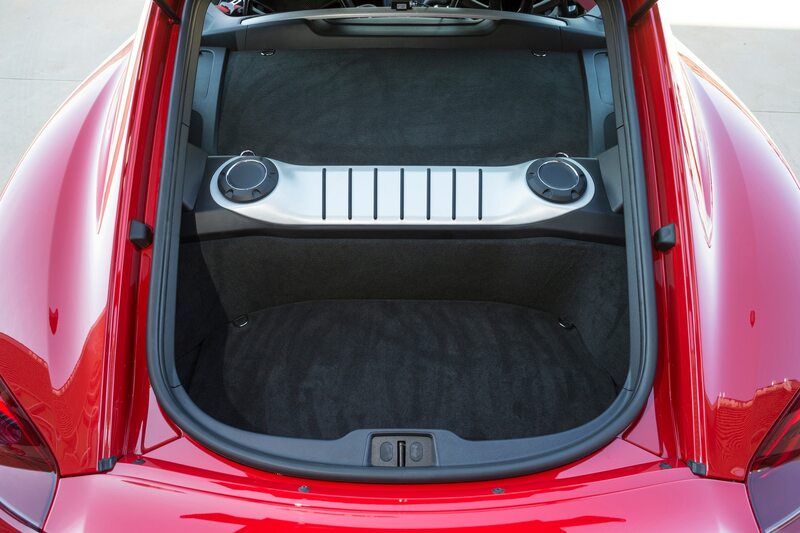 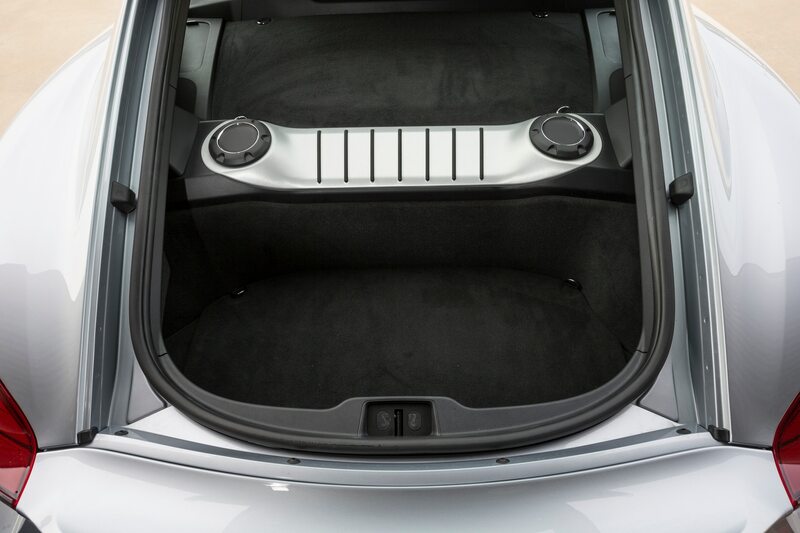 Helping the car to behave this way is a new, forged aluminum rear suspension. 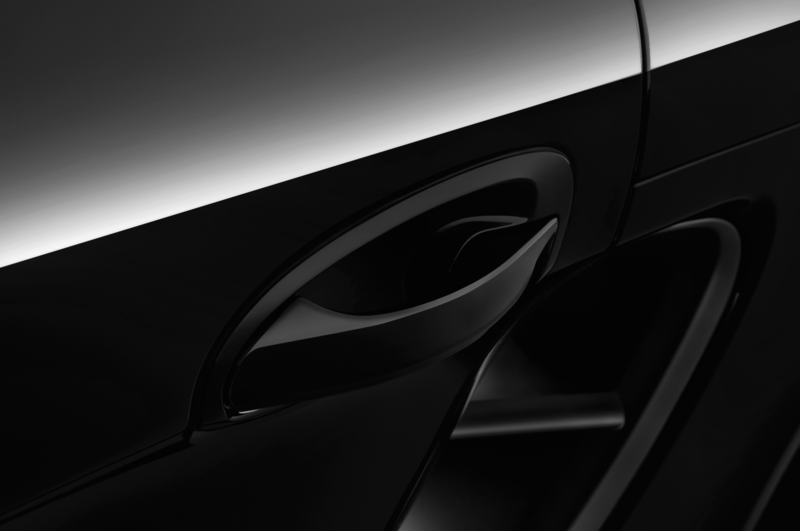 It has so-called helper springs to preload the main springs under full rebound. 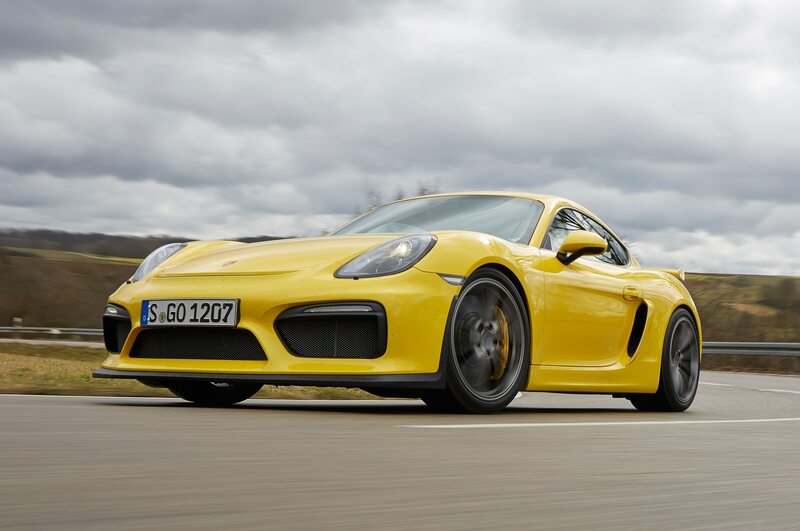 A BMW M4 may be more lurid, and a GT3 is more dramatic overall, but the GT4 beats both in the prompt and fuss-free manner it puts the power down, and the graceful way it retains its balance. 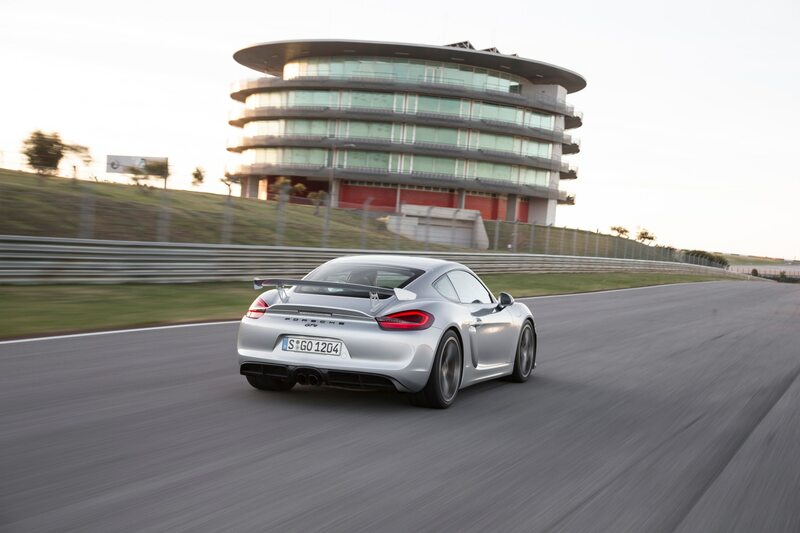 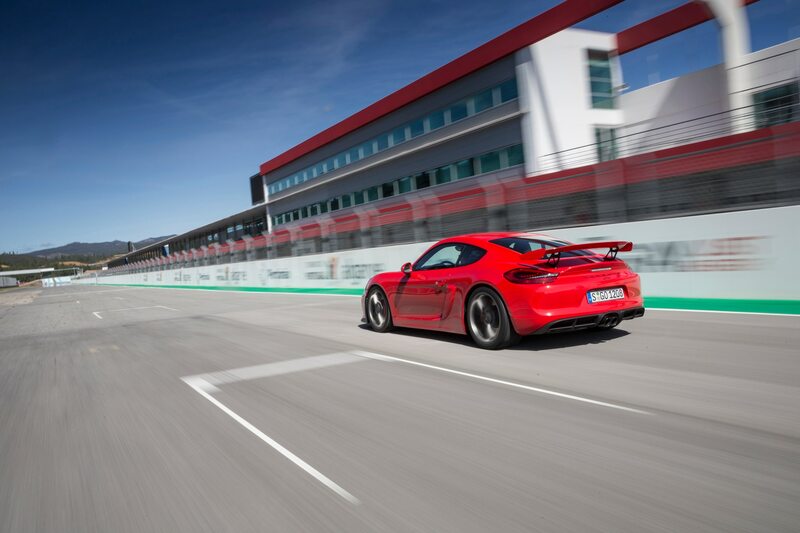 It takes this kind of no-nonsense dynamic efficiency to lap the ’Ring in 7 minutes, 40 seconds. 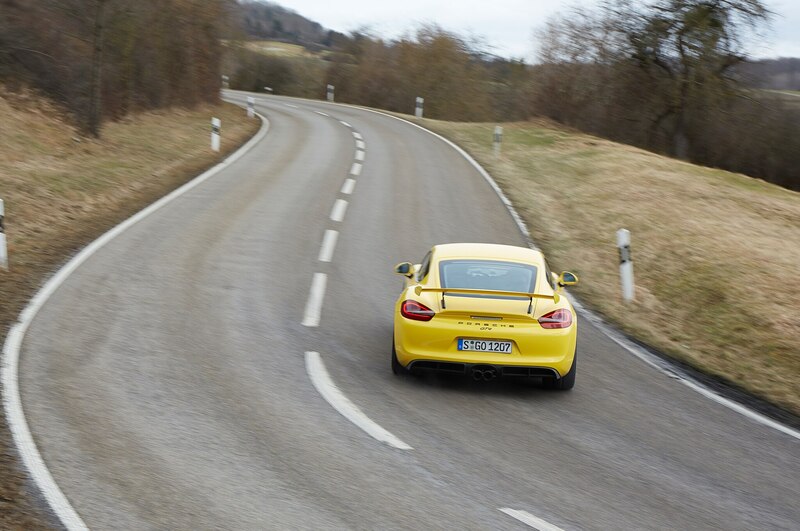 A late-afternoon blast back from the Black Forest foothills to the Zuffenhausen HQ was one of those truly memorable experiences you can, for legal reasons, only talk about in detail with close friends. 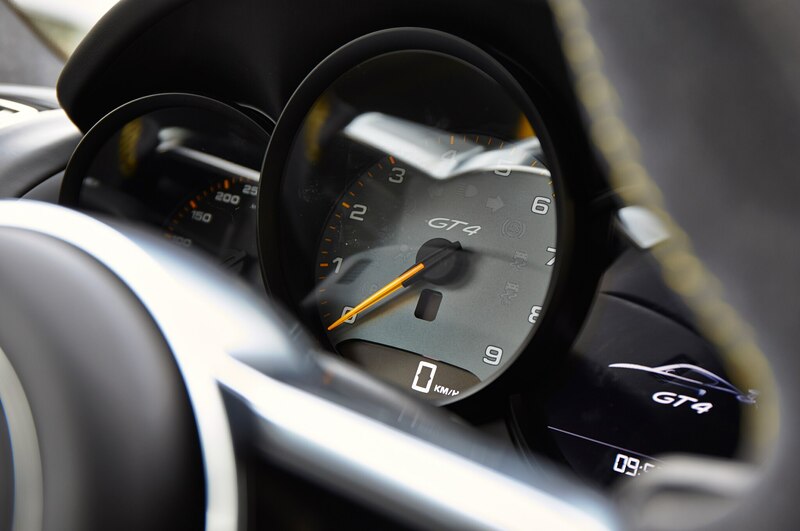 The engine never seems to run out of revs, and when it eventually does, chances are you are about to run out of road. 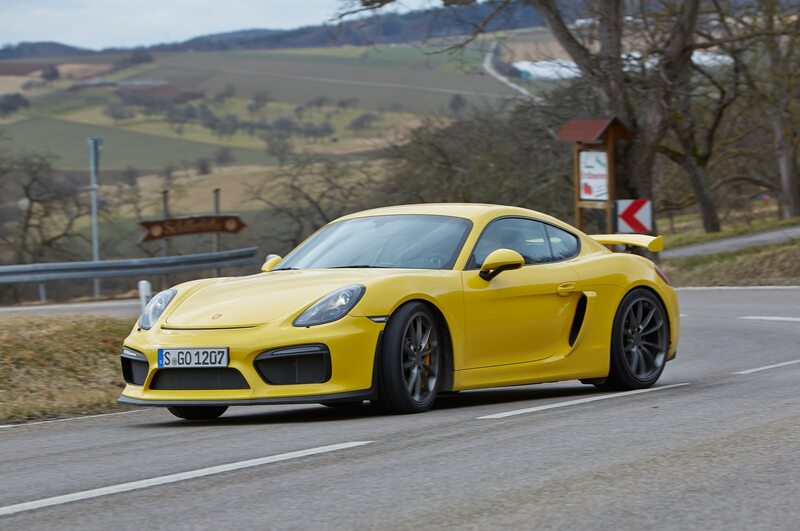 The impatient mid- to high-end urge is vaguely reminiscent of a big bore V-8, but thankfully the soundtrack still clearly identifies it as a flat-six. 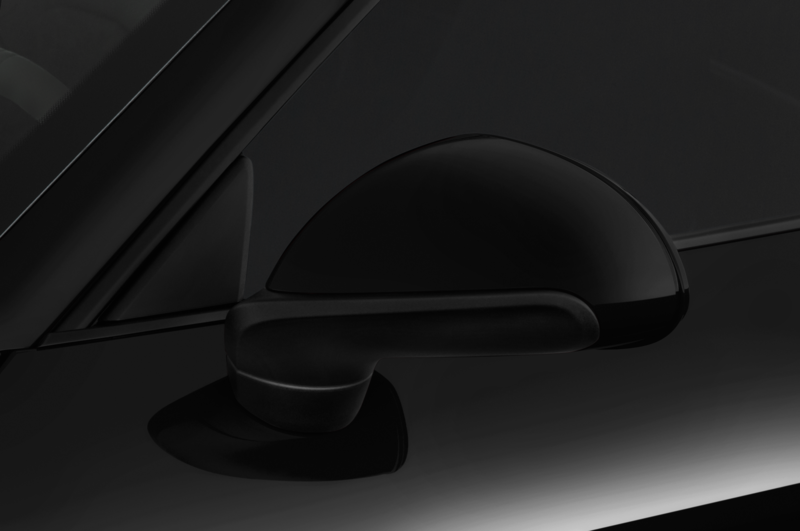 All the controls are perfectly weighted. 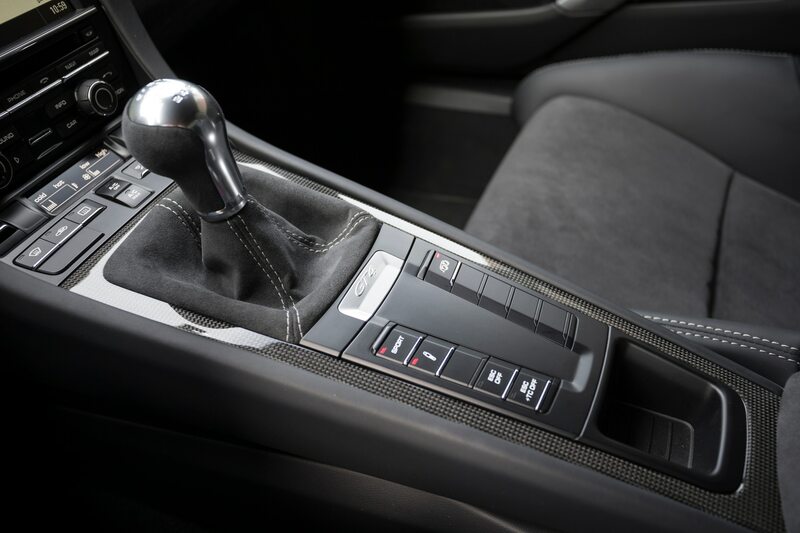 The gearbox, although not quite Honda smooth, has nice short throws. 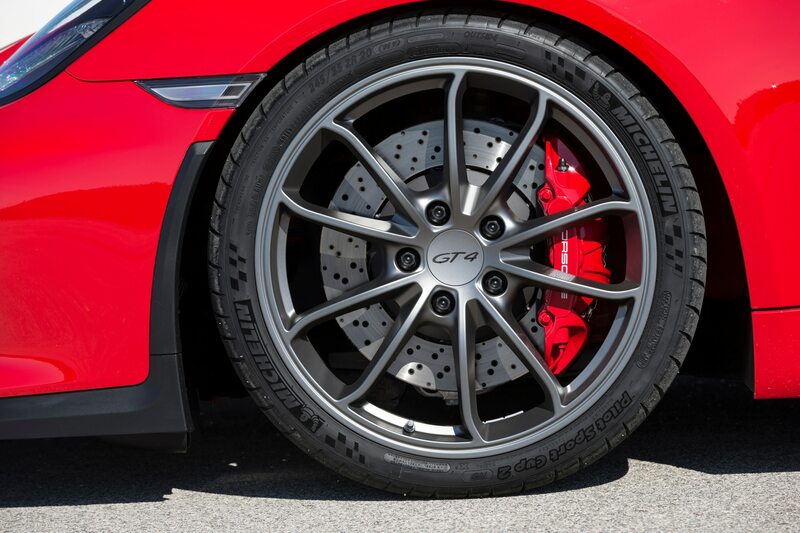 Optional carbon-ceramic rotors cost a king’s ransom ($7,400, to be precise) but are equal to at least 50 hp for the way they let you drop the hammer way late in turns. 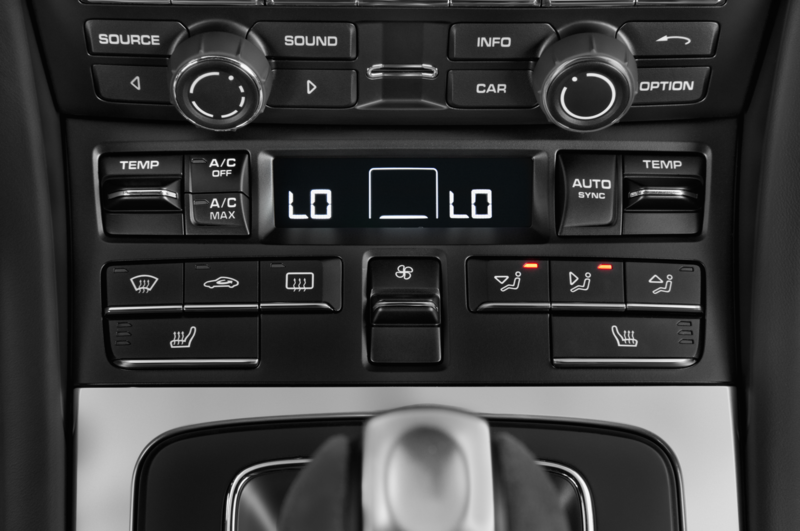 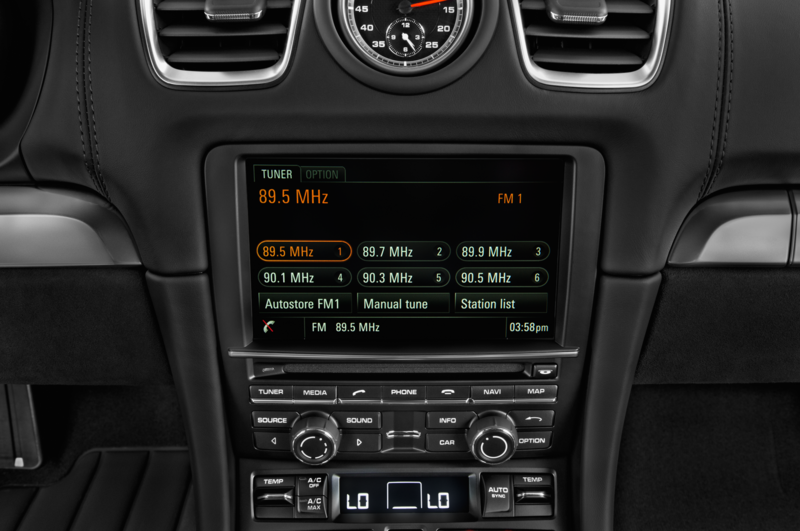 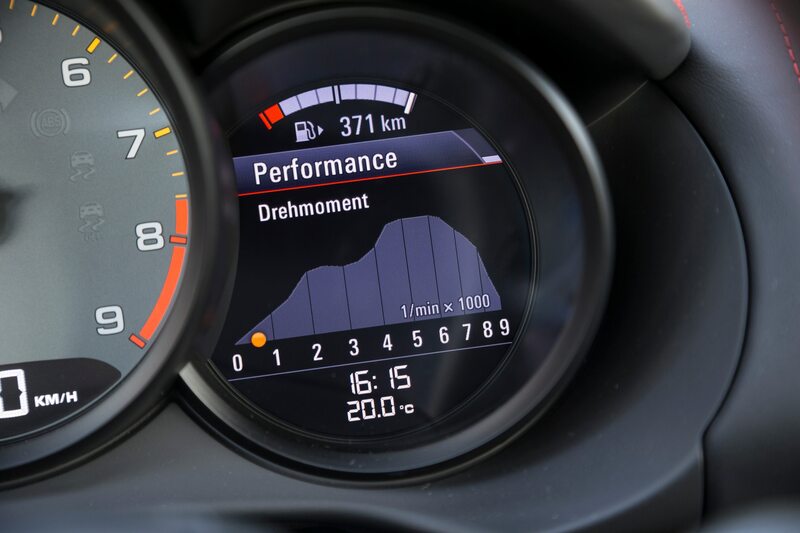 The list of performance-related options is pleasantly short, for a Porsche. 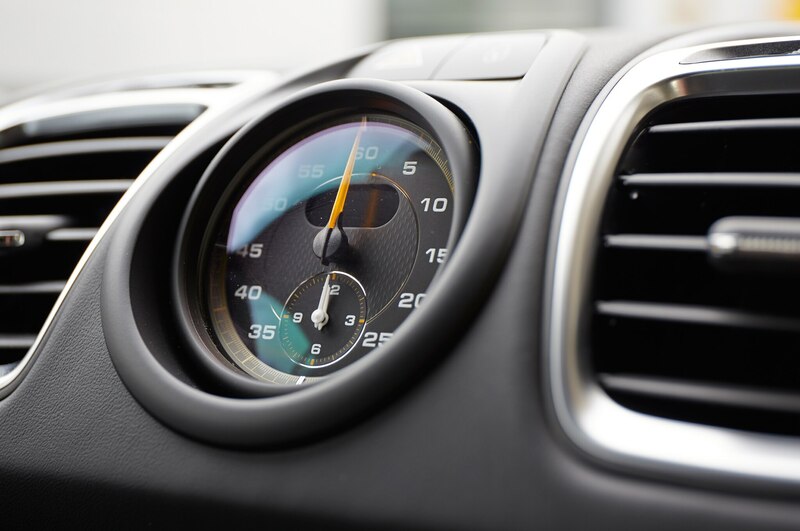 “We spent 24 months to define the optimum DNA, and it makes no sense at all to let the customer tweak it,” explains Preuninger. 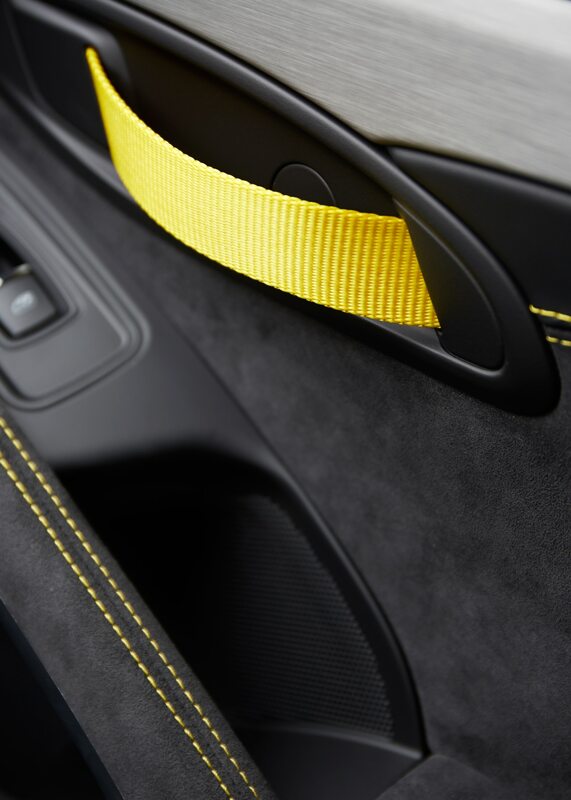 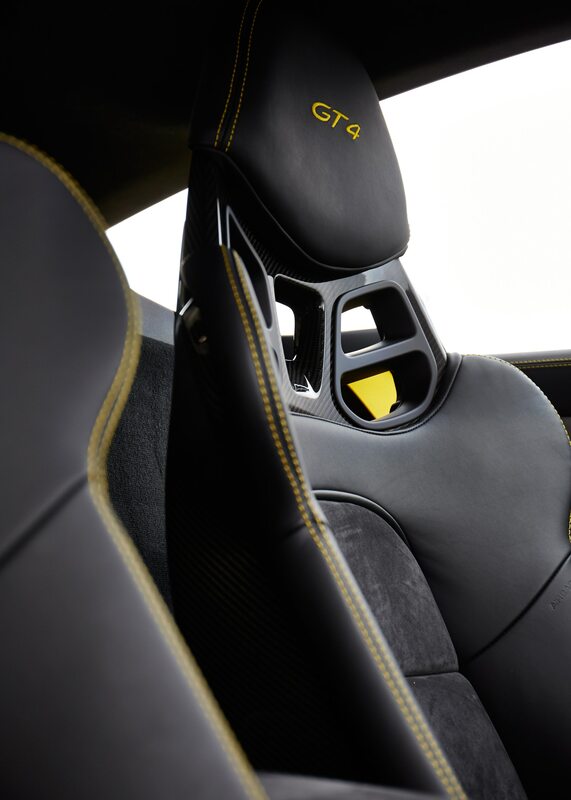 You can still throw money at look-at-me goodies, like our test car’s $2,590 leather and Alcantara interior with yellow stitching. 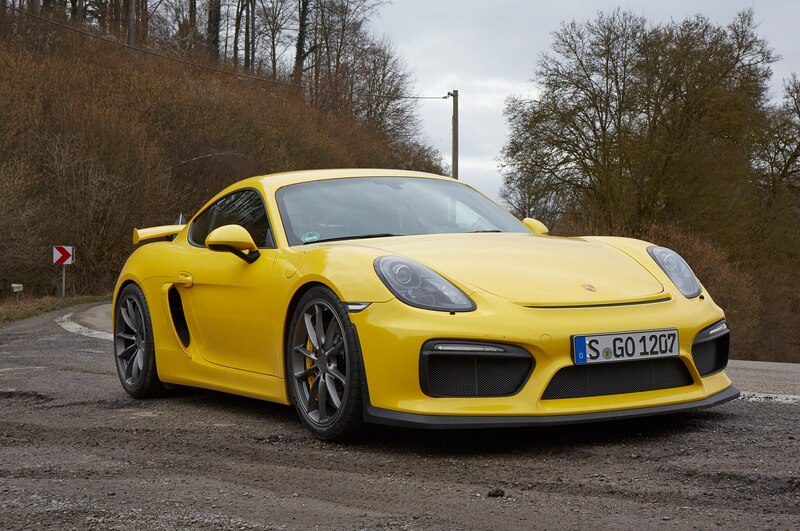 Overall, though, this is as close to a bargain Porsche as they come. 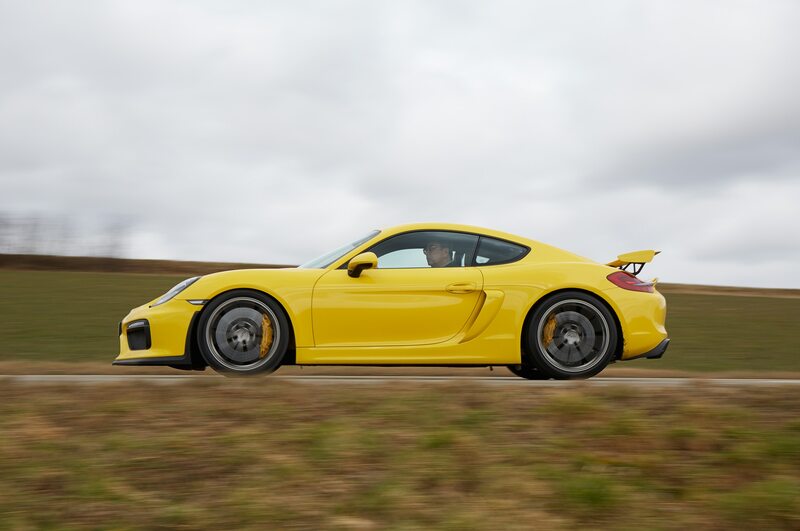 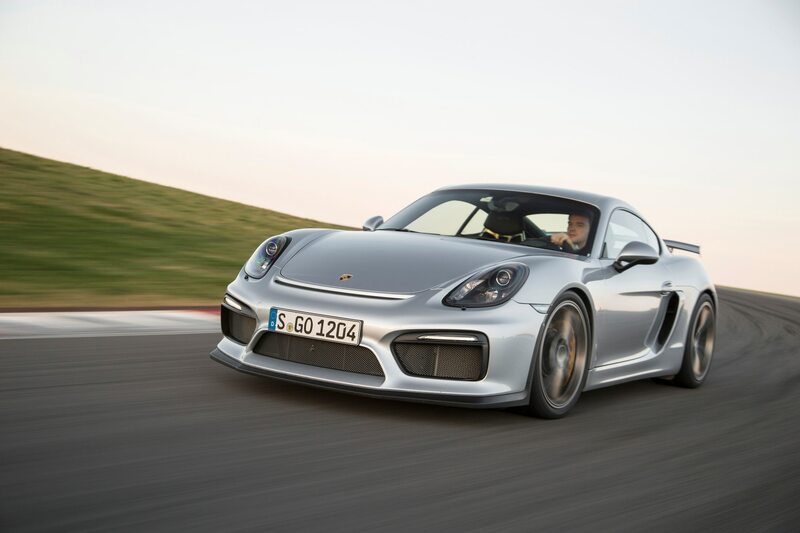 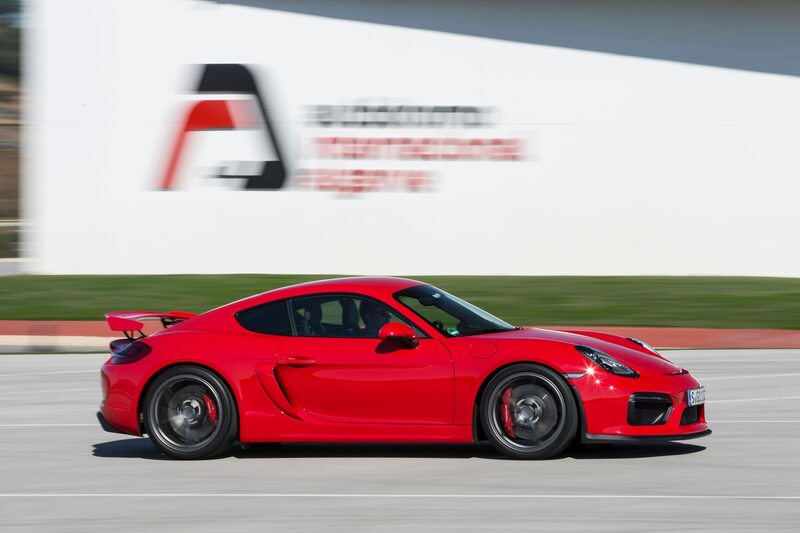 Starting for $85,595, the GT4 is about $10,000 more than the Cayman GTS, but it undercuts its closest in-house rival, the 911 GTS, by around $30,000. 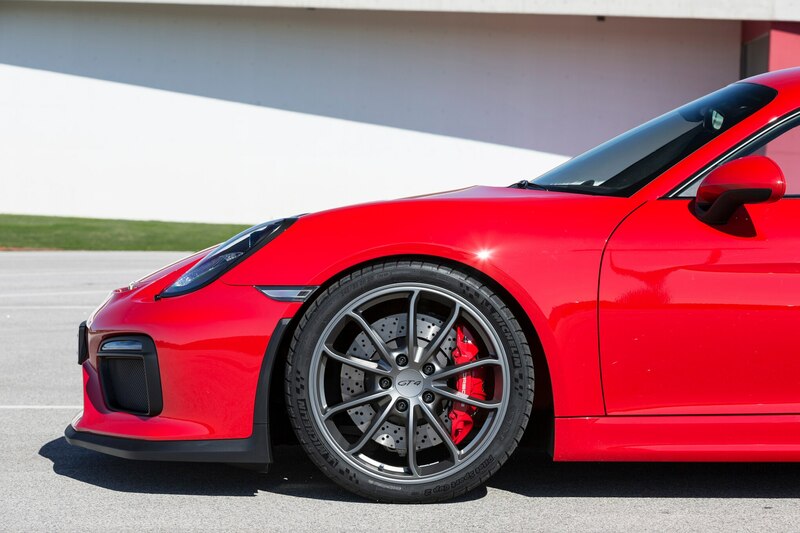 Not a bad deal, but you’d better act fast. 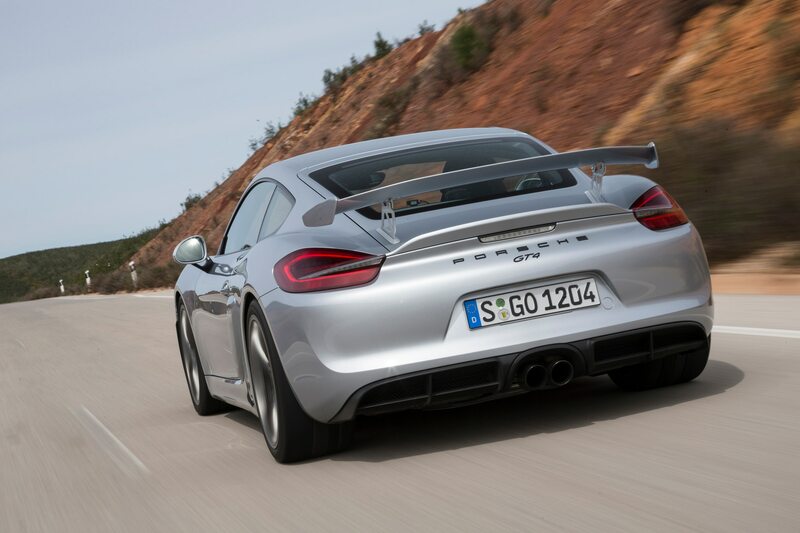 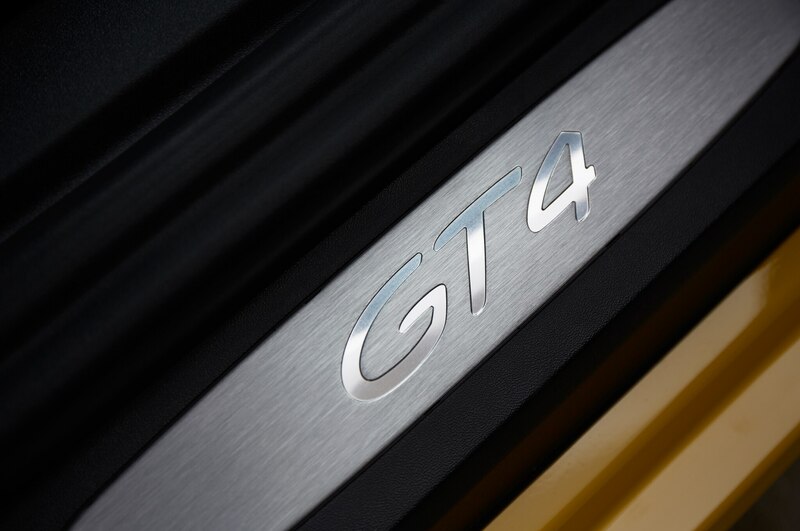 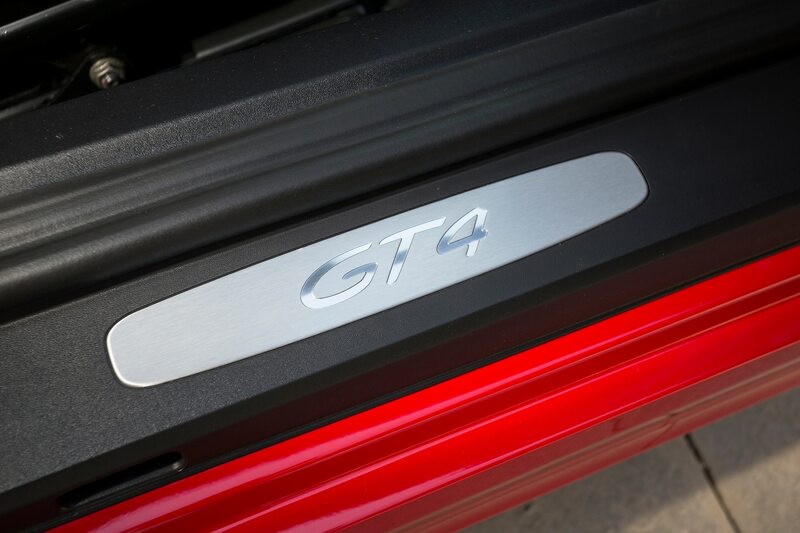 Fewer than 1,000 GT4s are coming to the United States. 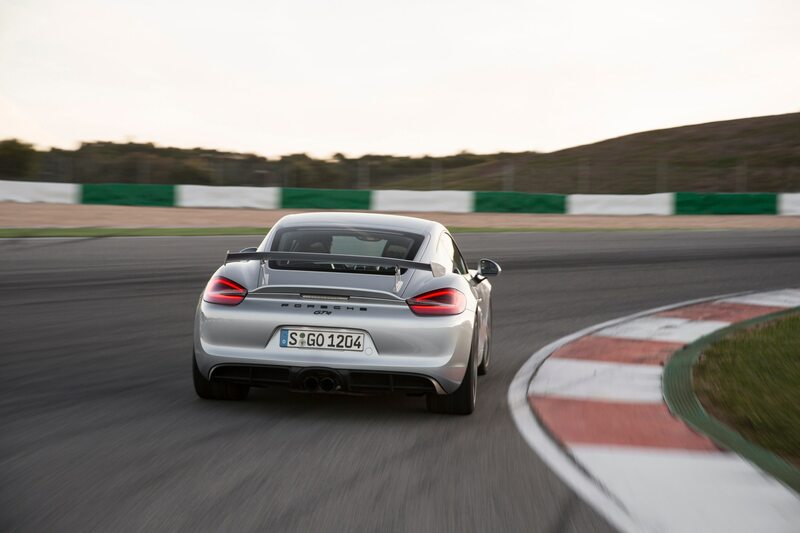 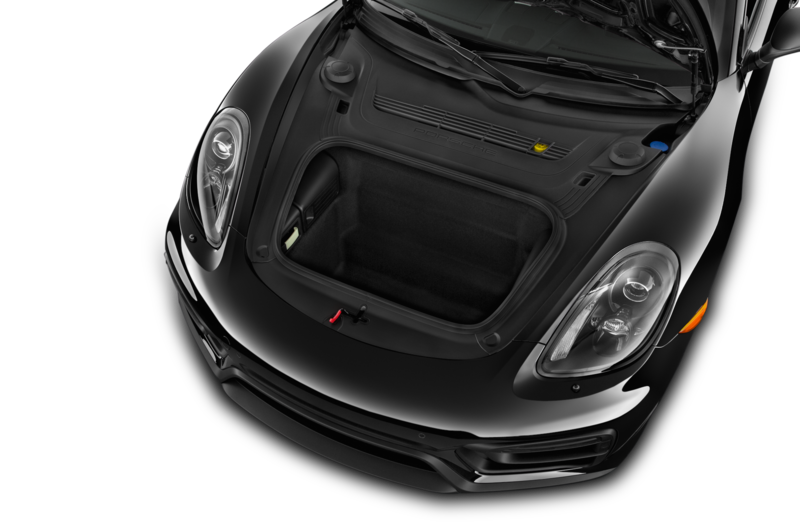 Those who miss out might want to put their name down for the 2016 Boxster Spyder, which gets a 375-hp engine with a manual transmission but none of the chassis parts that make the GT4 so special. 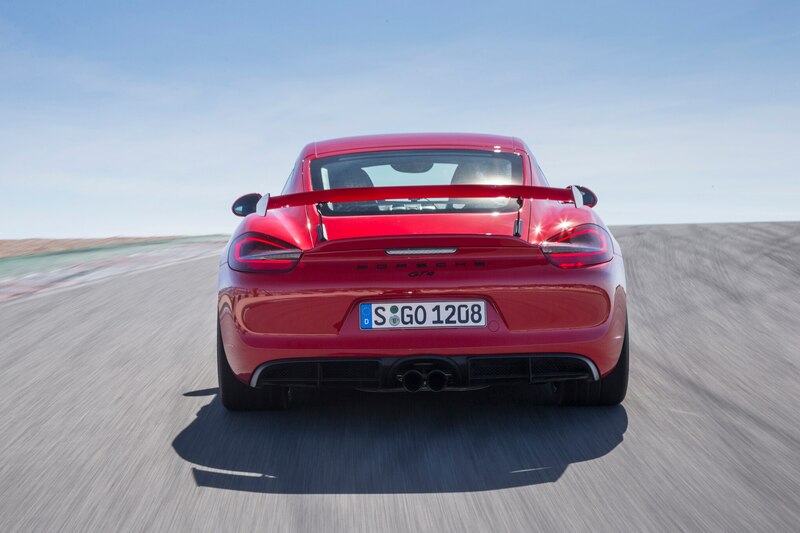 “Special” is an overused word, but appropriate here. 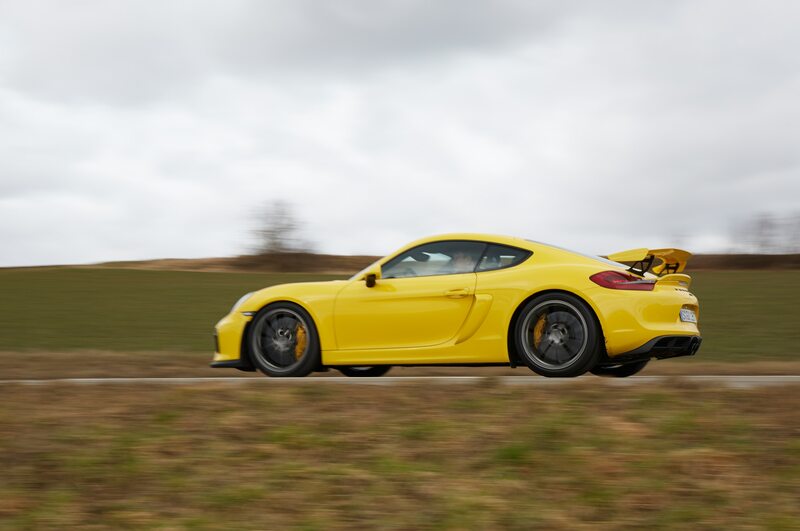 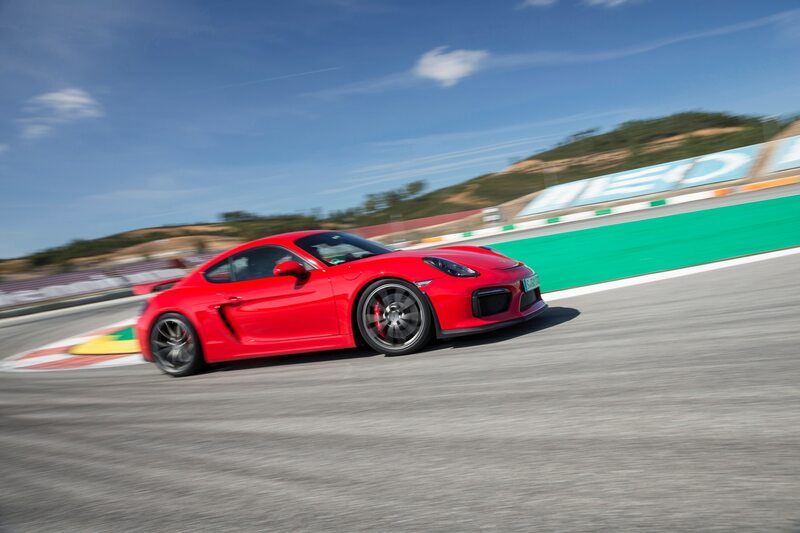 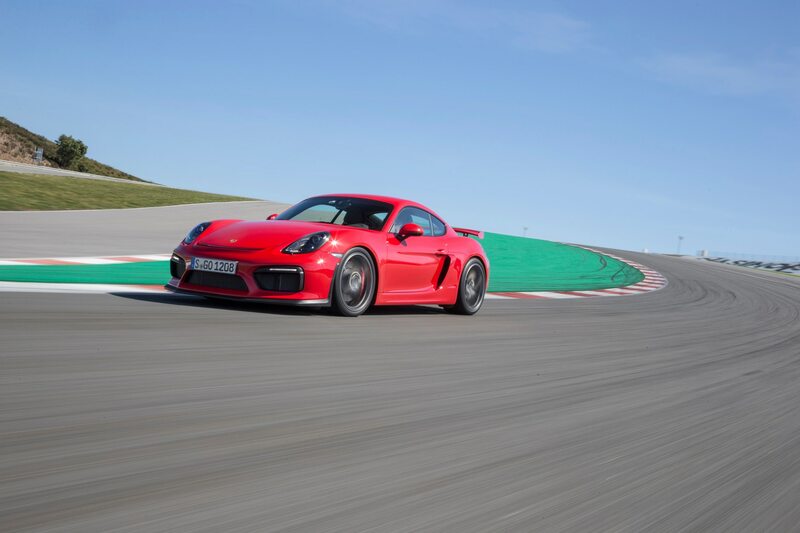 In contrast to so many over-engineered, oversexed, and overpriced high-performance competitors, the Cayman GT4 is accessible in more ways than one as well as sensationally capable. 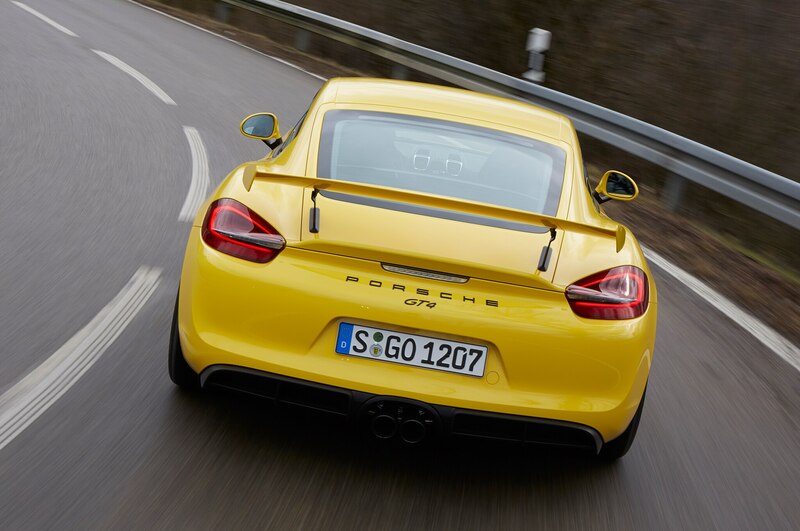 We want one.